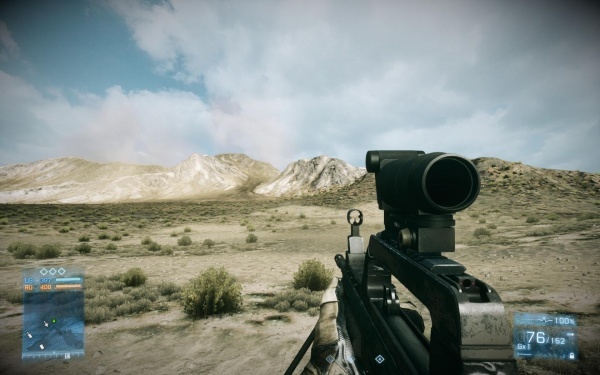 The [[Accuracy International AWM|Accuracy International AWM-F]] is included in the ''Back to Karkand'' expansion pack as the "L96", and can be used by the Recon kit. 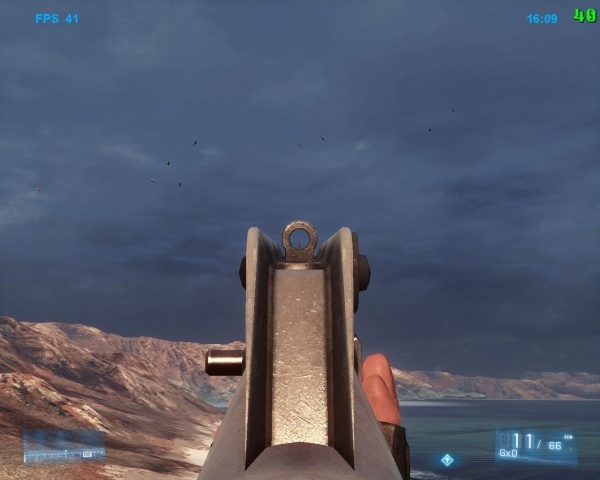 True to its reputation, the gun is extremely accurate at long ranges, with minimal bullet drop allowing for precise headshots. Its ballistics are modeled after the L96A1's 7.62 NATO chambering rather the the AW Magnum's .338 Lapua. 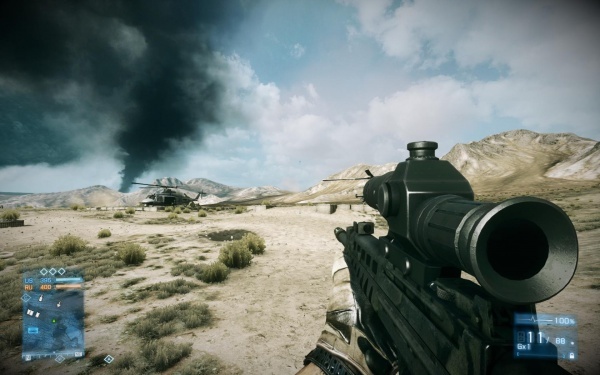 The [[Accuracy International AWM|Accuracy International AWM-F]] is included in the ''Back to Karkand'' expansion pack as the "L96" (the British designation of the Accuracy Internation Precision Marksman; the actual British designation of the AWM is L115A3), and can be used by the Recon kit. True to its reputation, the gun is extremely accurate at long ranges, with minimal bullet drop allowing for precise headshots. Its ballistics are modeled after the L96A1's 7.62 NATO chambering rather the the AW Magnum's .338 Lapua. 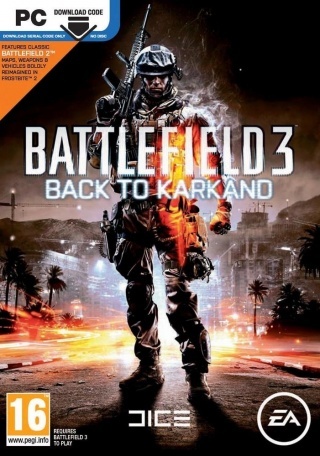 Battlefield 3: Back to Karkand (2011) DLC. 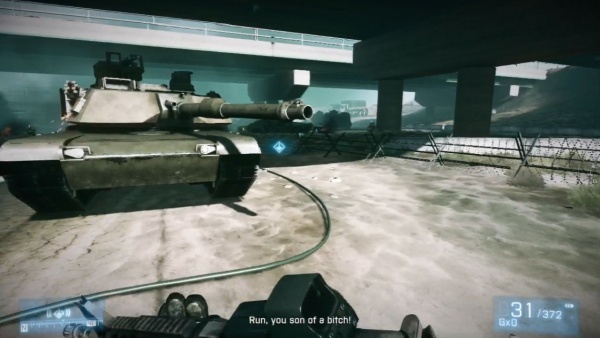 Battlefield 3: Close Quarters (2012) DLC. 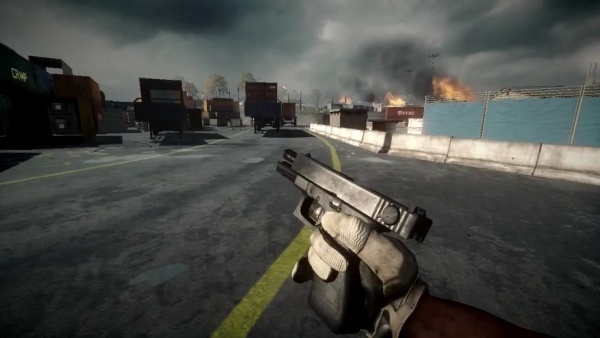 In the beginning of the single-player mission "Semper Fidelis" and "The Great Destroyer", Blackburn acquires a Beretta M9. 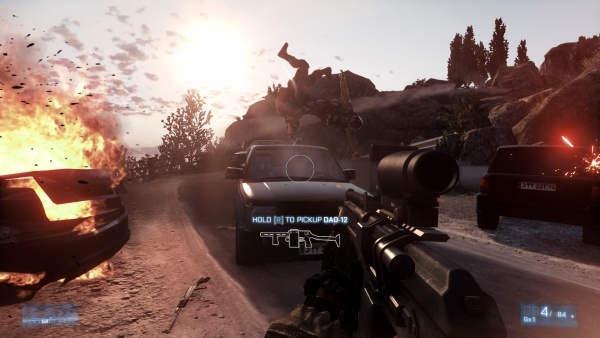 It can also be seen holstered on some US Marine throughout the single-player campaign. 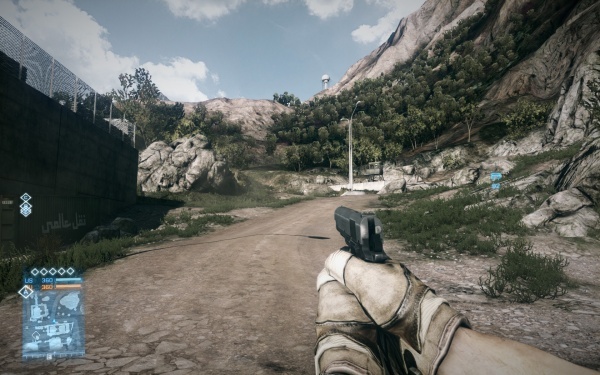 In multiplayer it is the starting handgun for US forces. 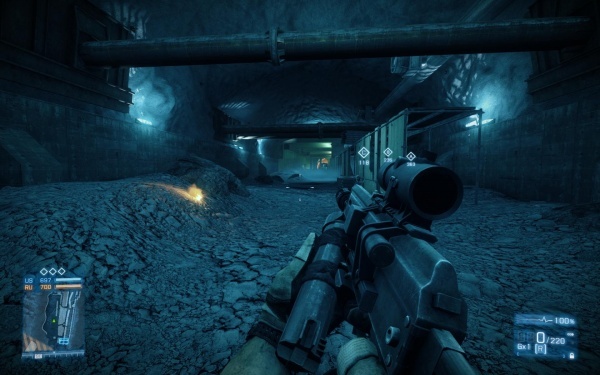 Another note of interest is that unlike in Battlefield: Bad Company 2 and Medal of Honor's multiplayer, the M9's magazine is 15 rounds + 1 in the chamber like in reality. 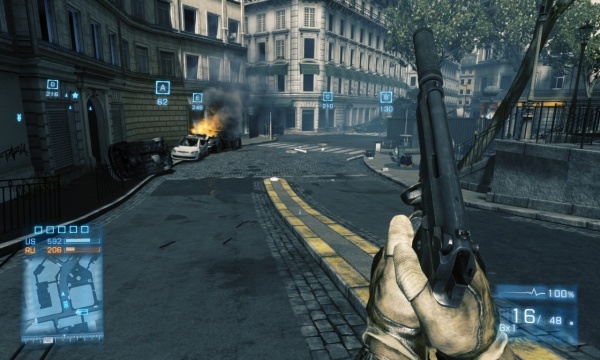 In multiplayer, Players can unlock additional M9's outfitted with a Tactical Light and a Sound Suppressor separately as they level (rank) up. 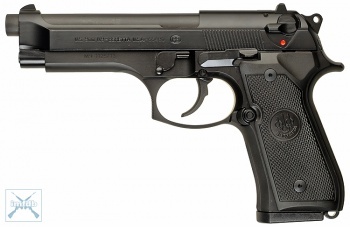 The M9's model is also modified to be the "93R" in the game. 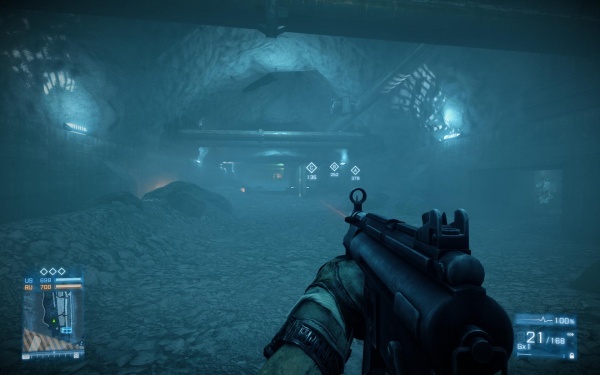 The weapon is given a 93R's muzzle brake and folding foregrip, as well as being able to fire 3-round bursts, and uses 20 round magazines, can be unlocked as a sidearm in Co-Op requiring a 86,000 Co-Op Score. 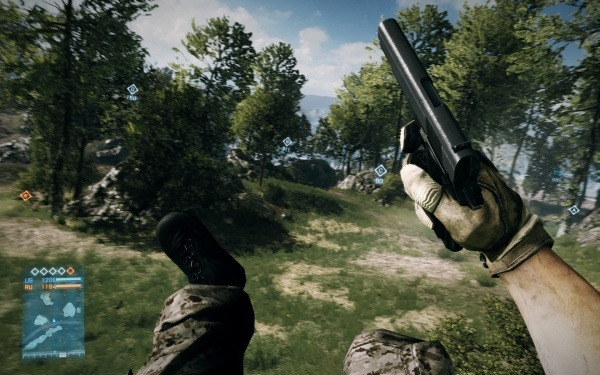 The USMC variant of the M1911, the M45, can be used if the player is a Battlefield Veteran or a member of the EA Gun Club. 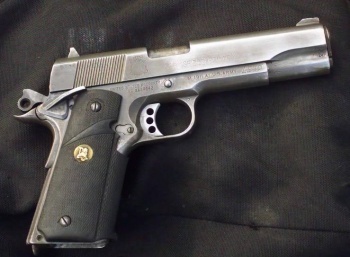 It is a standard M1911A1 with a three-hole trigger, a Springfield slide, commander-style hammer, beavertail grip safety, Pachmayr rubber grips, and uses 8 round magazines. 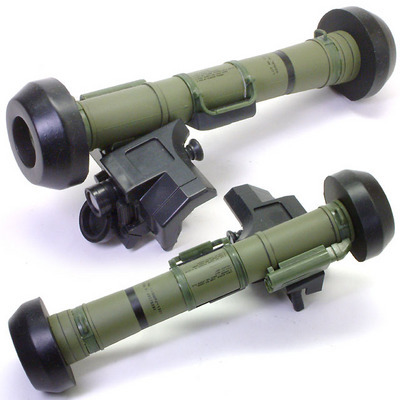 It comes with additional variants that incorporate a Tactical Flashlight or Sound Suppressor. 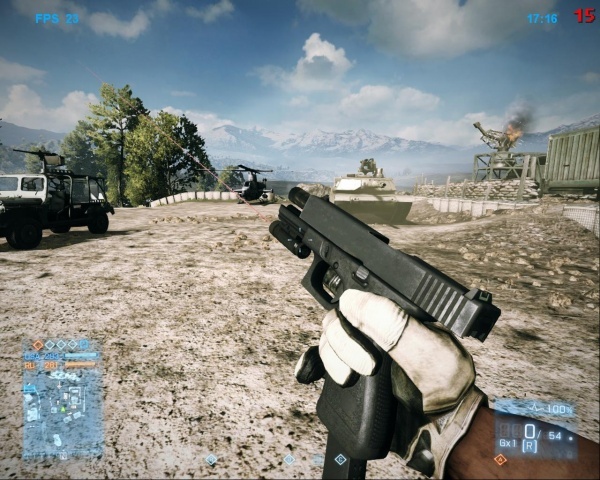 A variant with both aforementioned attachments (named M1911 S-TAC) exist, but prior to the release of the End Game DLC, it was available only to DICE employees. For those with the DLC, a series of assignments need to be completed in order to unlock a final assignment, called "All about precision". 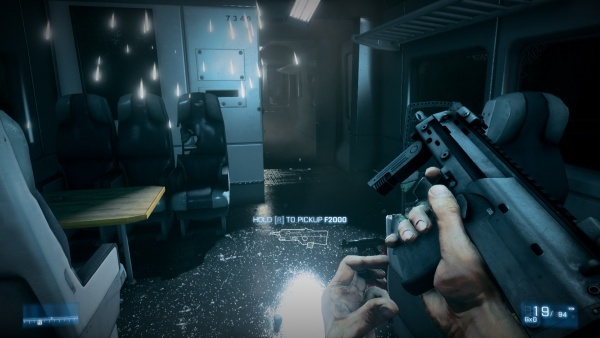 After completing it (which require 20 headshots with pistols), the pistol is unlocked. 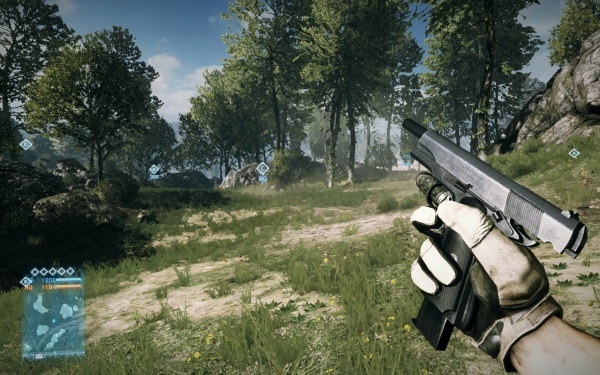 The MEU(SOC) has its own unique reload animation, while all the other pistols use another generic animation. Here the magazine is ejected. Note the incorrect curved mainspring housing. Also note the A1 style safety, which is also incorrect. 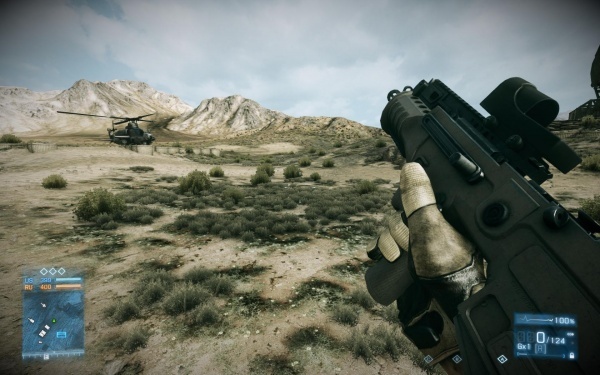 The H&K UMP45 can be used by all four classes, and has an ammo capacity of 25 + 1. 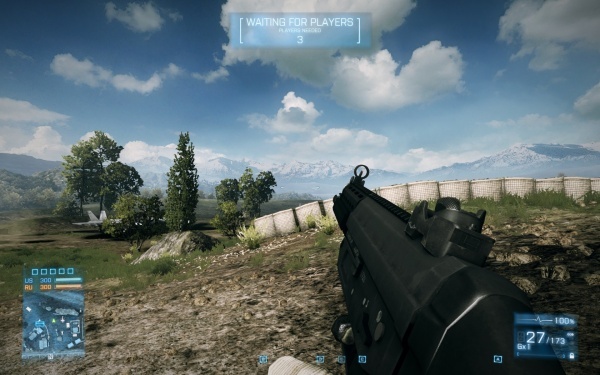 The game correctly depicts the UMP's single / 2 round burst / full auto firing modes. 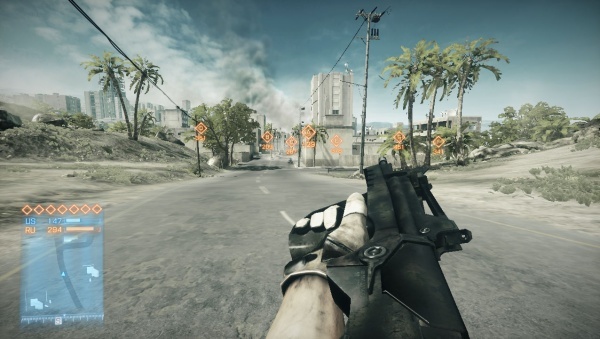 The MP5KA4 is added to BF3 via Close Quarters DLC, called M5K in BF3, comes standard with a 15 round magazine that incorrectly holds 20 rounds. 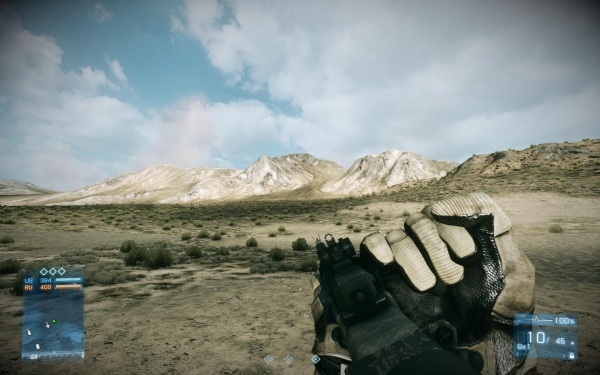 However, the Extended Mags attachment gives it a 30 round magazine with the correct ammo count. 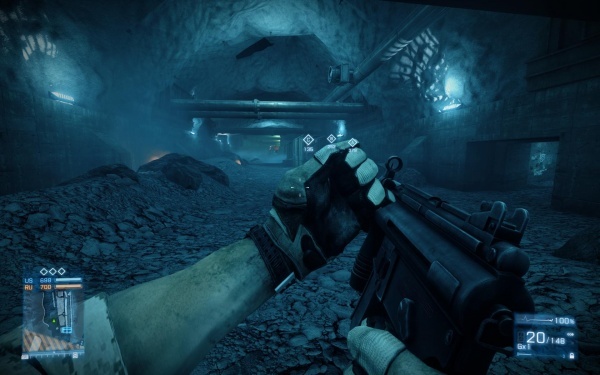 Note that in Battlelog, its render is a MP5KN with the fire selector on safe, but in-game it is a MP5KA4 with the fire selector on full-auto. 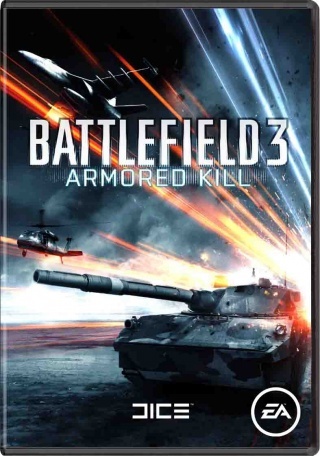 A correct three-round burst mode was added in a patch around the time of release for the Armored Kill expansion. 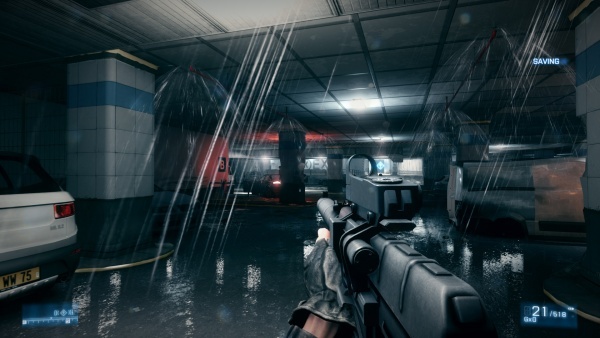 The SPAS-12 is one of the 10 guns appearing in the Close Quarters expansion pack. Despite having a fire selector, it is limited to pump action for balance reasons. It performs similarly to the 870MCS and has the same standard (4+1) and extended (6+1) capacities, but has a slower per-shell reload speed and each shell contains one less pellet than those of the 870. 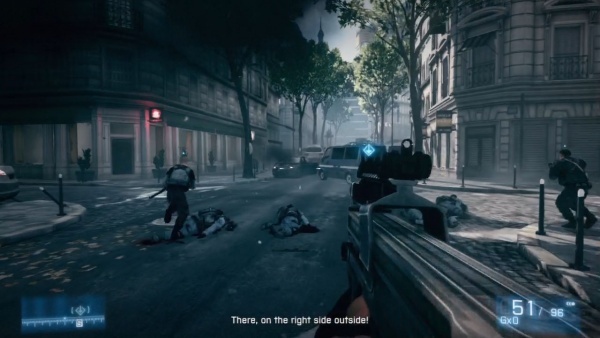 However, it's offset by a maximum rate of fire that is high enough to the point that the next shot can be fired way before the pump animation can finish, specifically at the brief moment where the action is fully to the rear. 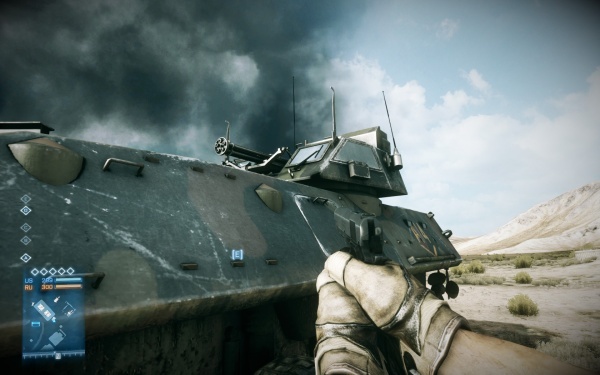 The SPAS is also one of the strangest weapons to appear on a different weapon's Dog Tag; it appears on the Dog Tag awarded for 100 kills with the USAS-12. 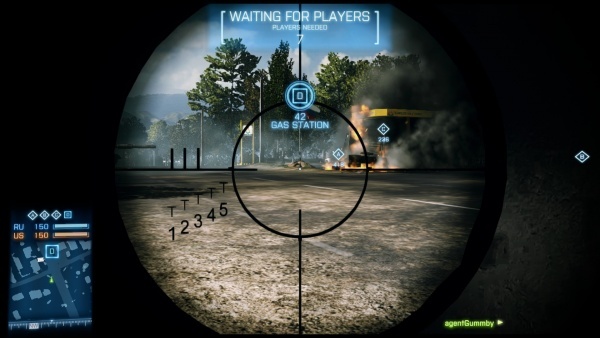 Other than four capital letters followed by "-12", both being 12-gauge, and that they were both in the Battlefield: Bad Company series, they have little in common. 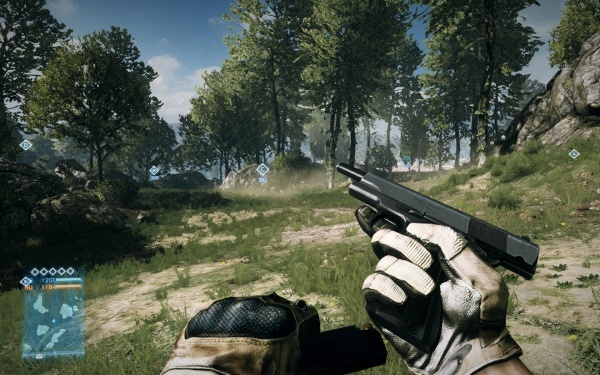 The Close Quarters DLC, which adds the SPAS-12, still has the USAS-12 displaying a SPAS-12 Dog Tag. ...and inserts the shells one at a time via the loading gate. Note "12 GAUGE" and a fragmentation symbol visible on the shells. 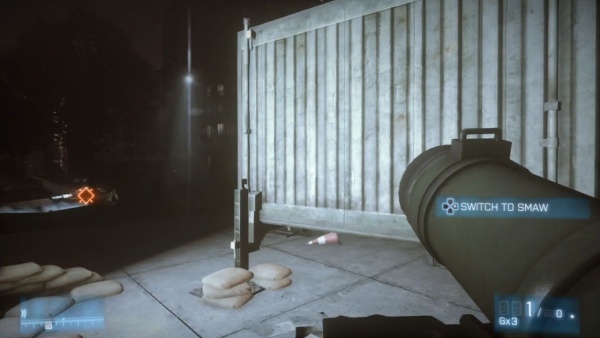 At the start of an empty reload, the character winds the drum before loading it. 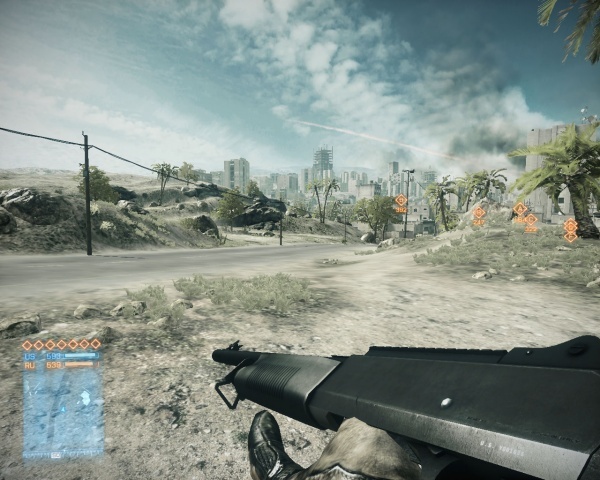 The USAS-12 is the only full-auto shotgun in-game, barring the MK3A1 Jackhammer in Back to Karkand. The magazine capacity is incorrectly 6+1 by standard or the correct 10+1 with the extended magazines equipped, most likely for balance, same as the Striker. 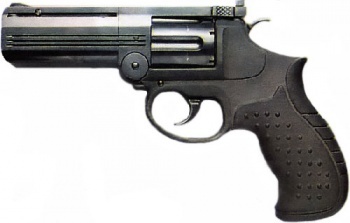 When optics are attached it becomes modeled after a WM-12, an American semi-auto clone of the USAS-12, but with a rail instead of the carry handle. Like all shotguns, it can utilise standard Buckshot, Slugs, Flechettes and explosive FRAG-12 rounds as well as fit a variety of accessories and attachments. 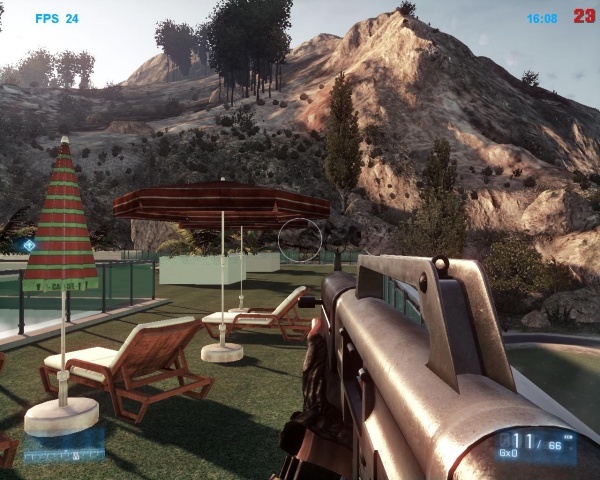 The player character holds a USAS-12, vowing that nobody will take the last sun lounger from him. 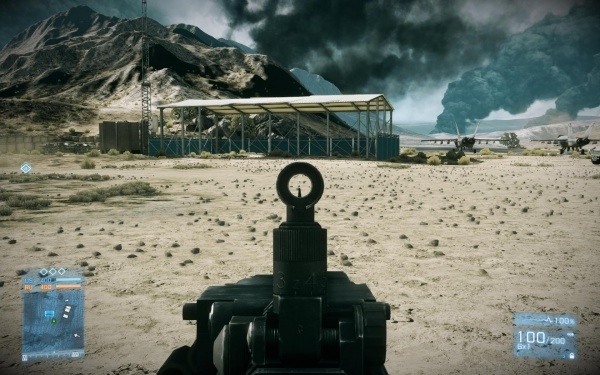 Iron sights of the USAS-12. Dmitri Mayakovsky reloads his USAS-12, which, according to the trademarks, was made by "Baewoo Brecisions" of Korea. 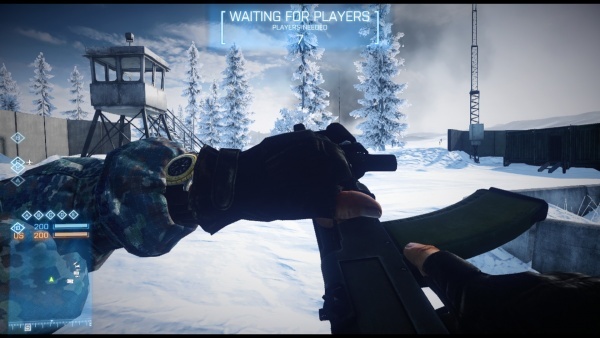 After replacing the magazine, the player character pulls on the charging handle. Note the deserted left side dust cover, compared to the image above. 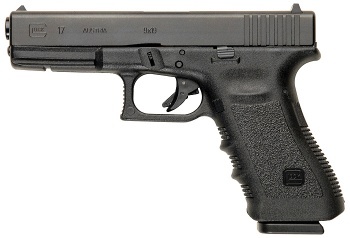 Icon and world model for the USAS-12. Note that the world model has no sights and no magazine. The 5.56A-91 appears as part of the incredibly vague "Compact Assault Rifle" classification, and thus is used by the 'Engineer' kit. It does not have its 40mm grenade launcher. It is the successor to the 9A-91 from Bad Company 2, albeit firing the 5.56mm NATO round instead of the 9A-91's 9x39mm one. 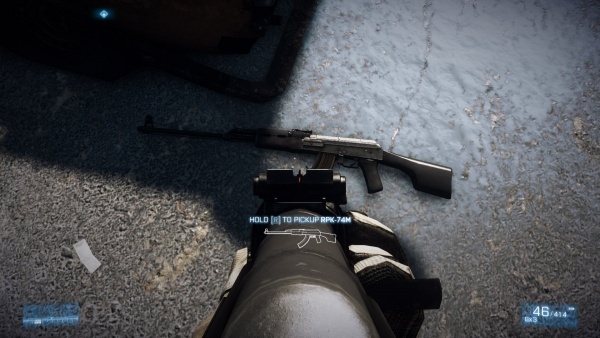 Called "A-91" in the game, which refers to the 7.62x39mm variant. Dmitri Mayakovsky looks at fellow GRU agent Vladimir holding a 5.56A-91 as they go to work at the start of "Comrades." 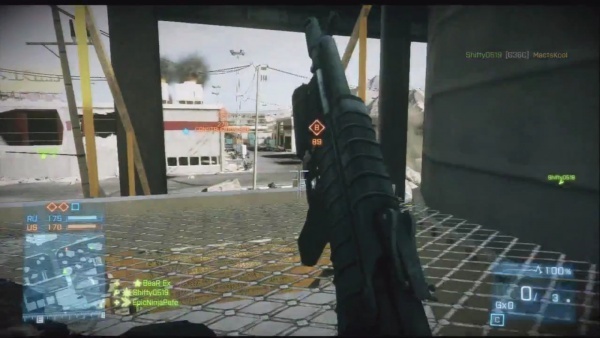 The AEK-971 is an unlock for the Assault kit. If the M320 is selected and mounted on the weapon, it will instead be a GP-30, though if set to standalone, will still be an M320. 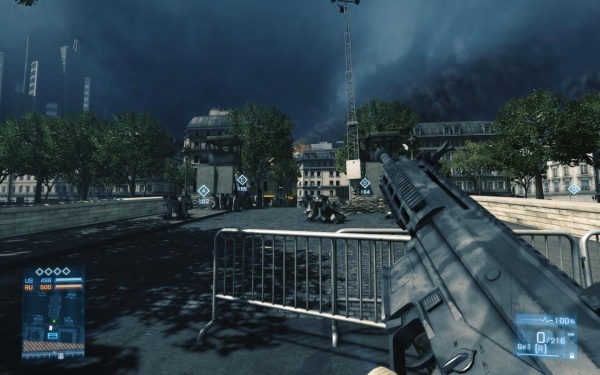 It cannot mount the M26 MASS due to the reload animation, a trait shared with the AN-94. 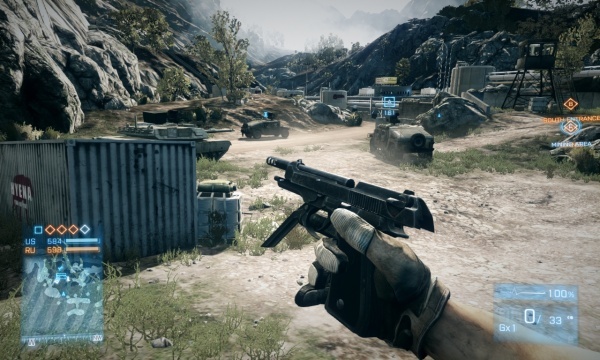 Blackburn holds an AEK-971 near the start of the mission "Uprising." 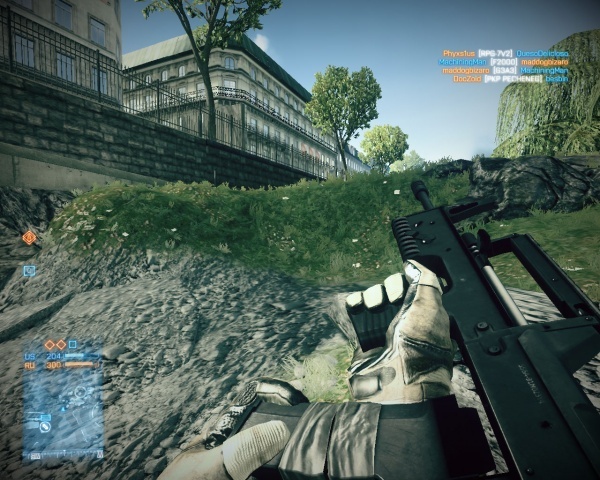 AEK-971 in Battlefield 3 with Kobra Red dot sight and foregrip attached. 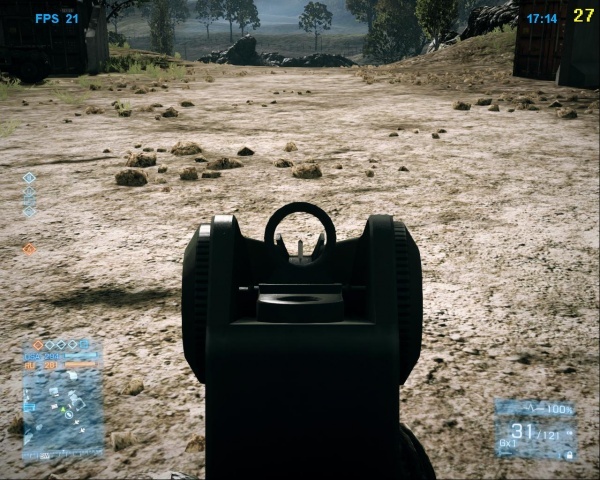 Note that because of a glitch, both the indirect flightpath crosshair and the standard crosshair appear when switching rapidly between the grenade launcher and primary weapon. Switching to secondary weapon and back again fixes this issue. 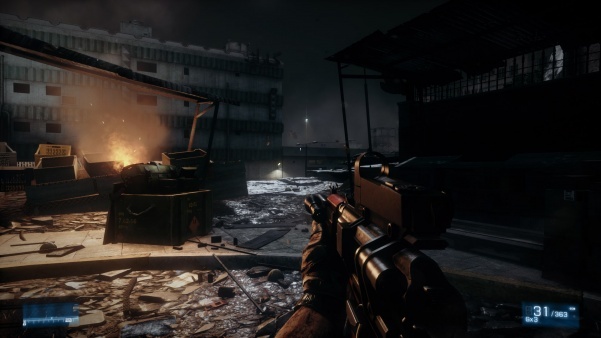 The AK-74M is the standard assault rifle used by the Russian 'Assault' kit. If the M320 is selected and mounted on the weapon, it will instead be a GP-30, though if set to standalone, will still be an M320. 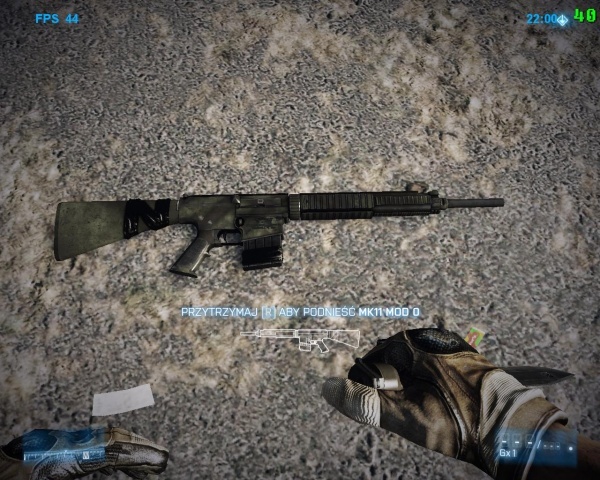 It is very accurate and has minimal recoil, but suffers from reduced damage compared to the M16A3. 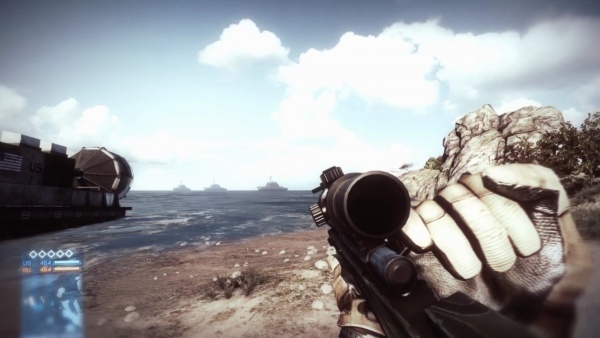 Blackburn holds an AK-74M equipped with a PSO-1 scope during "Operation Swordbreaker." 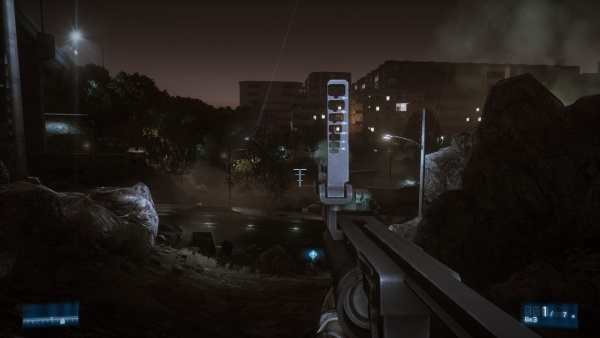 Weapons on the ground do not show their attachments or have text signifying what they have attached, meaning occasionally picking up a boring-looking vanilla weapon will result in the player character producing Excalibur as here. 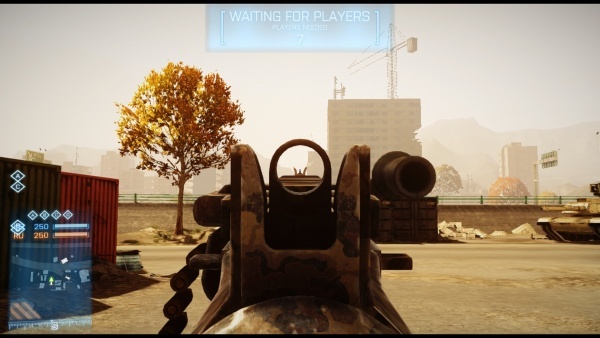 Iron sights of the AK-74M. 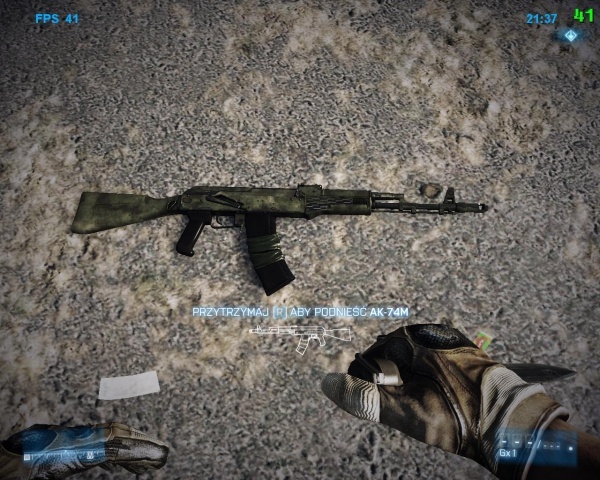 Blackburn reloads his AK-74M; note the tape grip around the magazine. 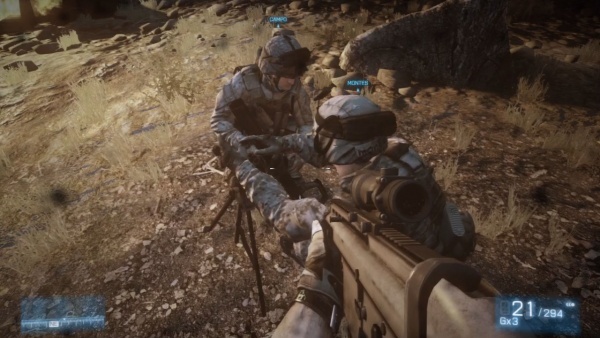 After that, he flips the weapon over and pulls on the charging handle. Icon and world model of the AK-74M. 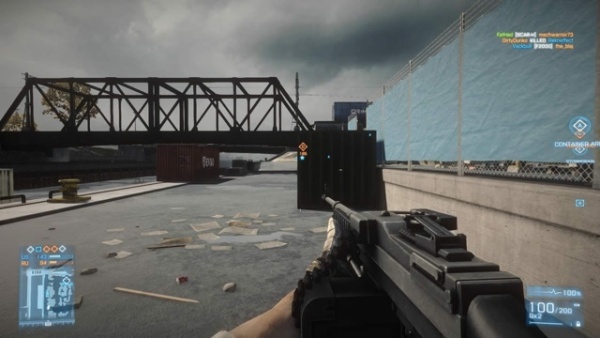 The AKS-74U has been seen in gameplay trailers. 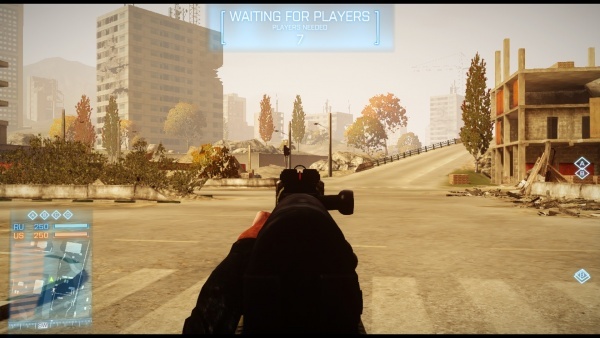 In multiplayer, the AKS-74U, being a carbine, is used by the 'Engineer' kit, and is the starting weapon for Russian Engineers. Blackburn wrestles with one of Solomon's men during the introductory mission "Semper Fidelis." 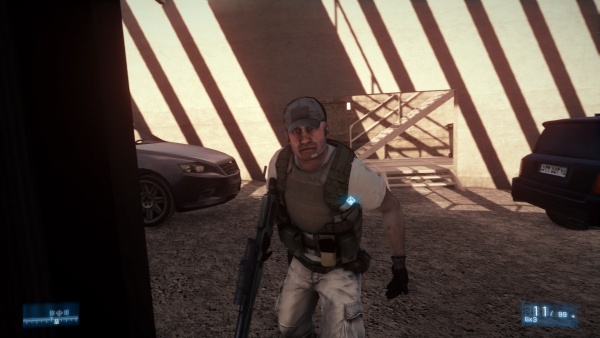 On the Xbox 360 version before the Back to Karkand update, this terrorist was instead armed with a UMP45, but still gives Blackburn an AKS-74U when he dies. 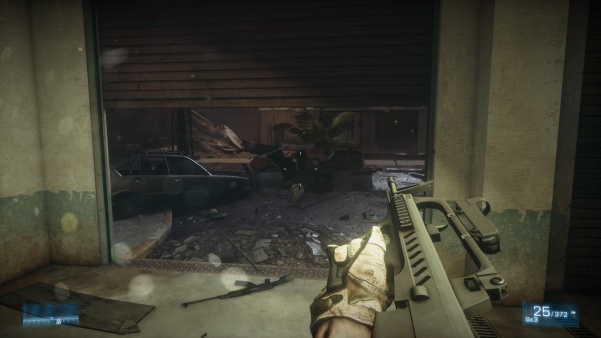 At the start of the mission "Uprising," Blackburn relieves a PLR soldier of this AKS-74U with a Kobra reflex sight, suppressor and tactical light. 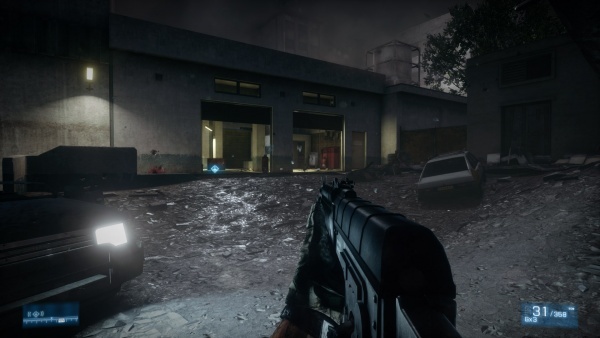 AKS-74U in multiplayer, note the the odd milled/stamped steel hybrid receiver, showing this is the same model from the Bad Company series. 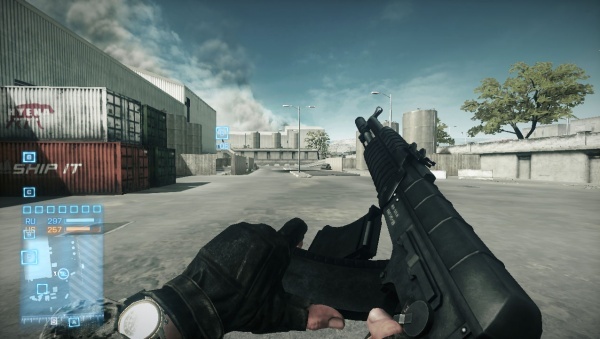 The AN-94 returns from the Bad Company series. 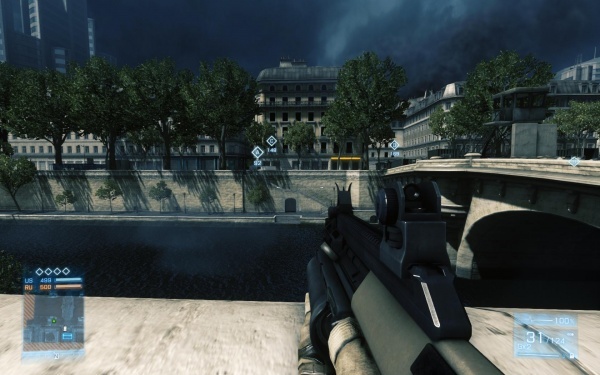 The AN-94's dual-rate full-auto mode has been correctly featured in Battlefield 3. When set to burst, the weapon fires an 1800RPM 2-round burst, and when set to full auto, it fires the first two shots at 1800RPM, while the rest are fired at 600RPM. If the M320 is selected and mounted on the weapon, it will instead be a GP-30, though if set to standalone, will still be an M320. 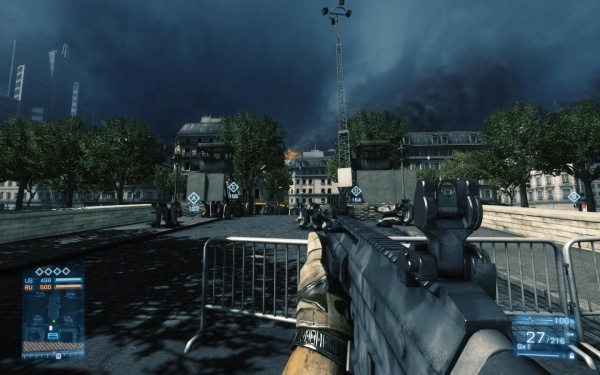 The AN-94 is unique in that it starts in 2-round burst by default, in contrast to every other weapon in BF3, which all use the most aggressive fire mode available by default, usually full auto. 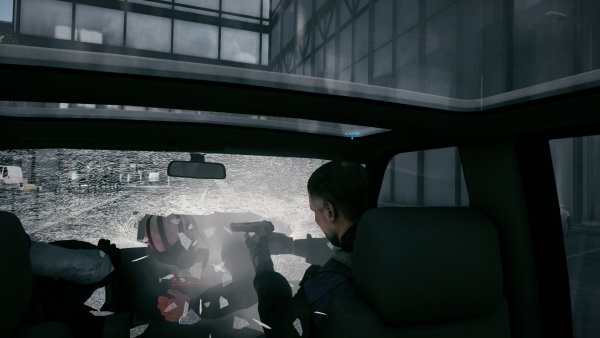 Before a patch, the weapon lacked the semi-automatic mode found on the real weapon, instead featuring only the 2-burst and full-auto modes. 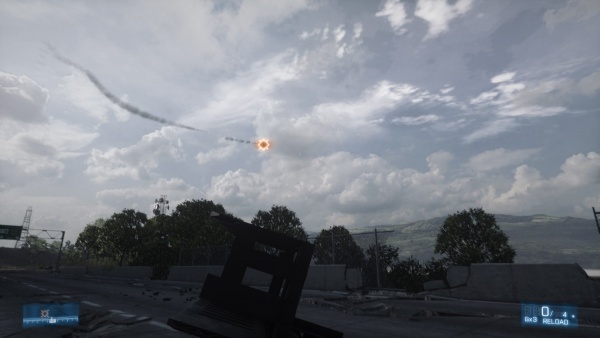 One detail that should be noted is that in the single-player campaign, the 2 round burst is shown to incorrectly fire at the 600 rpm as opposed to the correct 1800 rpm, though this may be fixed as the game still contains a handful of bugs. 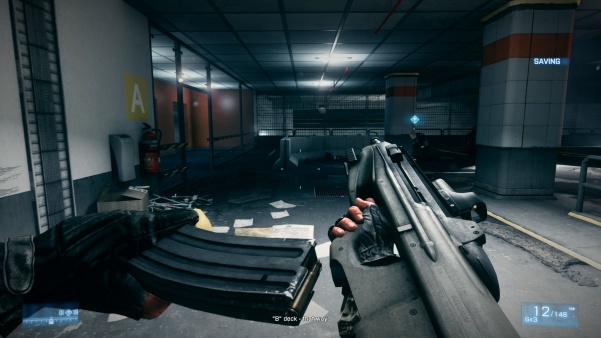 An interesting note is that the player character uses the Speed Reload technique when reloading the AN-94, where he pushes the mag release and flicks the magazine out with another magazine, the same applies to the AEK-971. Blackburn holds an AN-94 equipped with a PKS-07 long-range scope as he looks over an airdropped Russian D-30 122mm howitzer during the mission "Rock and a Hard Place." 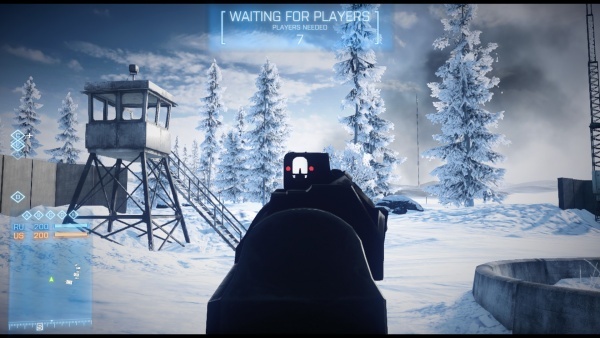 Iron sights of the AN-94. ...and chambering the first round. 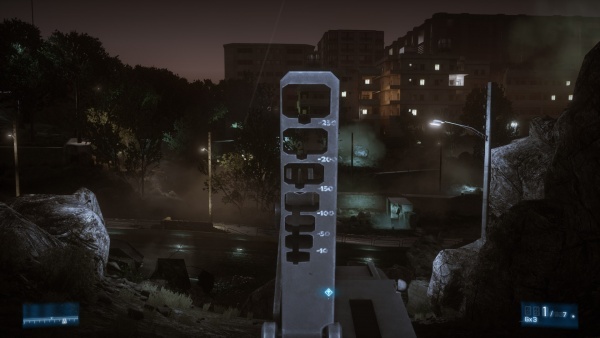 The AS Val appears as an all kit weapon, most likely due to its small size and unique integrated suppressor, making it too specialized for any specific kit. 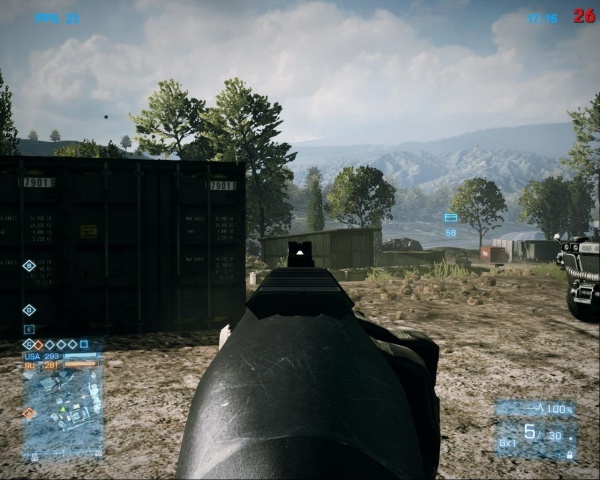 The March 2012 update added the option of using extended 30-round box magazines (the largest box mag available for the VSS/AS Val/SR-3 rifles) instead of the standard 20-rounders. 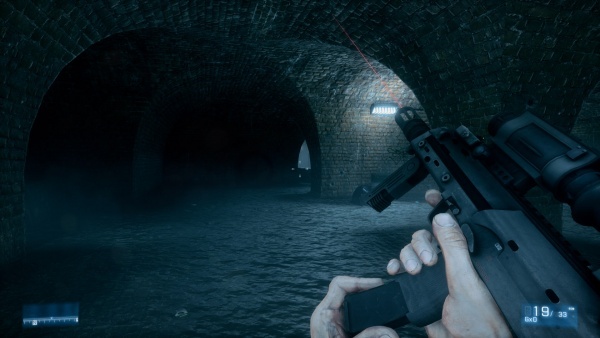 However, the gun is still modelled with a 20-round magazine even with the extended magazine equipped. 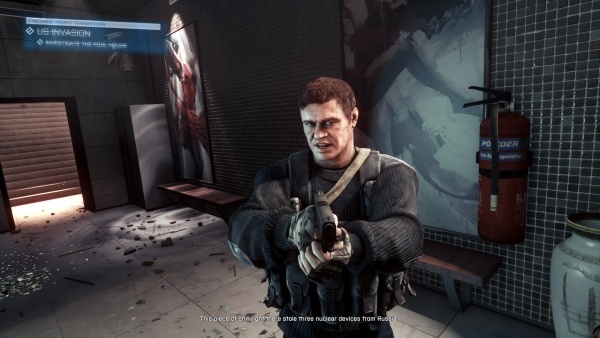 Dmitri Mayakovsky holds his starting weapon, an AS Val assault rifle with a Kobra reflex sight, during the mission "Comrades." Kiril holds his AS Val near the end of "Comrades." 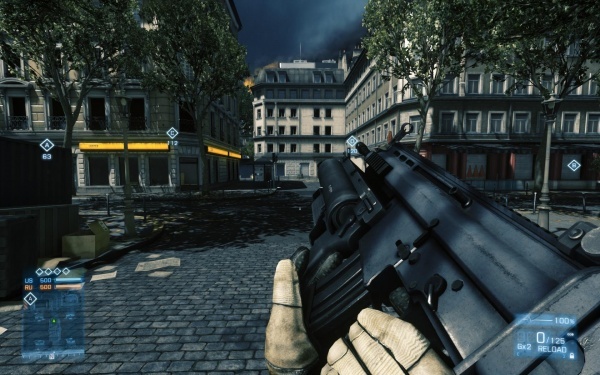 The M4A1 Carbine is commonly seen in gameplay footage which is also in the hands of the main character. 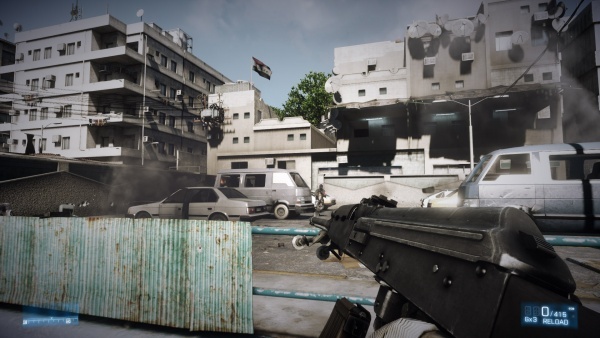 During the alpha stages footage, the in-game M4A1 can be seen fitted with iron sights, EOTech 552 Holographic sight, Trijicon TA01NSN 4x32 ACOG scope, Surefire Universal Weaponlight, AN/PEQ-2 laser designator, Magpul Ranger Plate, and a SOPMOD stock. 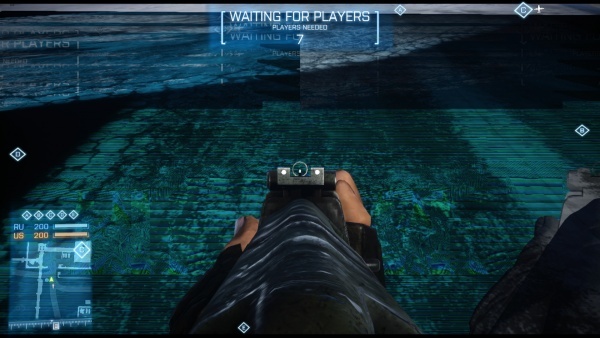 Two different "reload-from-empty" animations have been seen. 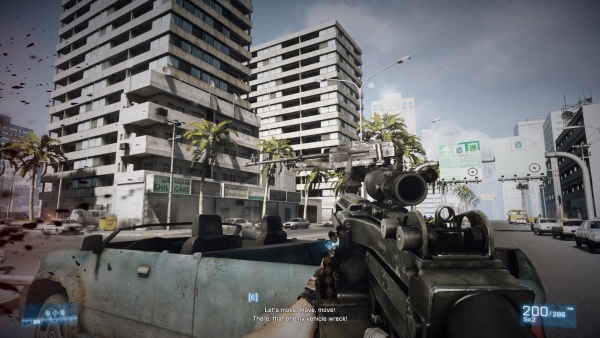 The "Fault Line" trailers had the player rack the charging handle, while in the more recent Operation Metro trailer, and the rest since then, the player uses the bolt release. 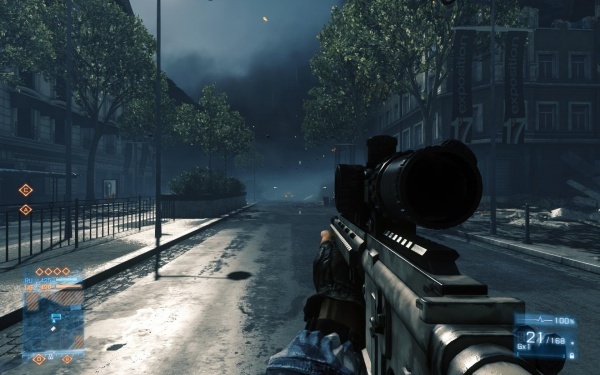 It comes in both the M4A1 (full-auto) and M4 (3-round burst) for use within the game. The standard M4/M4A1 has a KAC RIS handguard, Crane SOPMOD stock, Hogue pistol grip, M16A1 flash hider, and Magpul Ranger Plates. 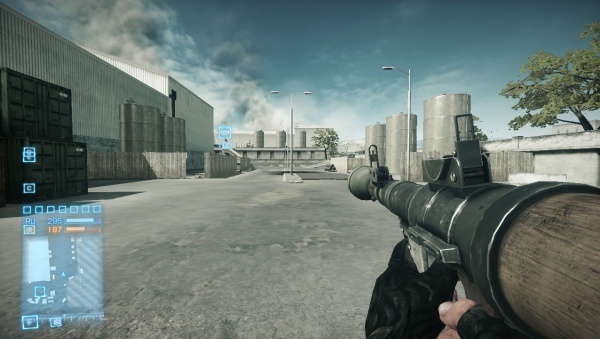 In multiplayer, the M4A1, being a carbine, is used by the 'Engineer' kit, and is the starting weapon for US Engineers. 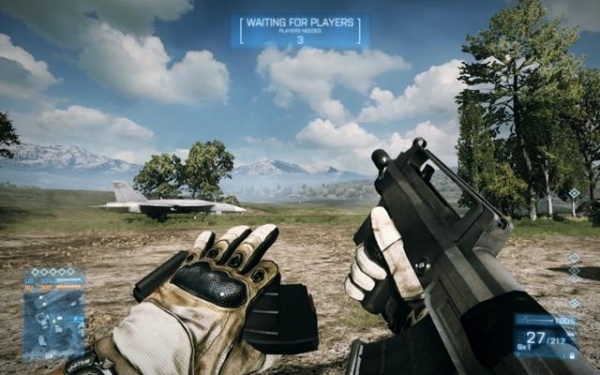 Blackburn holds an M4A1 during "Operation Swordbreaker." Blackburn reloads his M4A1. "For law enforcement / military use" is printed on the side of the EOTech optic. Note also the fire selector on semi-auto. 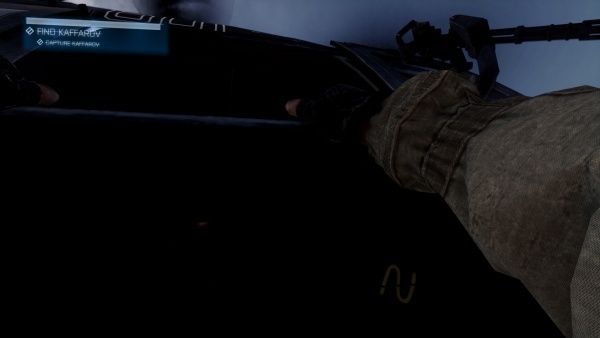 Reloading with the rifle in shadow reveals a snake-like design engraved on the mag well; this is present in Medal of Honor, though as a dark shape that shows up in light rather than a silvery etching that only shows up in the dark. 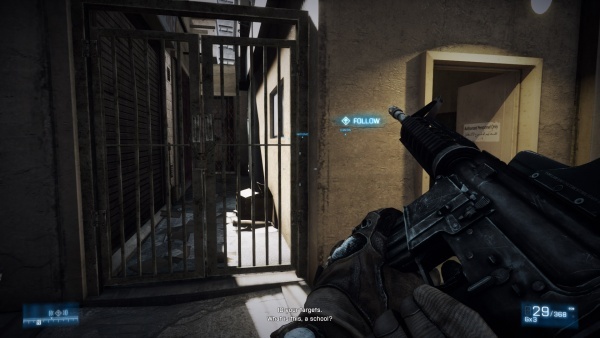 Also note that the semi-auto position reads "Fire", meaning it was modeled on a civilian M4 variant. 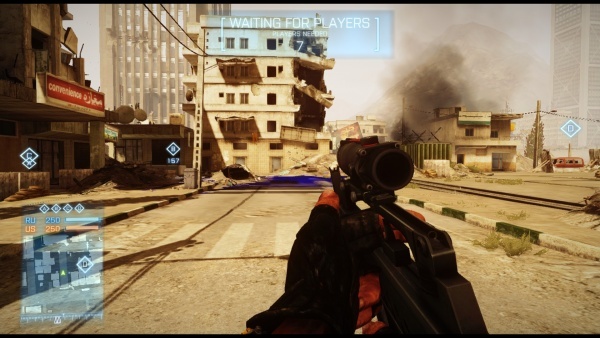 The Xbox 360 Operation Guillotine gameplay trailer shows a PLR militant using the DIO KH2002 Sama assault rifle. The weapon is a bullpup conversion of the DIO S-5.56 assault rifle, which is a direct copy of the Norinco CQ assault rifle. The KH2002 was put into service in 2004 as a replacement for the Iranian Military's obsolete G3A3. 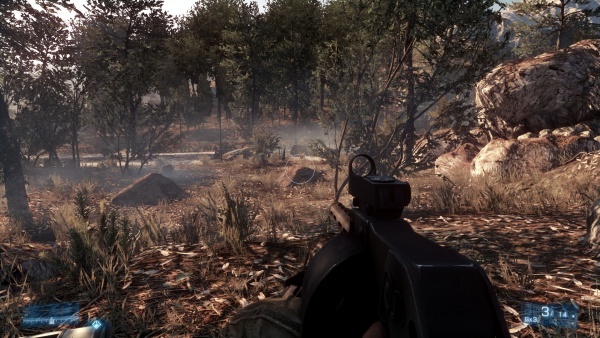 The model featured in the game is the improved Sama model introduced in 2009, as noted by the diagonal cuts on the receiver as opposed to horizontal, side mounted rails and the combination of long carry handle and barrel mounted front sight. 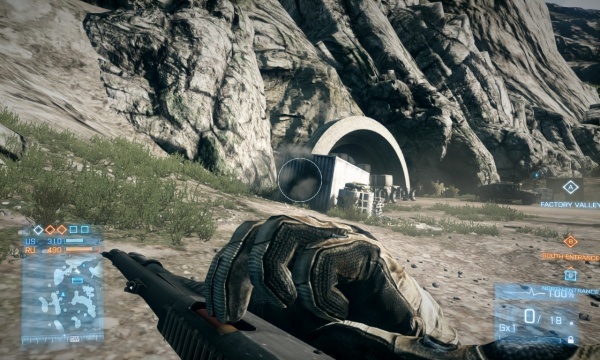 The improved foregrip of the Sama model only appears if the Foregrip attachment is used in multiplayer. 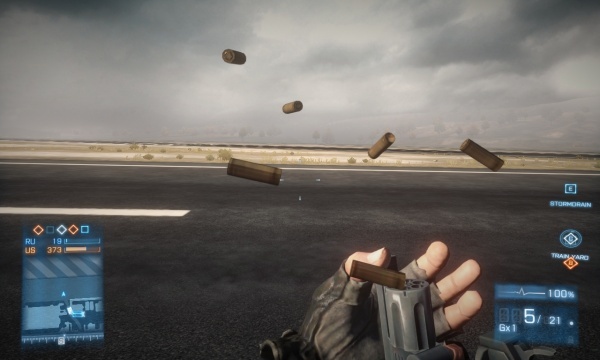 The in-game model fires 30 rounds form a 20 round STANAG magazine, however. 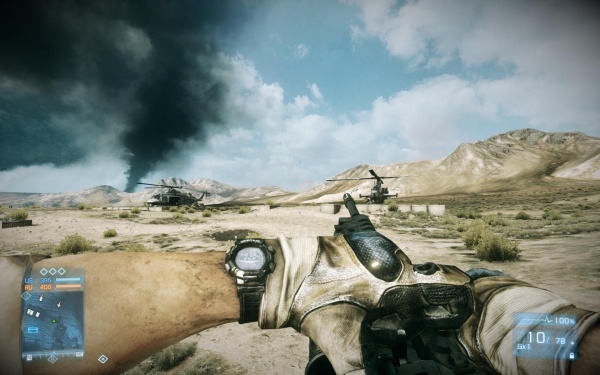 In campaign mode, the weapon is often found in the hands of Iranian Army soldiers after the PLR's hostile takeover. 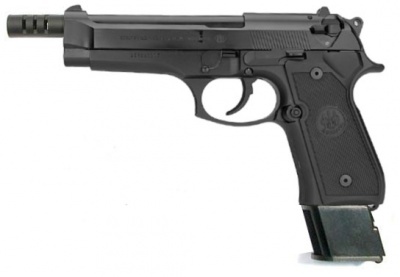 It fires in single shot and 3-round burst firing modes, and uses Russian optics. It can be unlocked for multiplayer use with a 17,000 co-op score. 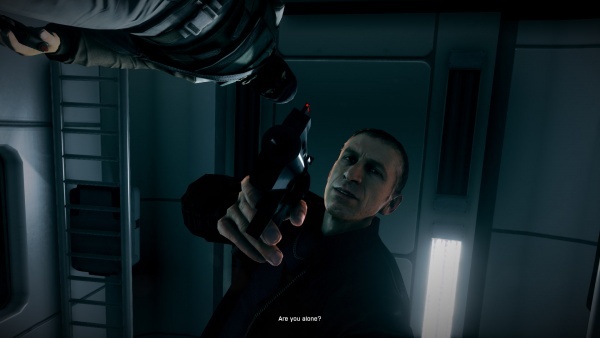 Blackburn holds a KH2002 during the mission "Uprising" as he discovers the exit. 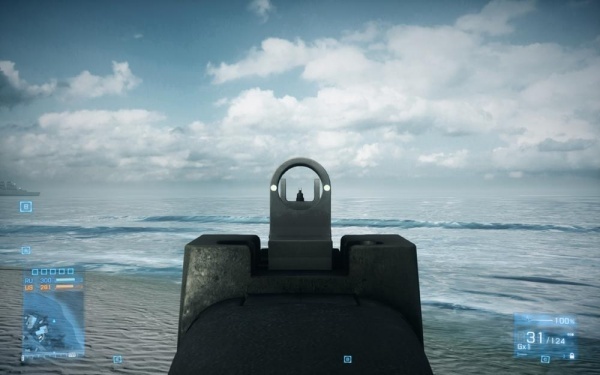 Iron sights of the KH2002. 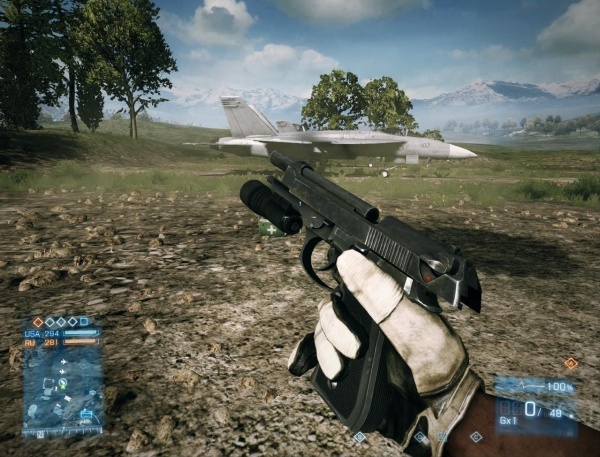 Blackburn reloads his KH2002, showing that the Khaybar variant used in the game is the 2009 model. 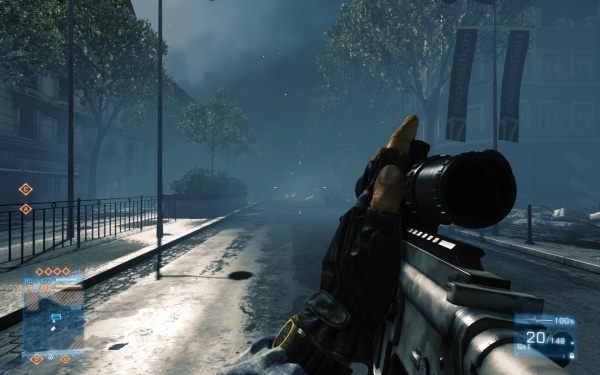 Charging an ACOG scope-equipped KH2002. 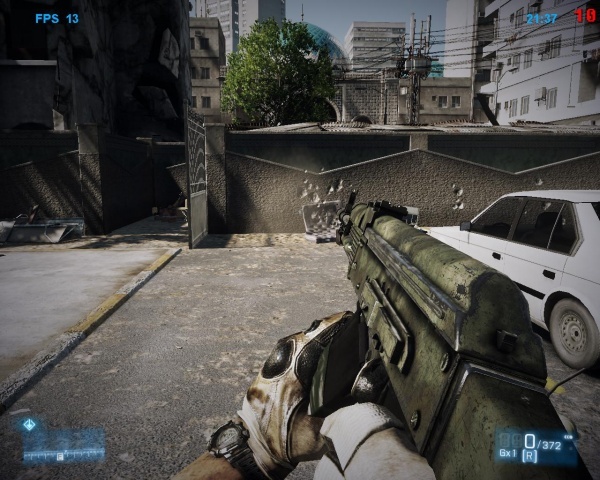 A FAMAS Valorisé (FAMAS Upgraded) is included in the Back to Karkand expansion pack, and can be used by the Assault kit. The weapon is incorrectly fitted with a G1/G2 trigger guard rather than the correct F1 style one and has had the bipod removed. 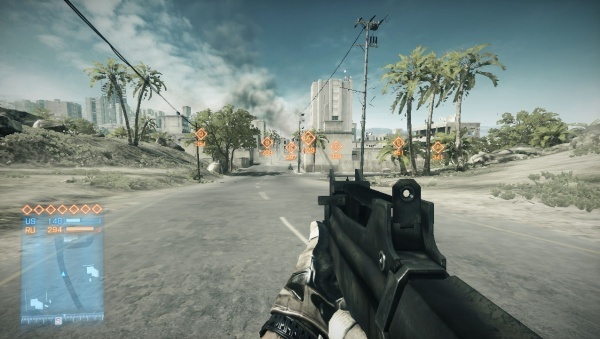 In-game, the FAMAS uses the correct 25 round straight magazines. 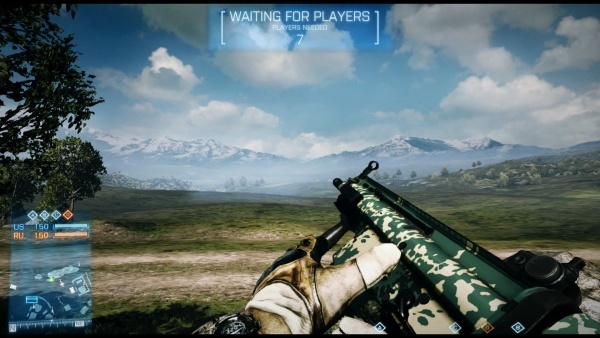 FAMAS Valorisé on the customization screen. 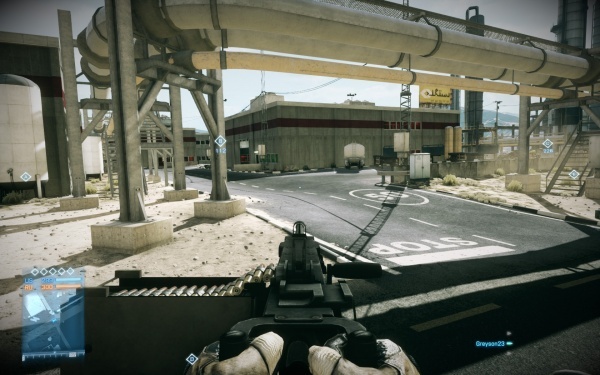 Note the incorrect 30-round magazine capacity, which has since been patched. 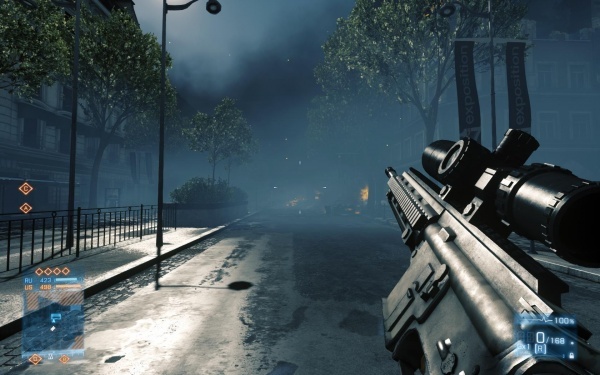 The FN F2000 returns from the Bad Company series, and has much more realistic statistics, most notably that it doesn't have a fire rate resembling a minigun. 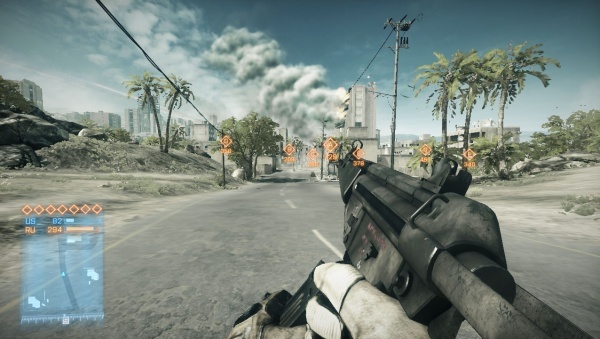 Due to its lack of an underslung rail, an M320 or M26 MASS will always be carried as a standalone if the F2000 is equipped. 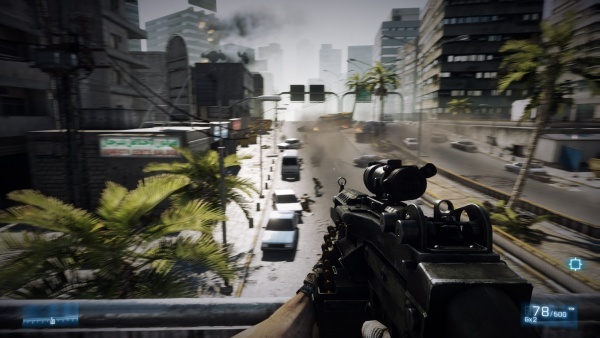 The F2000 can mount a bipod and foregrip like the other assault rifles. 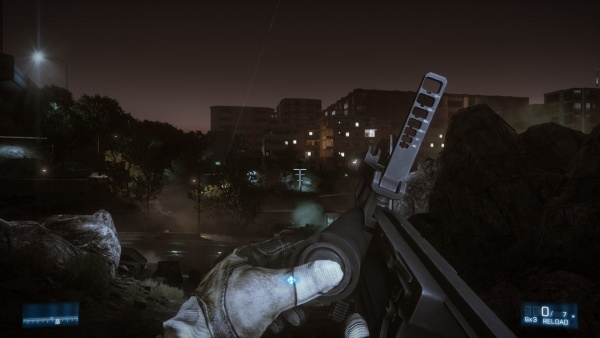 Dmitri Mayakovsky reloads an F2000 with EOTech reflex sight during the mission "Comrades." 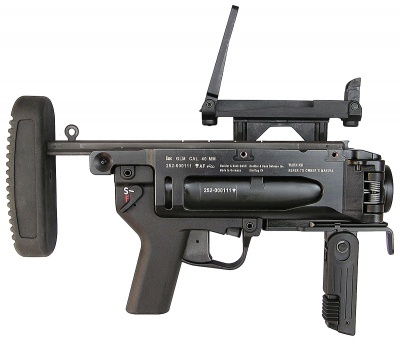 The left side of the F2000 Tactical, note the FN trademarks. 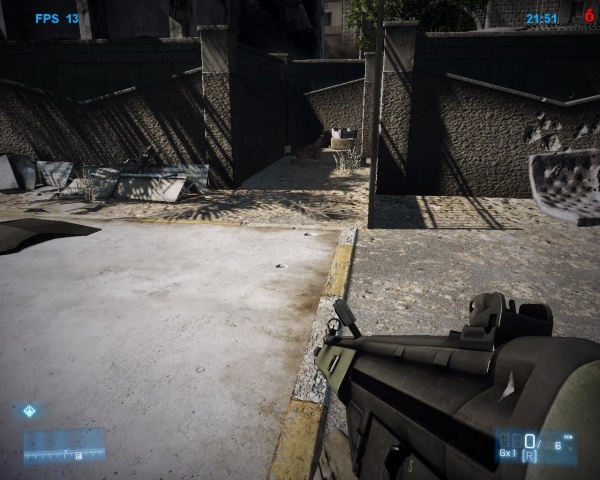 The left side of the F2000 with Navy Blue Digital "camouflage", folding bipod, EOtech sight, aftermarket flash hider, and what appears to be an intangible magwell. 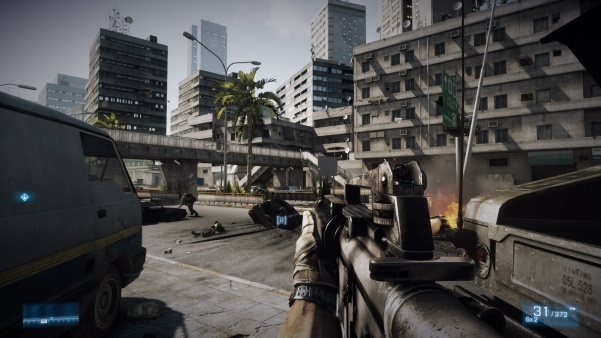 The first generation FN MK16 MOD 0, or SCAR-L, is an assault rifle added in the Close Quarters expansion pack and is issued to the Assault kit. 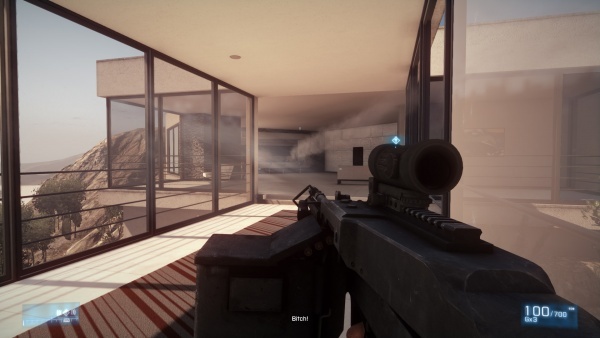 It's weaker than its bigger brother the SCAR-H because of its smaller round, but it boasts a slightly higher rate of fire (620 rpm) and extremely controllable recoil. 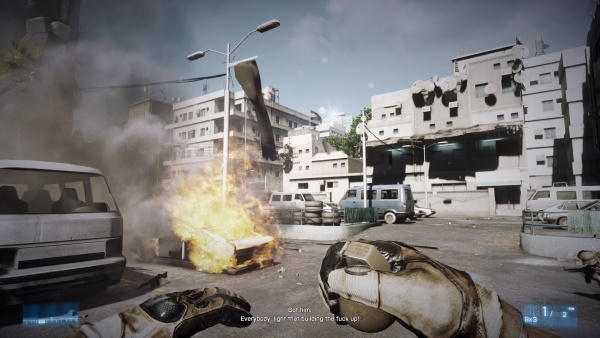 It's unlocked by completing the 'Set us up the Bomb' assignment, which involves killing 20 enemies with an underslung grenade launcher and 15 enemies with hand grenades. 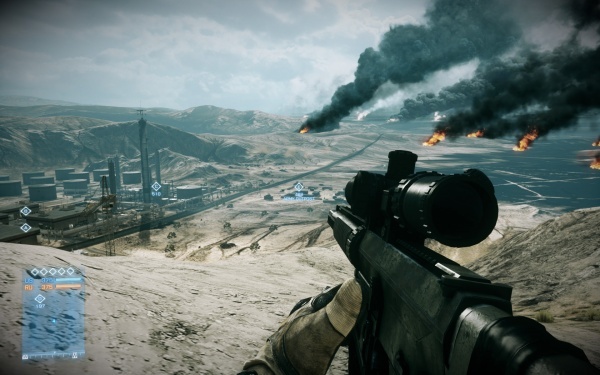 The SCAR-L's reload. Note the selector switch is incorrectly set on single fire, but the charging handle is correctly in the locked back position since all rounds were expended. Pressing the bolt release, which simultaneously sends the charging handle forward with the bolt. 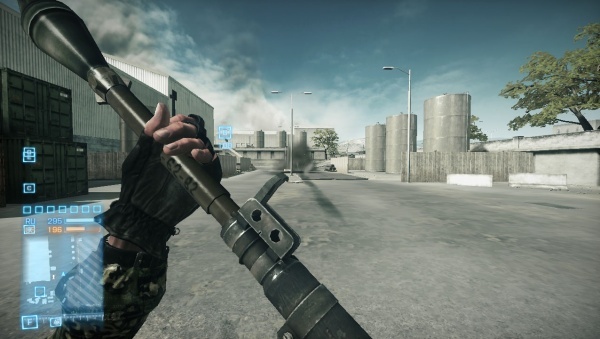 The game also correctly animates the reciprocating charging handle when firing the weapon. 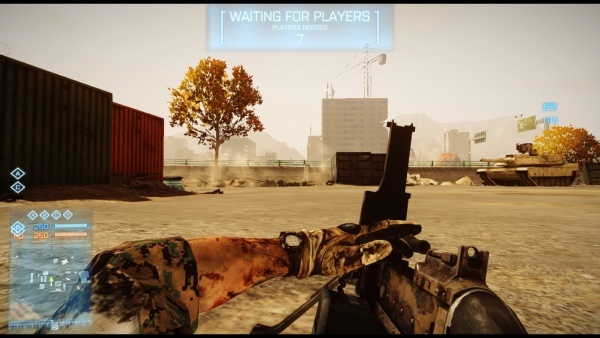 The first generation FN Mk 17 Mod 0, or FN SCAR-H CQC, can be seen in the new Caspian Border gameplay trailer. 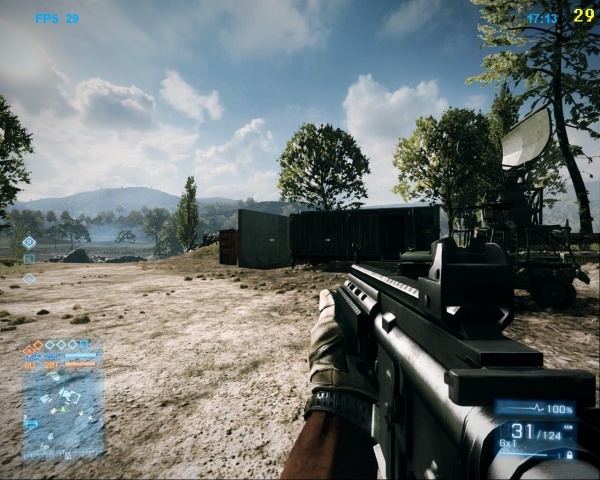 In multiplayer, the SCAR-H is used by the 'Engineer' kit. 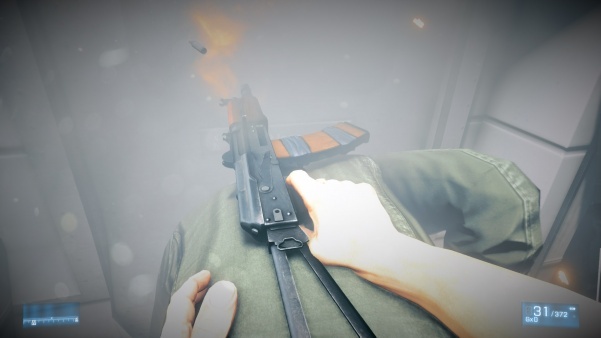 A modelling mistakes shows the fire selector switch set on semi-auto as the weapon itself fires on full-auto by default. Blackburn reloads his SCAR-H at the start of "Operation Guillotine." 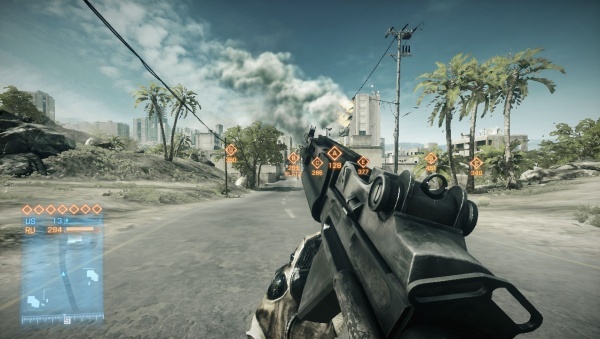 Note that even though the weapon can fire in full-auto, the fire selector switch is set on semi-auto. Pulling up the new magazine. 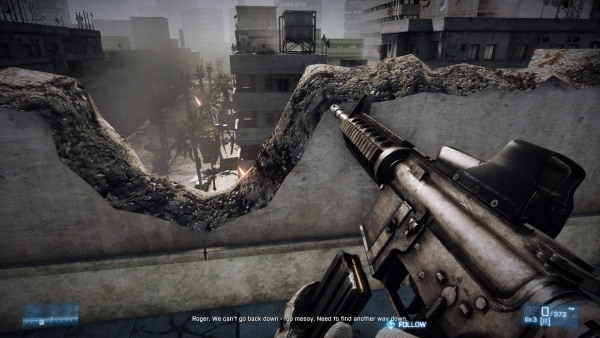 This angle doesn't really happen with the SCAR-L reload. 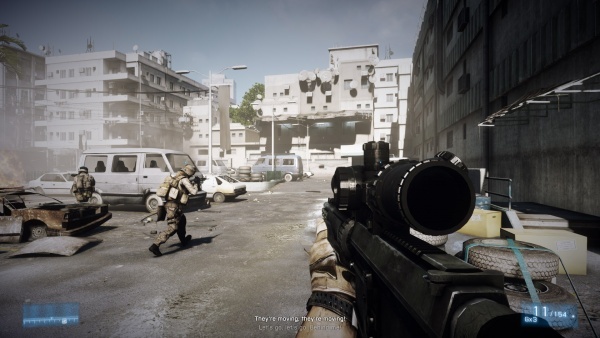 A hybrid of the Heckler & Koch G36 and G36C, mislabeled as "MG36" (a no longer produced weapon with a production run of around 100 units, facts that were even mentioned in the description) is included in the Back to Karkand expansion pack, and can be used by the Support kit. 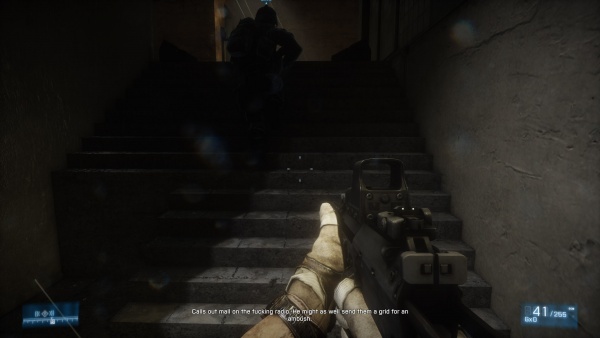 The weapon has the full-length forearm and barrel of the G36, but the carry handle of the G36C, as well as having a C-Mag fitted. The C-Mag is limited to 50+1 and requires the "Extended Magazines" attachment in order to use its full 100+1 capacity. "MG36" on the customization menu. 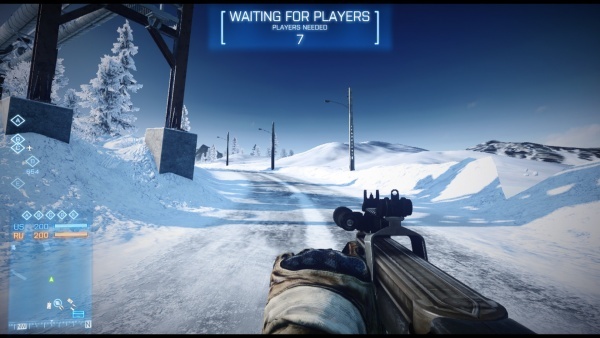 Note the 12x sniper scope attached, in case you feel the need to give suppressive fire from 1000+ meters. 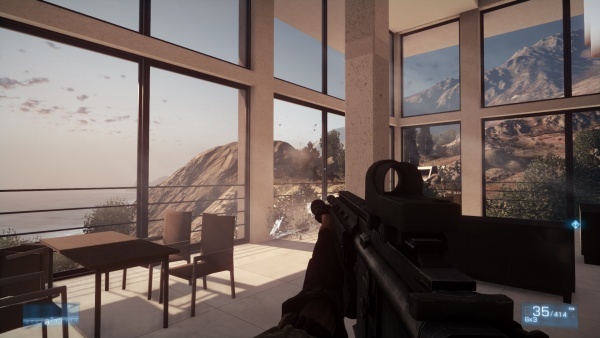 A Heckler & Koch G36C is seen in single player in the mission "Comrades". The model is based from 2008's DICE game Mirror's Edge. 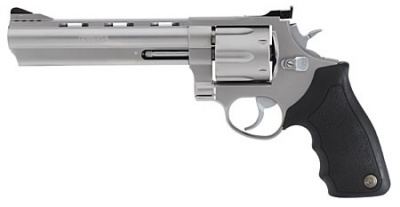 It can fire semi, auto, or two-round burst. 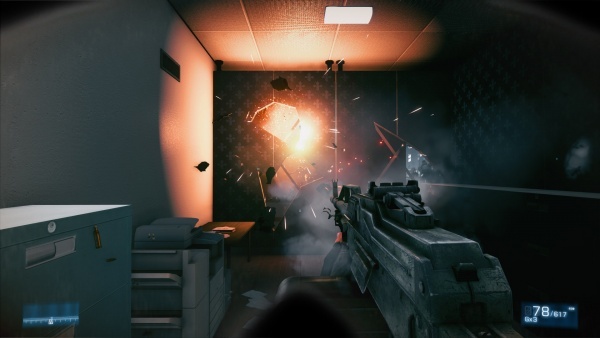 In multiplayer, the G36C being a carbine is used by the engineer kit and uses opaque magazines. Dmitri Mayakovsky holds a G36C he took from a French police officer during the mission "Comrades." 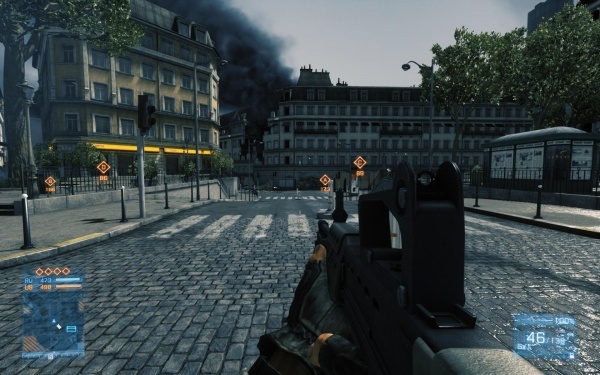 Note That while the fire selector is in the correct position for fully automatic fire, the white position indicator is pointing to "safe". 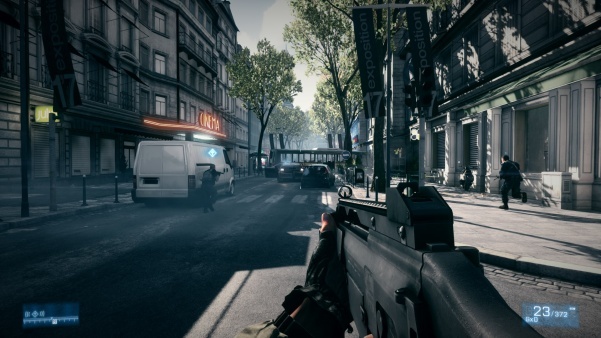 It's greatly improved from Mirror's Edge's G36C. 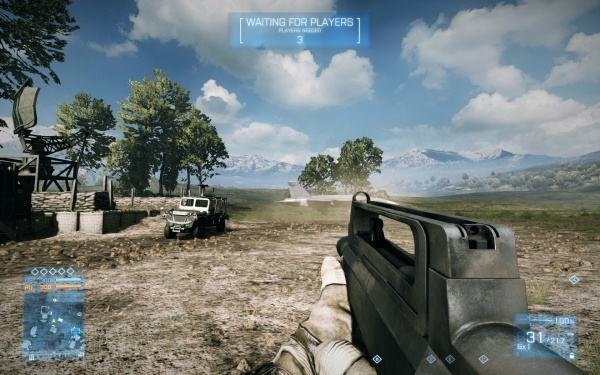 The G3A3 is available in both single and multiplayer. 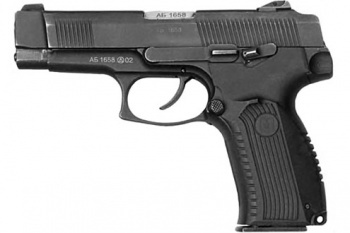 It is an actual H&K G3A3, and not an Iranian clone. 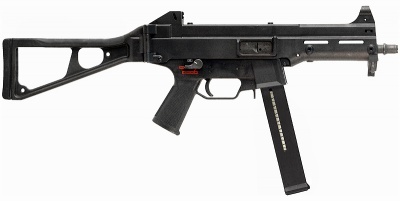 It has a wide handguard, and the fire selector markings are S-E-F. The Iranian-manufactured version differs in that it utilizes a slimline handguard and has Farsi writing on the receiver. It can be unlocked for use in multiplayer by gaining 160,000 Co-Op score. 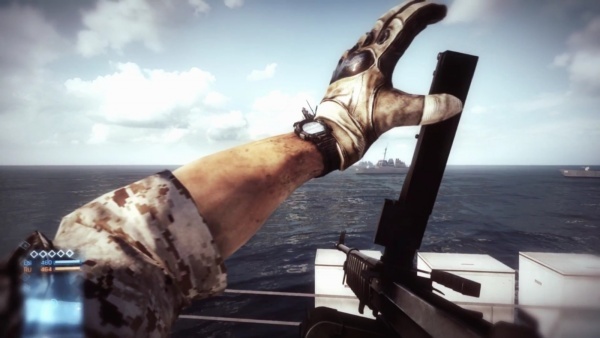 Blackburn holds a G3A3 with ACOG scope during the mission "Operation Swordbreaker." 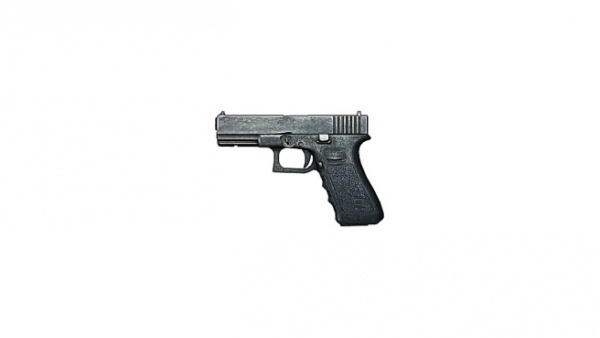 The detailed pick-up icon for the G3A3. 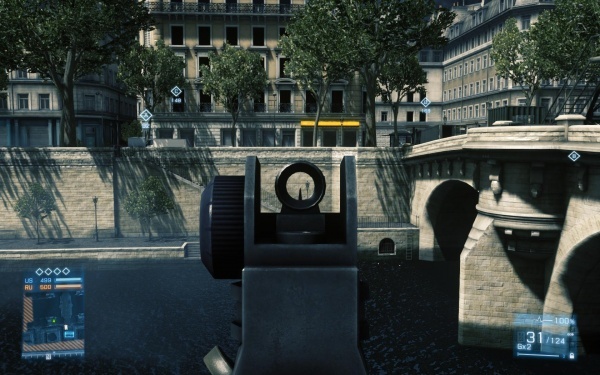 Iron sights of the G3A3. Icon and world model. Note the slightly mispositioned magazine. The HK416 returns from Bad Company and Bad Company 2 having a 10.4" barrel and OD furniture. It is the first unlock for the Assault kit and can have an M320 (which replaces the kit's Medkit) mounted as long as a grip or bipod are not. 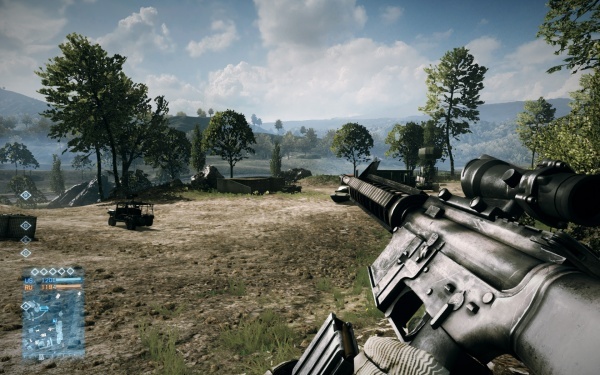 It once again appears as the "M416," seemingly just because that's what it was called in the Bad Company games since it is no longer shown as a standardised US military weapon in singleplayer. 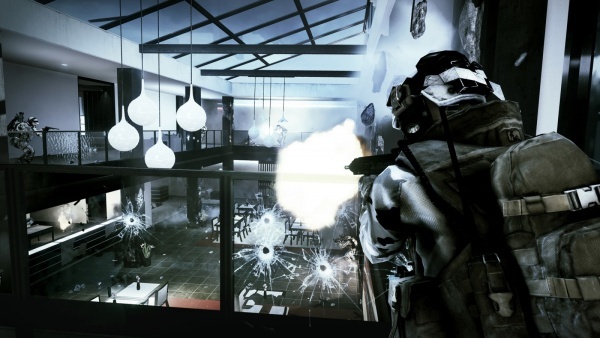 At release, it featured semi-auto, burst, and full-auto modes, something that isn't typically possible with AR-15 type rifles and derivatives. 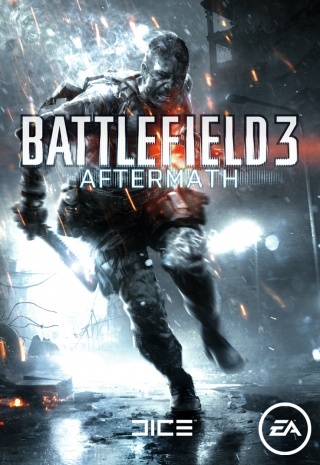 A patch in December of 2011 removed the burst mode for PC, and as of the March 2012 patch, the Xbox 360 and PS3 version's M416 has it removed as well. 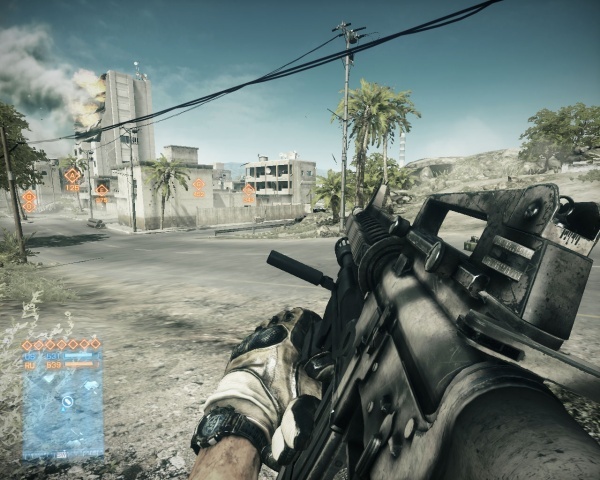 The BF3 HK416 uses the older M4 Gen II style stock and a Tangodown pistol grip. Newer variants utilize HK's in-house stock and grip designs. Blackburn runs with his HK416 with M320 grenade launcher, straight into a most unpleasant surprise. The Russian transport craft depicted is an Antonov An-22. The pilot of the Antonov is a big fan of Top Gun and is getting as much low-altitude fly-by practice in as he can before the real war starts. A minor modeling error is present in the charging handle: the backside of the handle is completely solid. In reality, you would see a slot with the latch showing through on the left side. 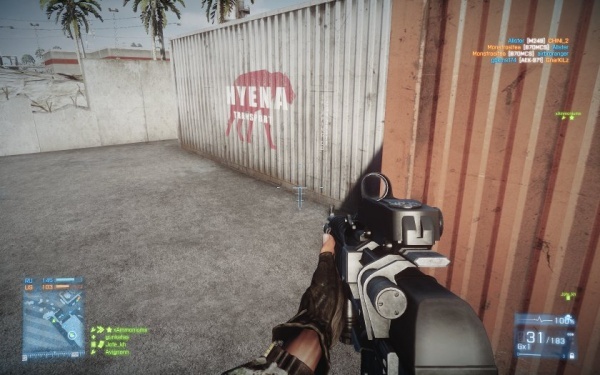 This mistake is not present in the M4/M16 models, but is present in the M27 and HK417 (both also HK designs). 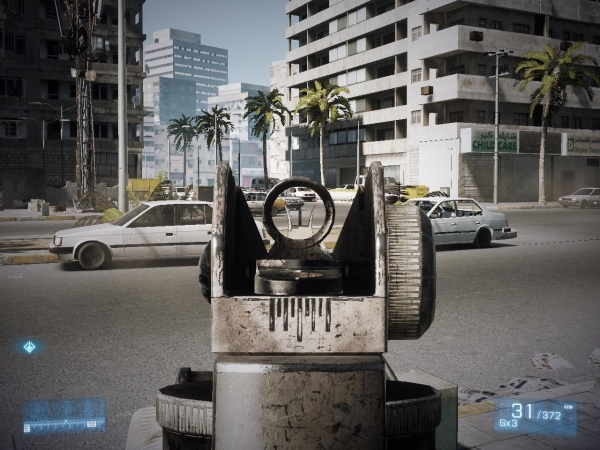 Iron sights of the HK416. 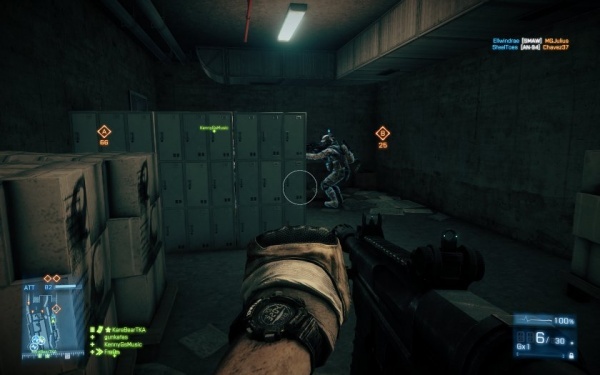 The player character reloads his HK416. 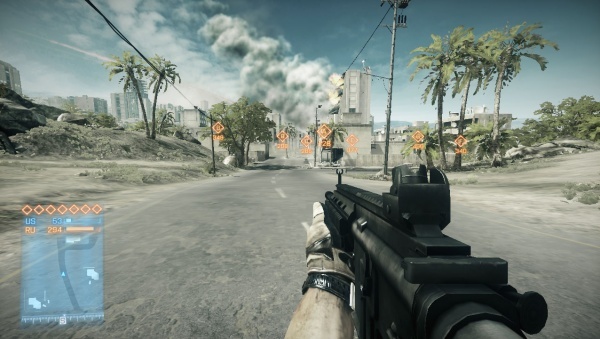 The HK53 is included in the Back to Karkand expansion pack as the G53. 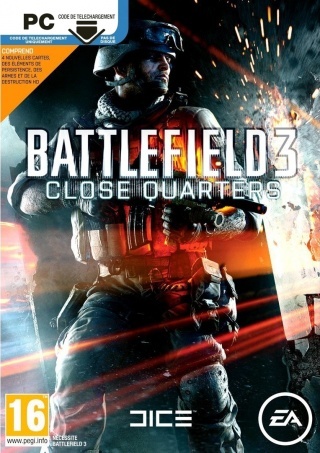 It was listed in game under its original "HK53" name on the PS3 version until a patch altered it to G53 as used in the PC and X360 versions. 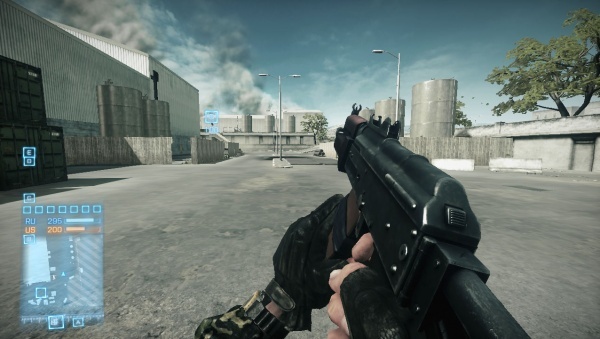 It is a compact version of the HK33 rifle, and as a carbine, it can be used by the Engineer kit. 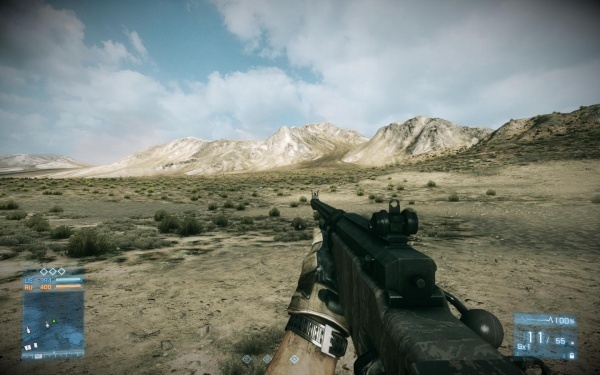 The L85A2 is included in the Back to Karkand expansion pack, and can be used by the Assault kit. 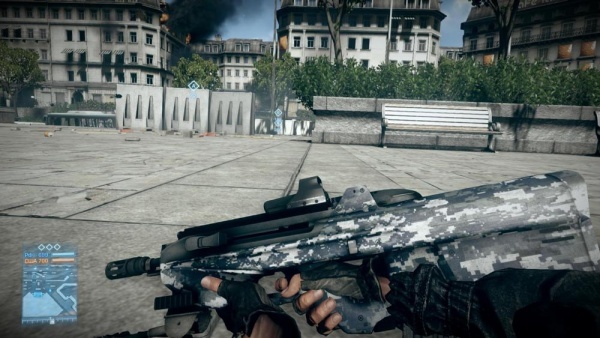 It features very high accuracy, low recoil and better hip-fire accuracy due to its bullpup configuration but suffers in close quarters due to its 650 RPM rate of fire. It also cannot mount an underslung M320 like it can in real life. L85A2 on the customisation screen. 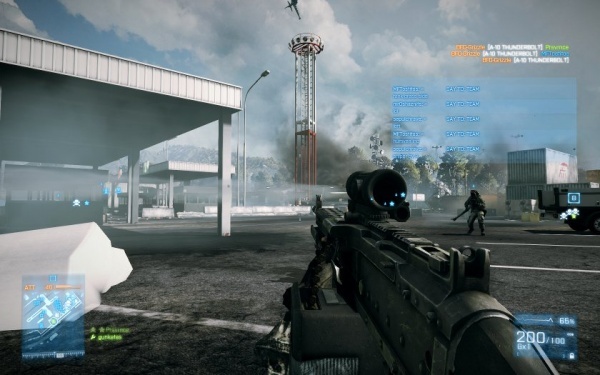 L85A2 idle, fitted with an ACOG sight and a bipod. Moving to press the bolt release. 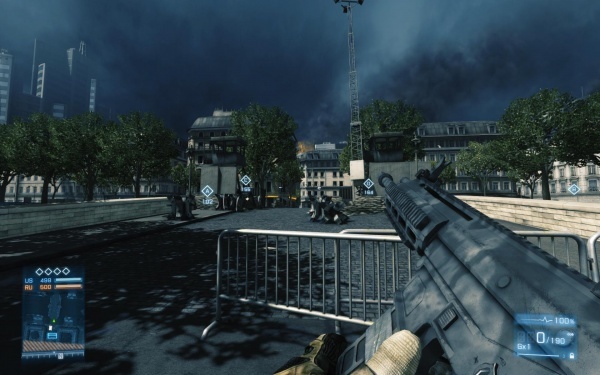 The M16A4 rifle was one of the first weapons to be shown in early gameplay footage, but was lacking rear iron sights and even optical sights because of the alpha stage development; these were added later on. Some later footage showed the M16 with the gas block missing when mounting sights, but this too was corrected in the final release. 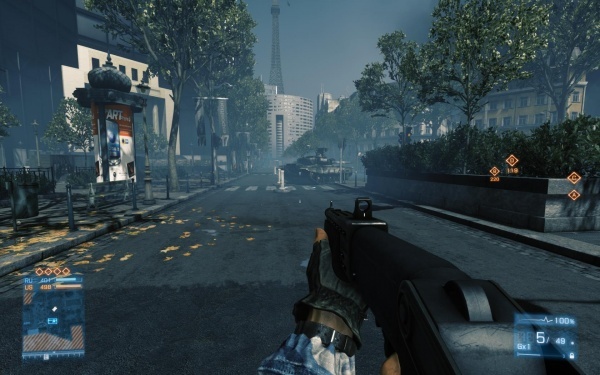 Both the M16A3 (full-auto) and M16A4 (3-round burst) are available for use within the game; they both utilize the M16A4 model, despite the real M16A3 having a non-removable carrying handle (like the M16A2). They have M16A1 flash hiders, KAC RIS handguards with a rail cover on the right side rail, a Hogue pistol grip, Magpul loops on the magazines, and a cloth sleeve wrapped around the stock. 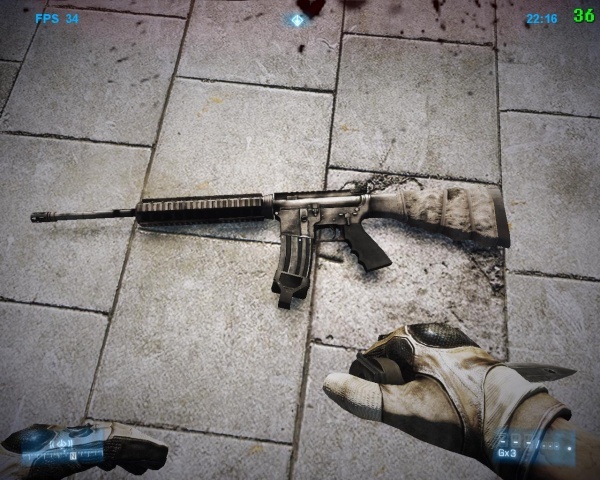 It is the standard assault rifle used by the US 'Assault' kit. M16A4 MWS (Modular Weapon System) with RAS rails installed, AN/PEQ-2 IR designator, RIS foregrip, and Trijicon 4x32 ACOG scope - 5.56x45mm. This is the USMC style setup. Blackburn holds his "M16A3" during Operation Swordbreaker. Iron sights of the "M16A3". 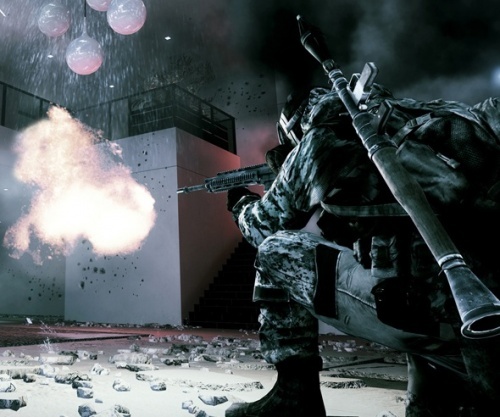 A Marine reloads his "M16A3" with a mounted Trijicon ACOG scope in multiplayer. 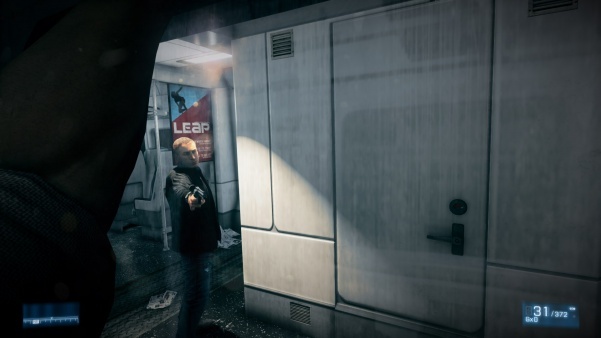 Note that there are actually bullets in the magazine, a relatively rare sight in a modern shooter. 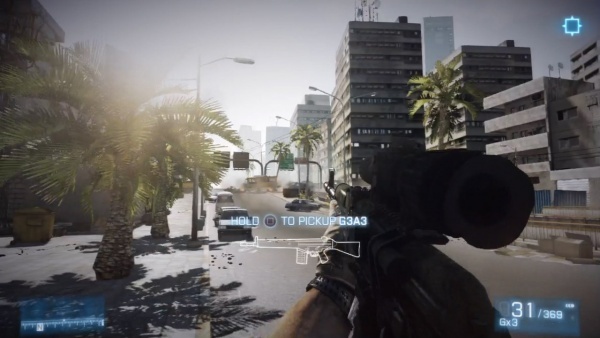 But unfortunately, like in most modern shooters, the fire selector is always set to semi-auto. 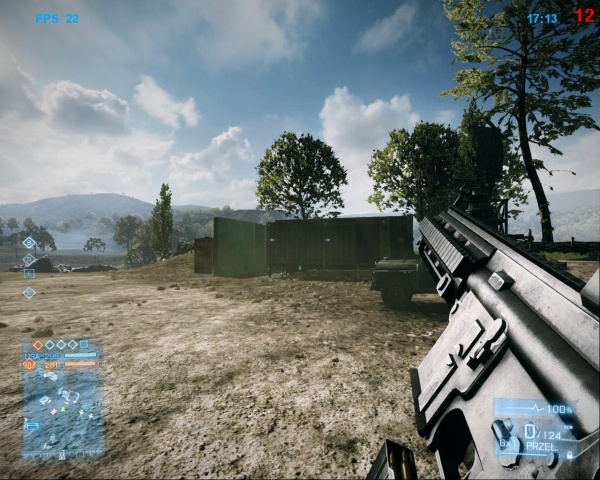 Icon and world model of the "M16A3" in Single-Player (note that the front sight and gas block are missing, while in the first person model they are present). 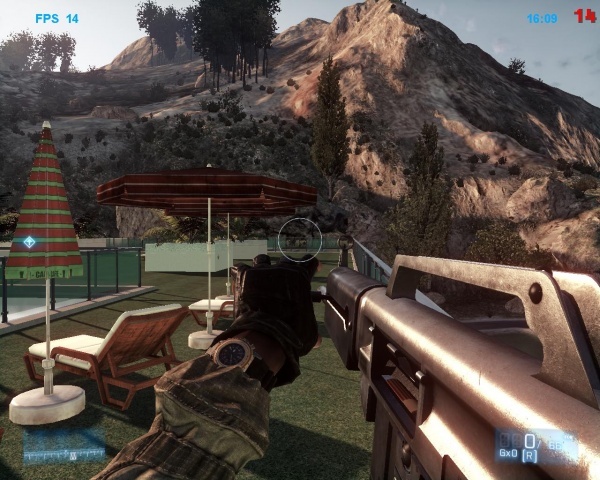 The Magpul PDR, a compact bullpup assault rifle development of which was abandoned the year the game came out, appears as an all kit weapon. 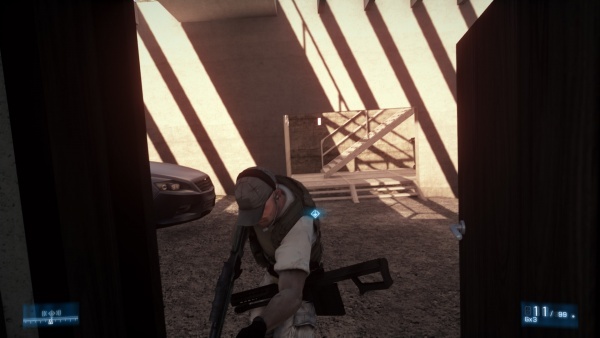 For unknown reasons, it appears as the "PDW-R" (most likely standing for Personal Defence Weapon-Rifle). Uses either 20 or 30 round polymer magazines, with 20 being the default option. Dmitri Mayakovsky reloads his PDR as he ponders the wisdom of Vladimir's "walking into a fire" plan. 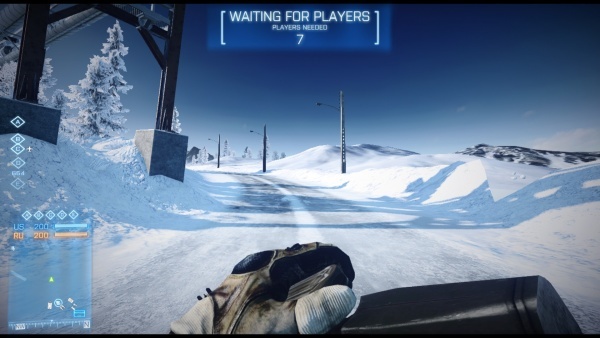 Pressing the magazine release on a PDR in multiplayer. Releasing the charging handle on a full reload. 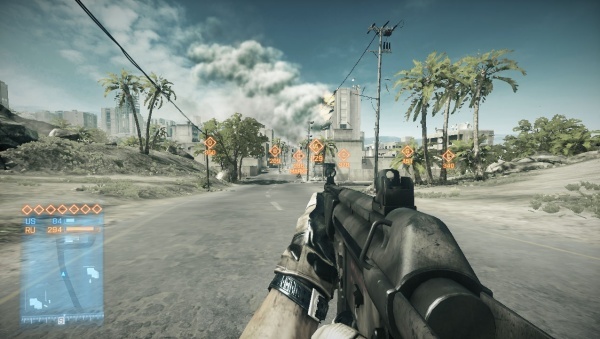 The QBZ-95B is included in the Back to Karkand expansion pack, and, as a carbine, can be used by the Engineer kit. QBZ-95B on the customise menu. 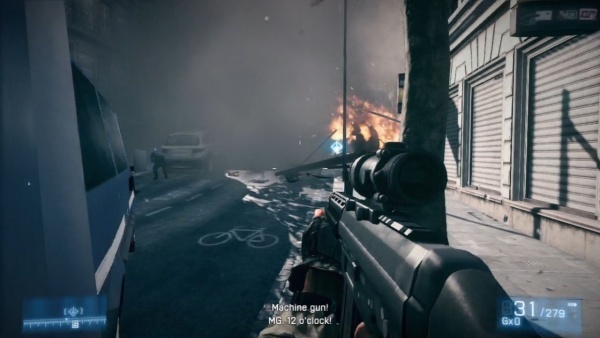 The SIG SG 553 appears in Battlefield 3. 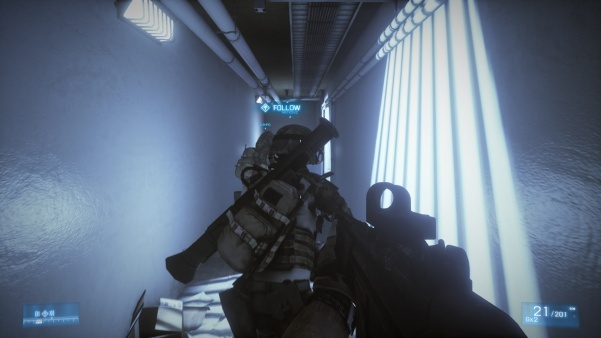 In multiplayer, being a carbine, is used by the 'Engineer' kit. It can only be unlocked in Co-Op by achieving a score of 120,000. 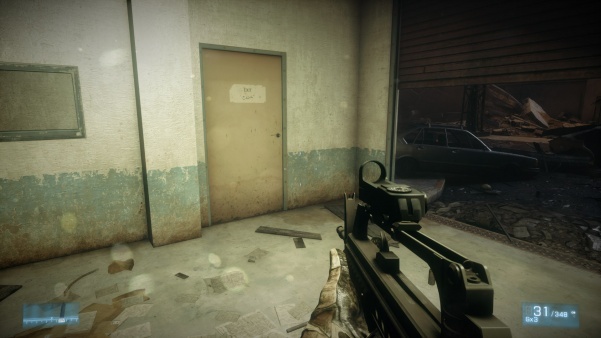 In the campaign mode, the SG 553 is found in two places. 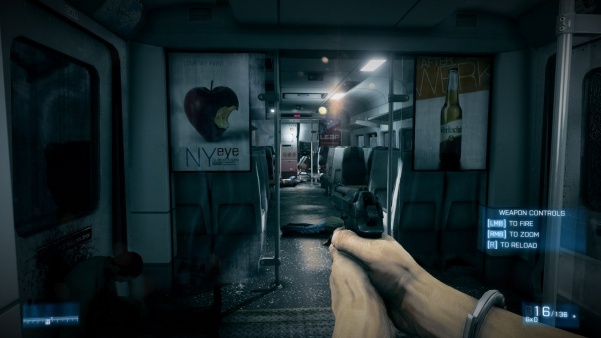 The first is in "Comrades", where a police officer exiting the van has one, and the other one being found by the player after the train crashes in "The Great Destroyer". 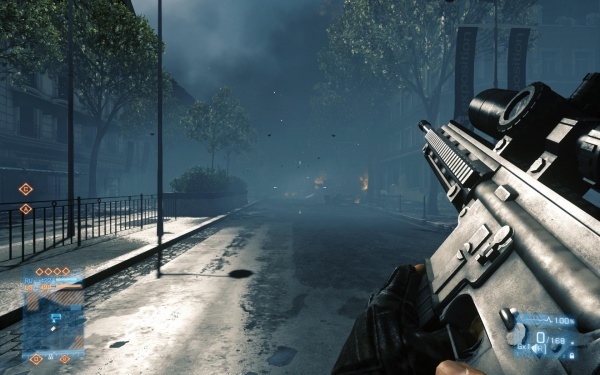 Dmitri Mayakovsky holds a SIG SG 553 during the mission "Comrades" as he fights his way through a French police cordon. 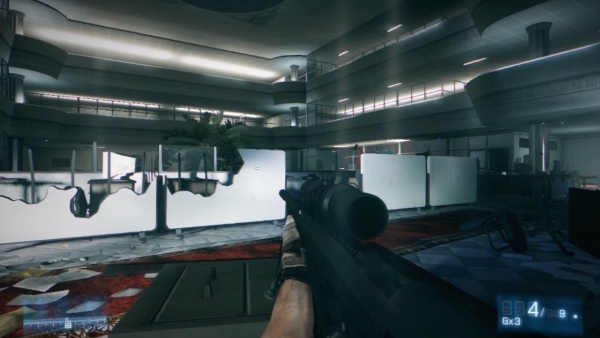 The Remington ACR joins the arsenal of Battlefield 3 as part of the Close Quarters expansion pack and was first seen in the "Ziba Tower" gameplay video. Inaccurately appears as the "ACW-R" (likely meaning 'Adaptive Combat Weapon - Rifle') much like the "PDW-R". It boasts a high rate of fire with controllable recoil and features a 26 round capacity in a 30 round 5.56mm PMAG magazine. 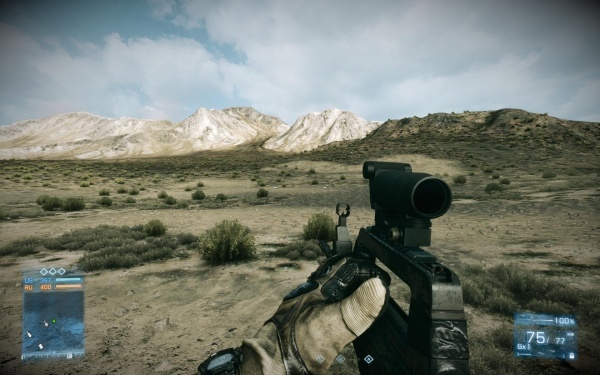 Developers have stated that the "ACW-R" in-game is chambered for 6.5x38mm Grendel, which explains the round capacity. 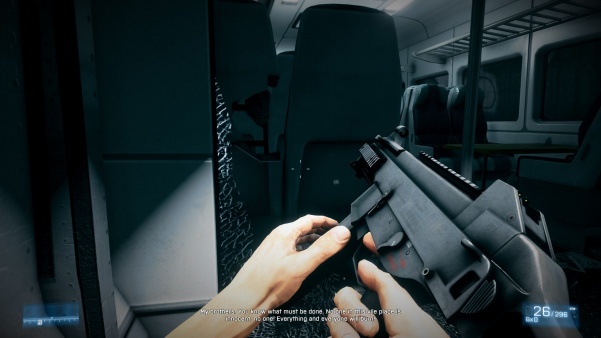 Newer revisions of the Remington ACR have features not reflected in this game model, such as an angled / folding charging handle and an updated lighter-weight rail. The "ACW-R" idle. Note the 26+1 magazine. And inserting a fresh one. It is a polymer Magpul PMAG instead of the STANAG aluminum magazine. Pressing the bolt release to chamber a new round. 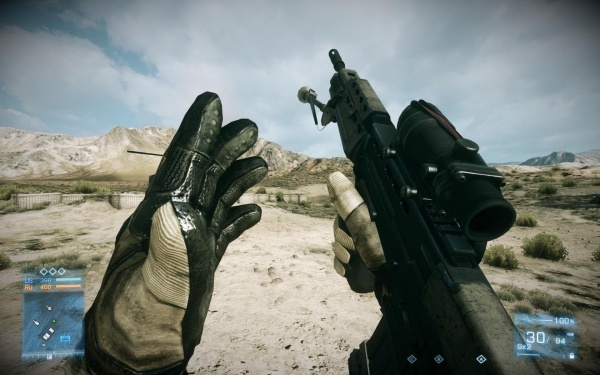 A more efficient method would be to use your trigger finger, as the bolt release is ambidextrous. This was most likely done so the player can see the bolt being released. A Russian Engineer fires his "ACW-R," note the 14.5" barrel and the correct AAC Blackout flash hider. 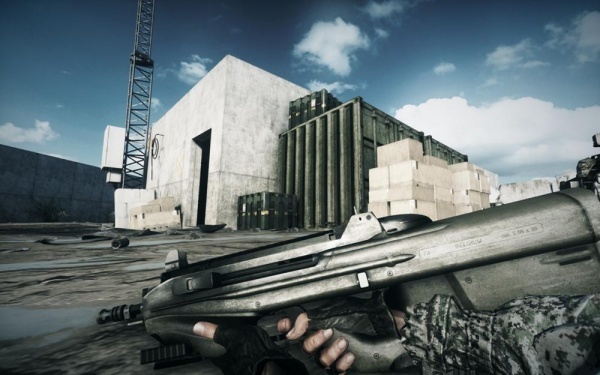 The Steyr AUG A3-CQC was added in the Close Quarters expansion pack. 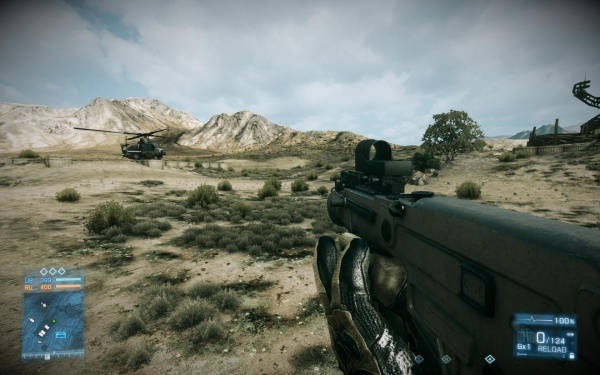 It serves a similar role to the M416, a stable gun with a steady 700 rpm rate of fire and easy to control recoil. 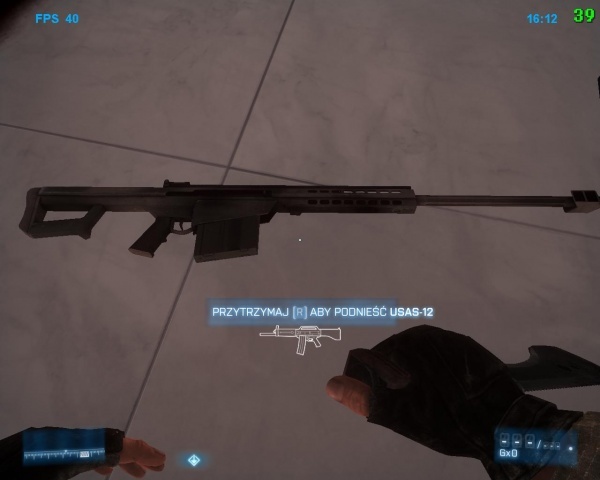 The AUG A3-CQC is unique, as it's the only bullpup assault rifle that can mount an underslung weapon. 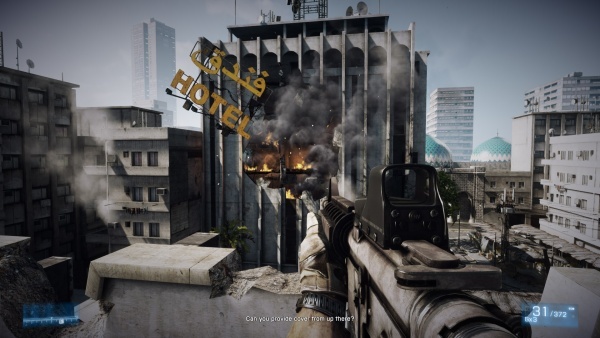 It was first shown in the "Ziba Tower" gameplay trailer and in pre-release screenshots. 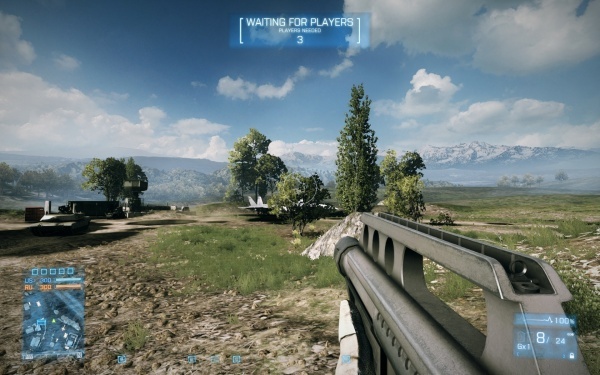 It is very accurate and has controllable recoil, making it an effective assault rifle. 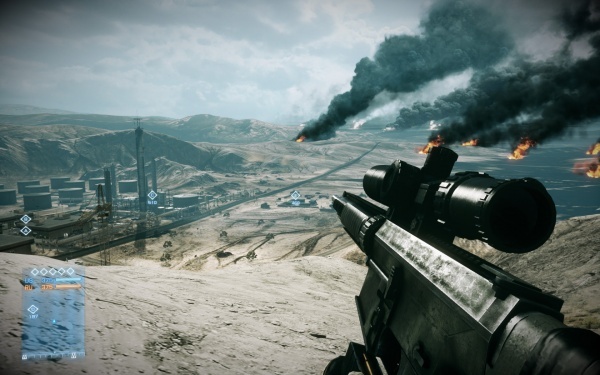 It is unlocked by completing the "Shepard" assignment which involves 10 squad revives and 30 kills with assault rifles. 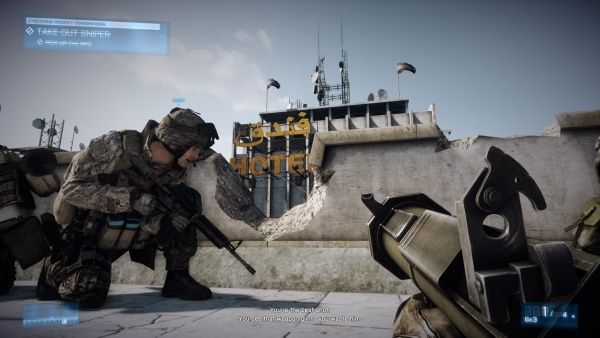 The soldier in the foreground can be seen holding an AUGA3 (Note the tri-railed handguard and the placement of the charging handle) fitted with an EOTech 552 and KAC foregrip. 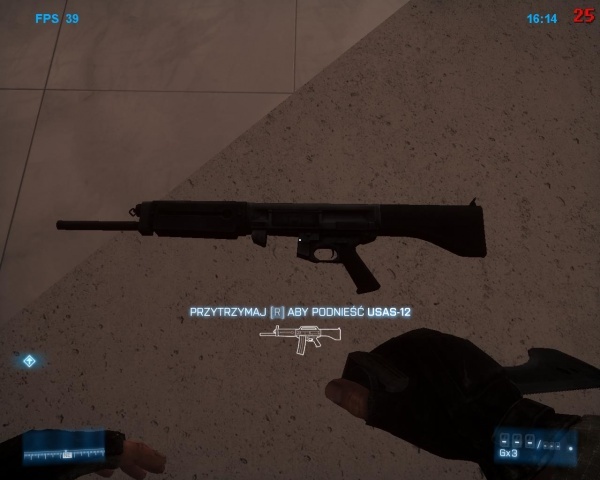 The AUG A3 idle. Note the underslung M320 grenade launcher. 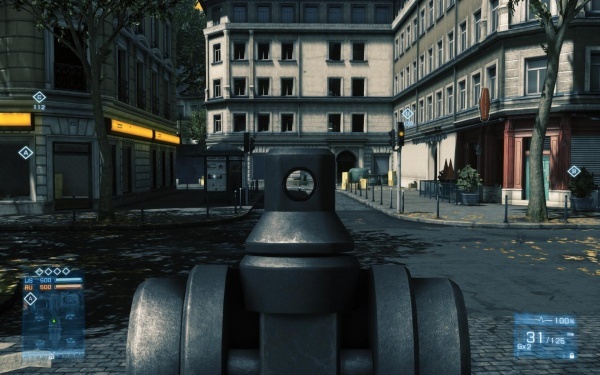 The AUG A3's iron sights. The AUG A3 mid-reload. 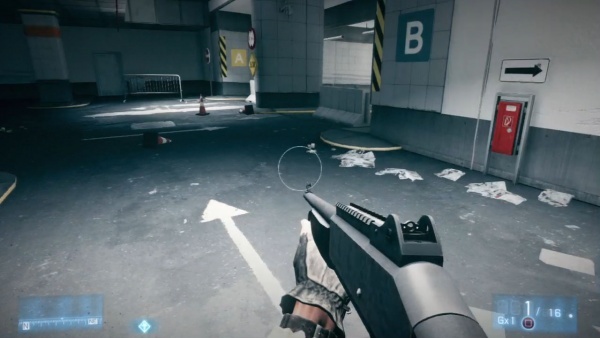 Note how the M320 clips through the trigger guard of the AUG. 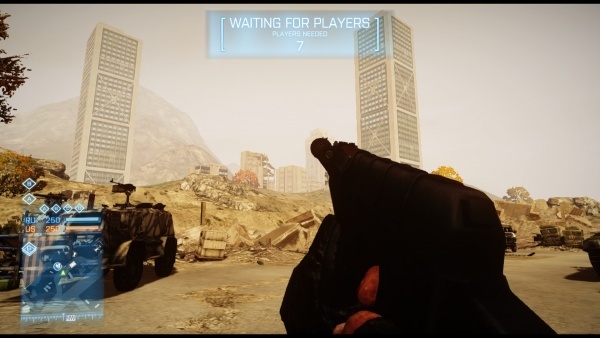 The IMI Micro Tavor MTAR-21 is a carbine added in the Close Quarters expansion pack. 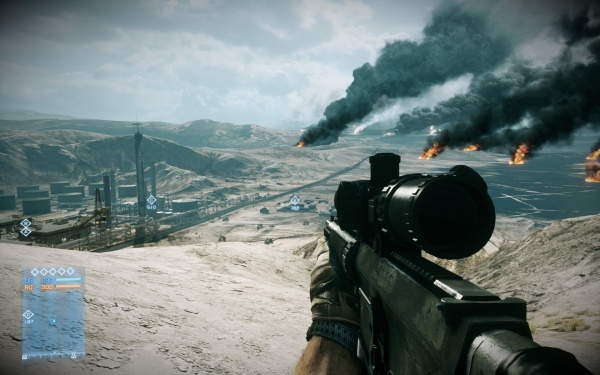 It features high recoil due to its short barrel and high rate of fire. 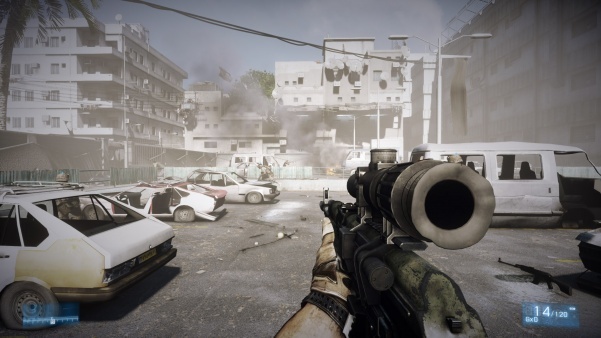 In CQB it's capable of mowing down enemies with little trouble due to its 900 rpm rate of fire, but the recoil severely limits its long range capabilities. IMI Tavor MTAR-21 with Meprolight red dot sight - 5.56x45mm. 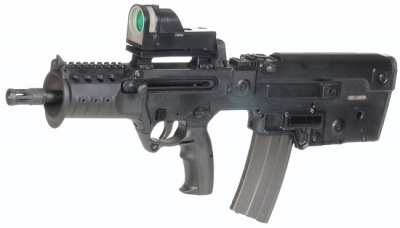 The IMI MTAR-21 idle, fitted with a Trijicon RX01 reflex sight. 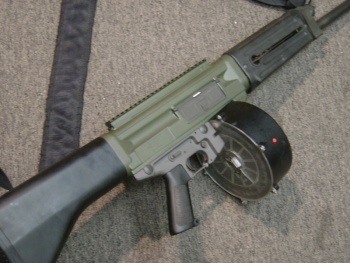 The MTAR-21 with its magazine removed. Note that since all rounds were expended, the charging handle is correctly shown in the rear position with the bolt locked back. Pressing the bolt release, which sends the bolt and charging handle forward. The Dog Tag awarded for 500 kills with the M320/GP-30 shows an M203 mounted to an M16A1, complete with the heatshield handguard. 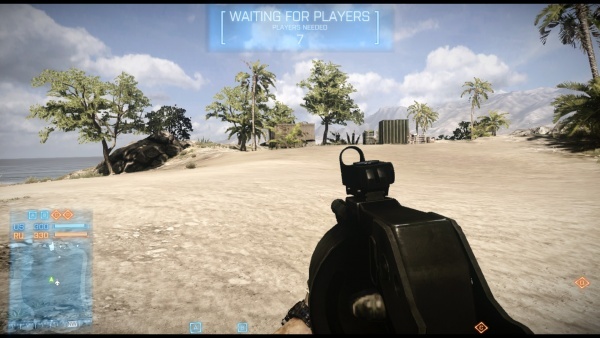 The Dog Tag the player receives for 500 kills with the M16A3/A4 shows an M16A2 instead. 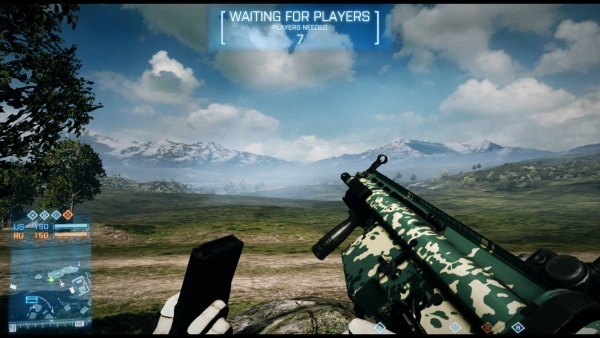 A FAMAS (G2?) 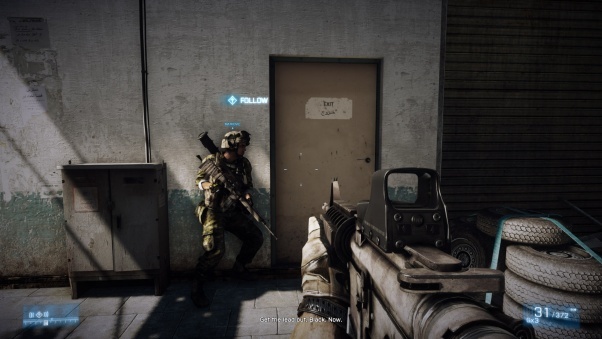 appears on the Dog Tag awarded for 500 kills with the FAMAS. 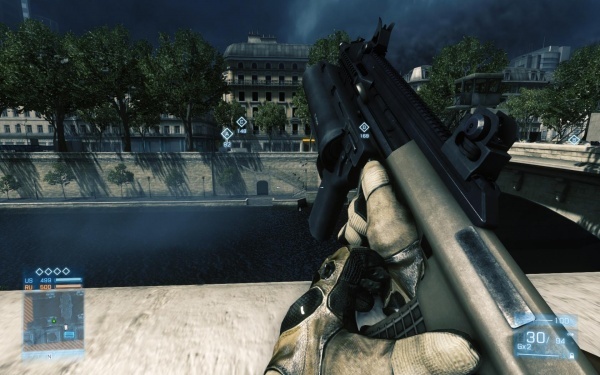 The standard version of the F2000, with its built in scope, appears on the 500 kill Dog Tag for the F2000 Tactical. 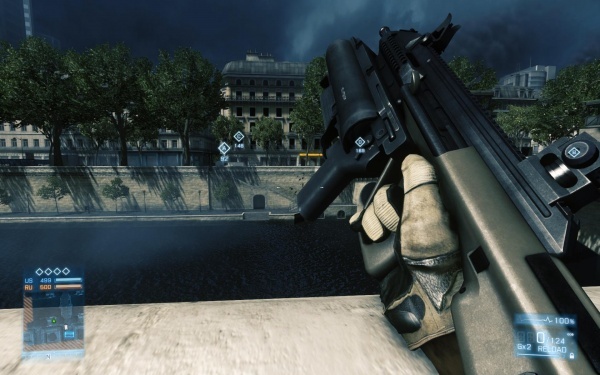 FN F2000 + FN GL-1. 100 kill. 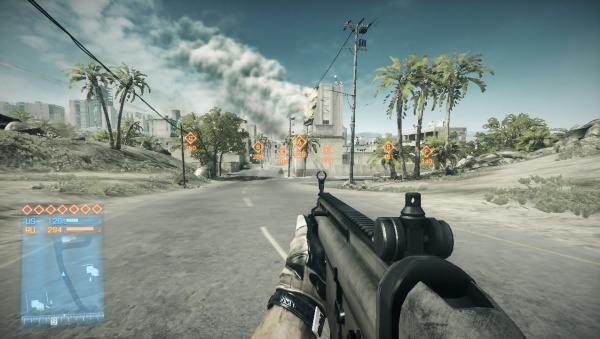 100 Kills with either the SCAR-H carbine or the SCAR-L assault rifle earns the player a SCAR-L dog tag. 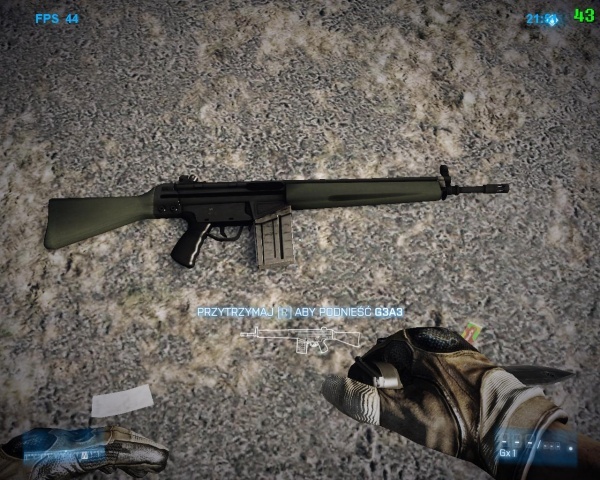 The release of the Close Quarters DLC (which introduced the SCAR-L) has not brought along a proper dog tag for the SCAR-H.
Heckler & Koch HK416 + M203. 100 kill. Heckler & Koch HK416. 500 kill. SIG SG 553. 100 kill. 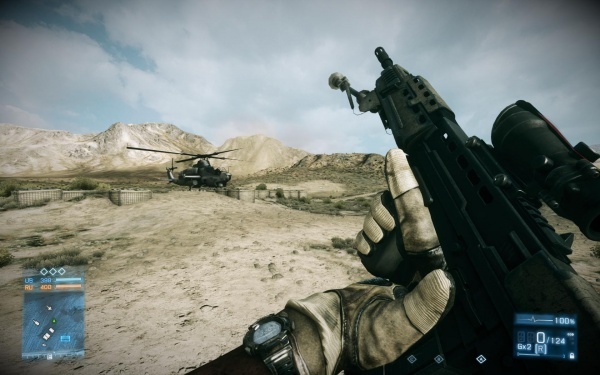 The Heckler & Koch M27 IAR is the starting weapon for the US support class, and uses a 45-round extended magazine. It is shown with a 4-vent handguard, but the correct extended barrel for the version is shown, the handguard simply covering less of it. Dmitri Mayakovsky holds an M27 IAR equipped with a Trijicon RX01 reflex sight and tactical light in the mission "Kaffarov." The modeling error of the charging handle backside being modeled completely solid can also be seen here, as on the HK416 and HK417. 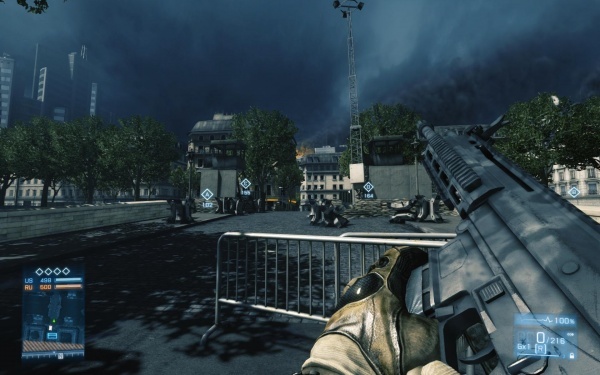 The LSAT Light Machine Gun is a light machine gun added to Battlefield 3 through the Close Quarters expansion pack. 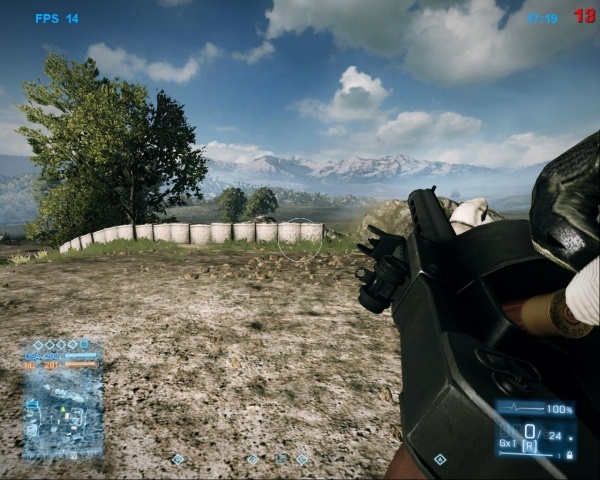 In-game it uses the configuration that loads polymer-cased ammunition. 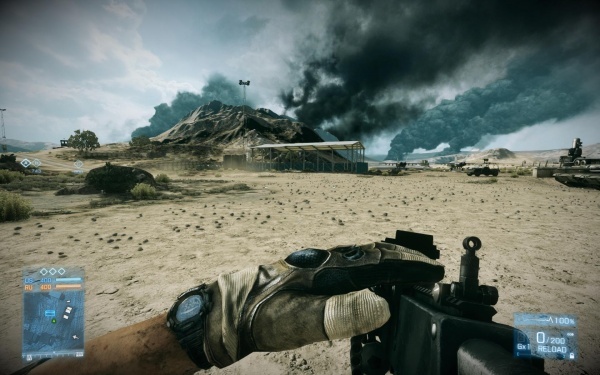 It is unlocked by completing the "Point Blank" assignment, which involves 10 kills with C4 and 10 knife takedowns. 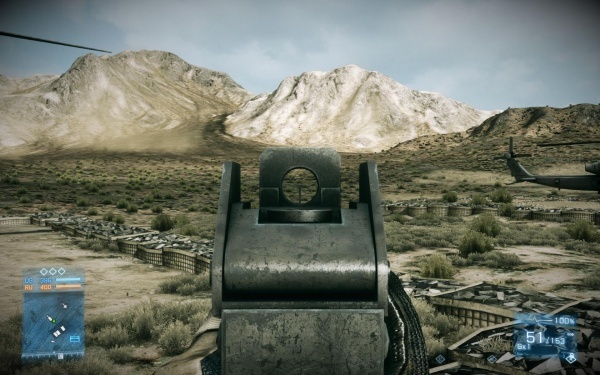 The LSAT LMG's iron sights. 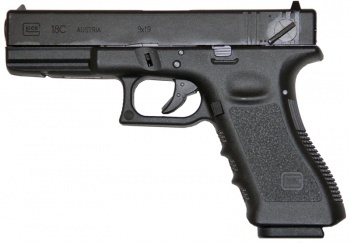 The rear sights are modeled after the KAC folding 600m. 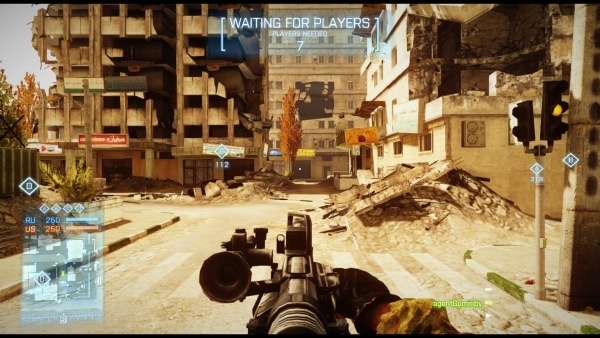 The M240B appears in the hands of some US Marines, and in the hands of the player character, fitted with an EOTech Holographic Weapon Sight (HWS). 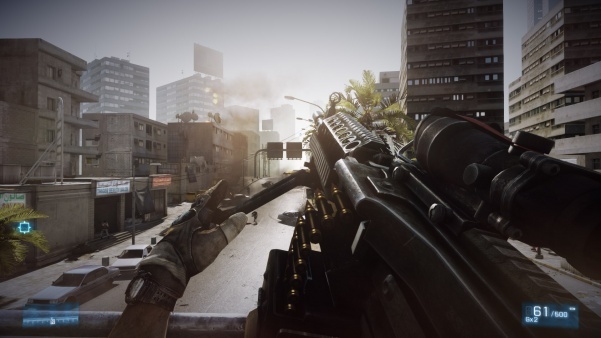 The trailer shows the weapon as having a deployable bipod which can be used to increase accuracy during prolonged firing, at the cost of player mobility. One of Blackburn's fellow Marines, Montes, holds his M240B fitted with an M145 Machine Gun Optic. 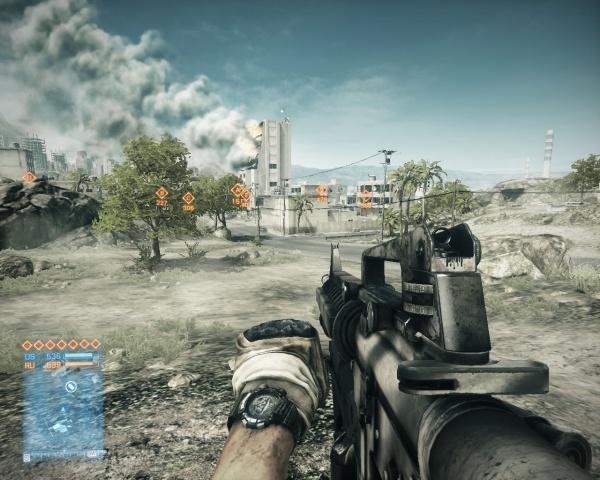 The player character in multiplayer holds an M240B with M145 Machine Gun Optic. 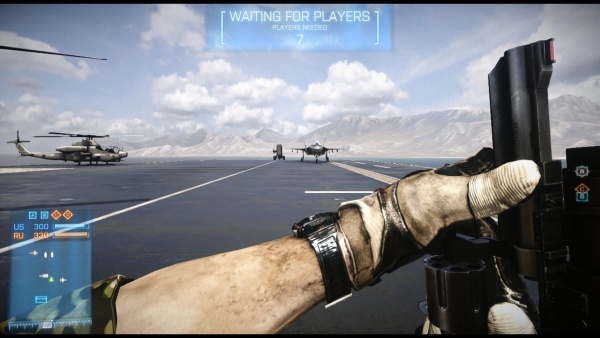 Note that the ammo box would block the ejection port in real life. Pulling the charging handle back at the start of a reload. Placing the belt into the feed tray. 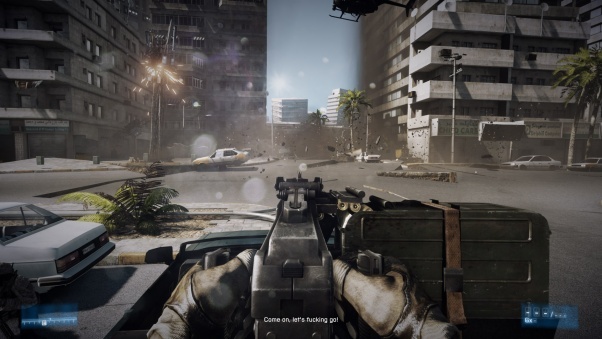 An M249E3 Para SAW is featured in the game. 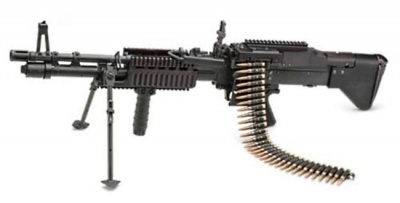 It has a STANAG magazine well, identifying it as an M249 rather than a Mark 46, but the fixed buttstock and rail system are features of the Mk 46 Mod 0. This configuration is typical of Airsoft "Mk 46" guns which have Mk 46 features but retain their STANAG wells. Blackburn holds the hybrid SAW near the end of Operation Swordbreaker. Note the STANAG magazine well visible under the belt. Blackburn sets up the bipod of his SAW. The M60E4 is the last MG to be unlocked in the Support kit. 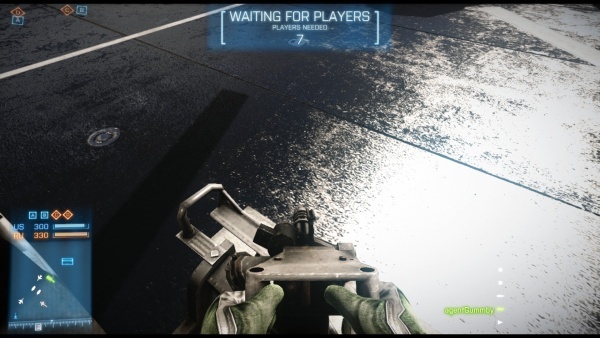 Extended magazines gifts the weapon with a massive 200 round box and this is visually shown on the weapon when attached. Dmitri Mayakovsky holds an M60E4 with M145 Machine Gun Optic as Kaffarov's bodyguards have the brilliant idea of firing an RPG-7 indoors. The QBB-95 is included in the Back to Karkand expansion pack, and can be used by the Support kit. 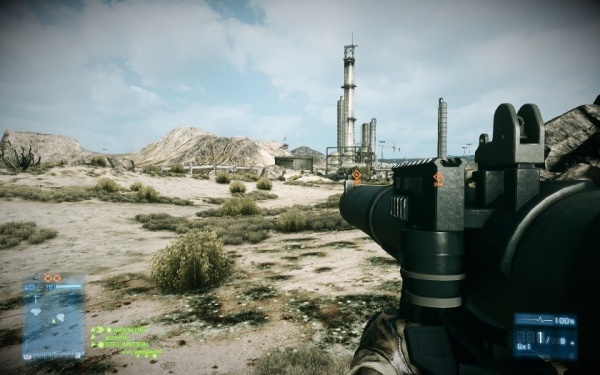 It uses 75-round drums, and has the highest capacity of any weapon in the game besides belt-fed LMGs. 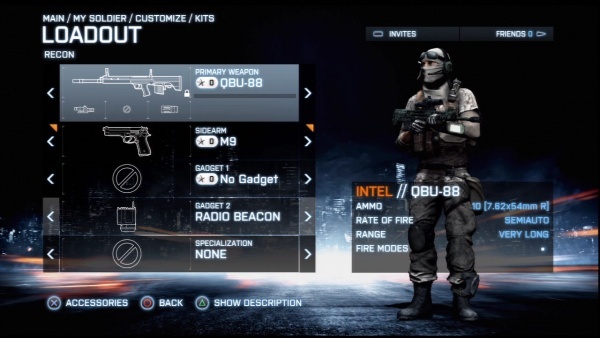 QBB-95 on the customise menu. 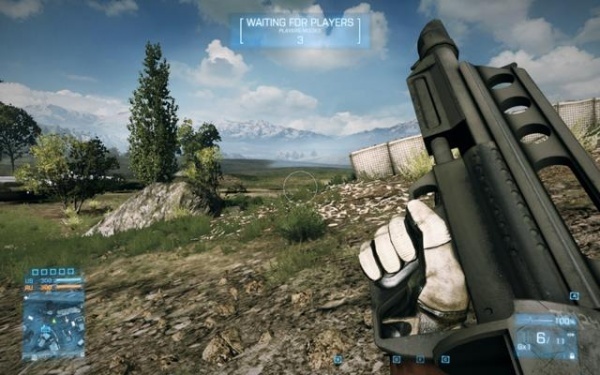 The QBB-95 fitted with a PKA-S holographic sight. Inserting a fresh drum magazine into the QBB-95. 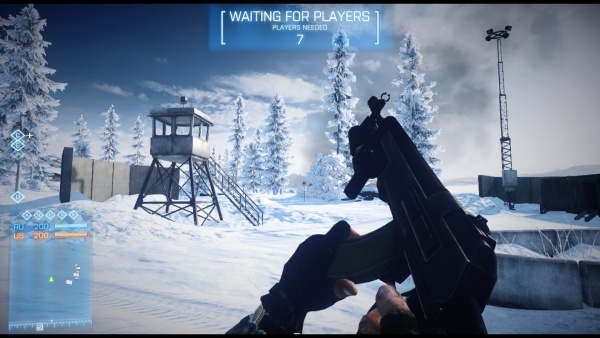 The Norinco QJY-88 returns from Bad Company 2, once again called the "Type 88". This isn't wrong per se (the weapon is named "Type 88 GPMG" in Chinese), but quite odd, as the QBZ-95B, QBB-95, and QBU-88 all use their proper "QB" designations. Dmitri Mayakovsky discovers a QJY-88 with the rare and for some reason unpopular linoleum-plated finish. 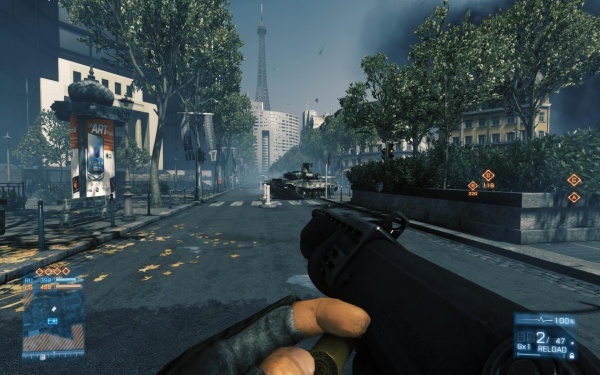 The PKP Pecheneg appears in the game. 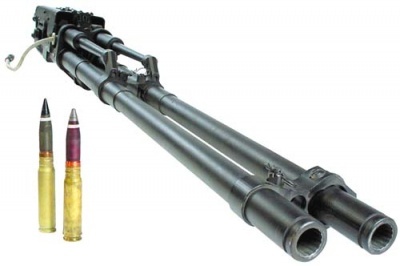 It features high stopping power like other 7.62 weapons, and is more accurate than other LMGs, but has a sharp vertical recoil and less than optimal mobility due to its weight. 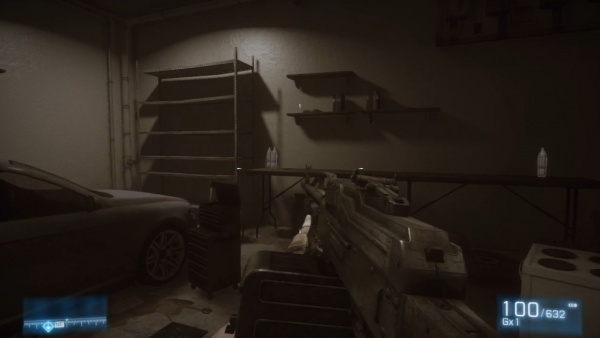 Blackburn holds a PKP Pecheneg as he infiltrates someone's garage in "Operation Guillotine." Dmitri Mayakovski uses his PKP Pecheneg to make some amendments to the internal layout of a building. Mostly new doors. 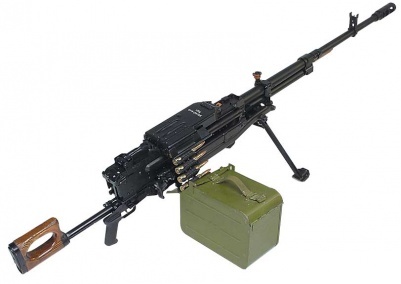 The RPK light machine gun is the starting weapon for the Russian Support class. It is referred to in game as an "RPK-74M", a modernised 5.45x39mm version with synthetic furnishings and a flash hider, despite that it is shown with a 7.62x39mm magazine and no flash hider. 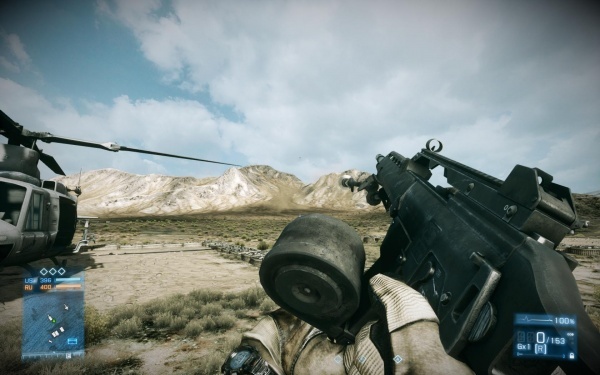 The weapon's damage matches the idea that it is a -74 model, as it is scaled to the 5.56mm machine guns, as opposed to behaving like a 7.62x39. When mounting optics the weapon gains side-mounted bracket for attaching them; if it does not mount optics, the bracket is not present. It can sometimes be found fitted with a vertical front grip attached to the underside of the handguard. 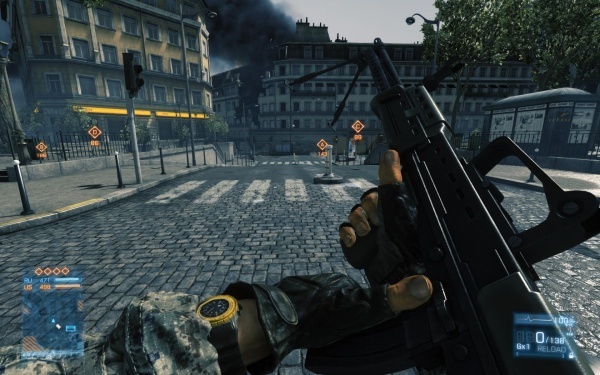 Blackburn holds an RPK equipped with a Kobra reflex sight during "Uprising." Blackburn looks down at an RPK on the ground; note the lack of a rail under the handguard. Despite this, it can still mount a RIS foregrip. Reloading an RPK fitted with an odd aftermarket bipod; the real RPK bipod is fixed just behind the front sight and folds backwards. 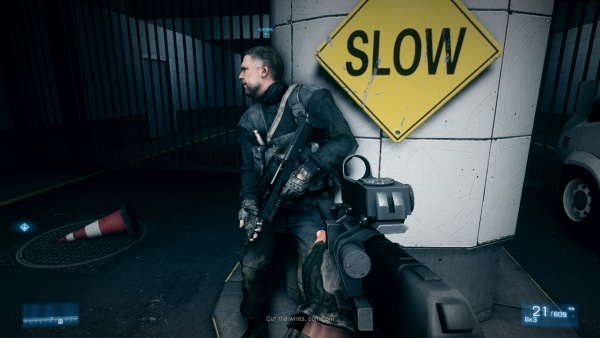 This bipod is actually shorter than the magazine and therefore would not be particularly useful. 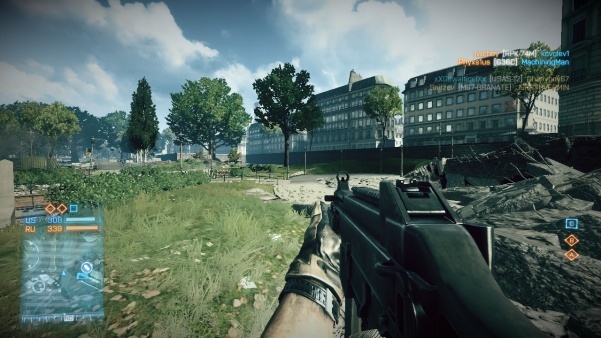 The Enfield L86A1 is a weapon added as a part of the Close Quarters DLC. In game it's named the "L86A2" and features a 45+1 magazine, despite being modelled with a 30 round one. Like in Call of Duty: Modern Warfare 2 its rear foregrip is unused. 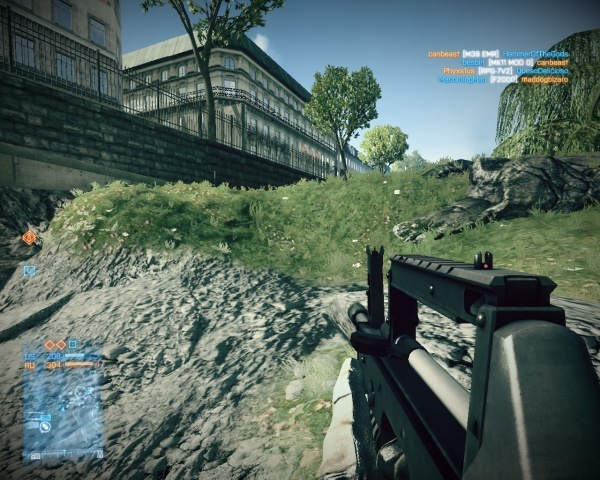 In game it handles much like the L85A2. 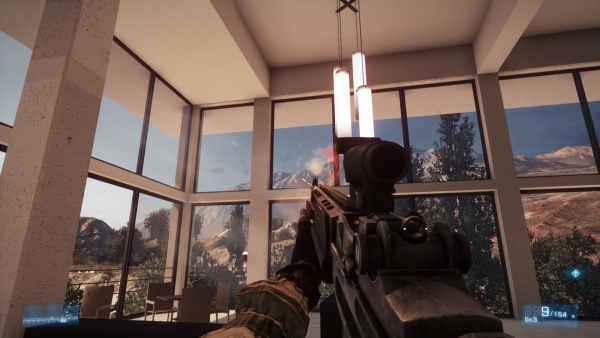 Its low rate of fire is balanced by its low recoil. It comes with a bipod by default. 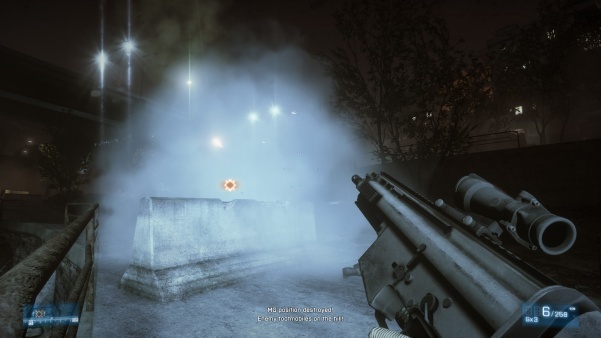 Despite the fact that BF3's "MG36" is a hybrid of G36 variants, a configuration correct for an actual MG36 appears on the Dog Tag the player is awarded with for getting 500 kills with it. 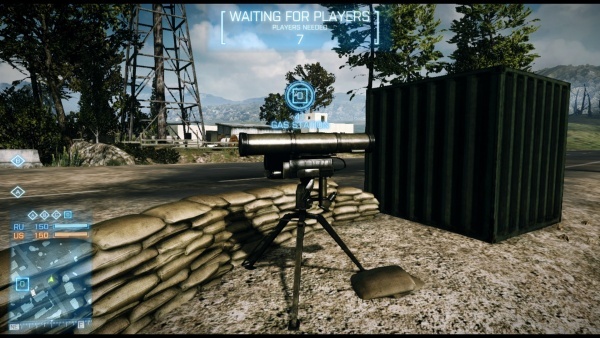 Unusually, Recon players can opt for low-magnification optics, unmagnified reflex/red-dot sights, or even iron-sights in lieu of the standard high-magnification optics. 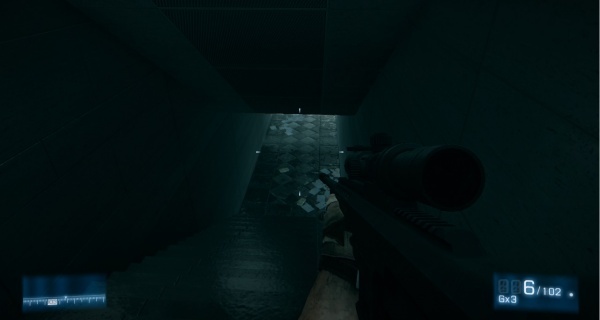 The M98B is the last bolt action unlocked. 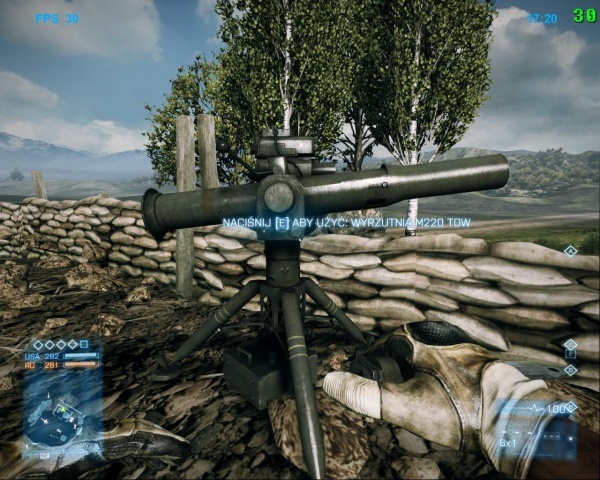 It is incredibly accurate and powerful, but is heavy and suffers from substantial sway unless a bipod is used. 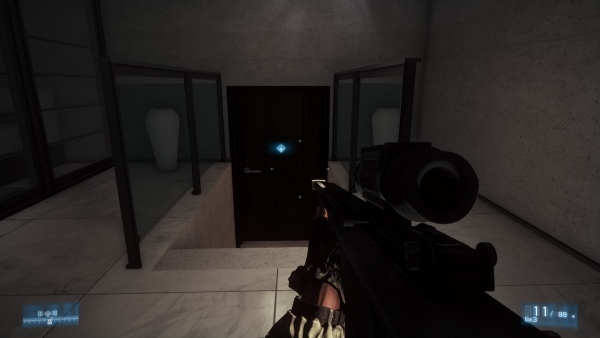 For balance reasons the magazine capacity is limited to 5 rounds instead of the real world's 10. Good plan on the icon and world model. 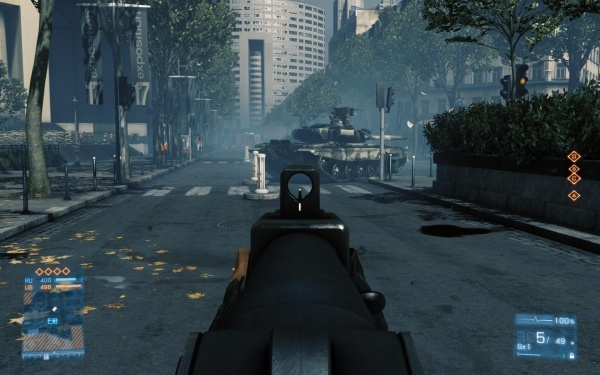 Blackburn uses an M98B with the bipod set up as he assaults the bank at the end of "Operation Guillotine." View through the Barrett M98 scope. Blackburn has M98B at the entrance to the basement of the bank. 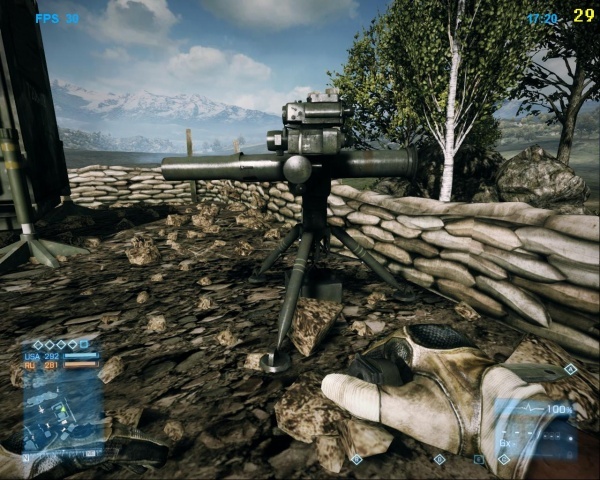 The Barrett M107 is available in the game, however, DICE felt that the .50 caliber round it uses would either be overpowered if depicted properly, or feel useless if kept balanced, so they opted to simply not have it in multiplayer. 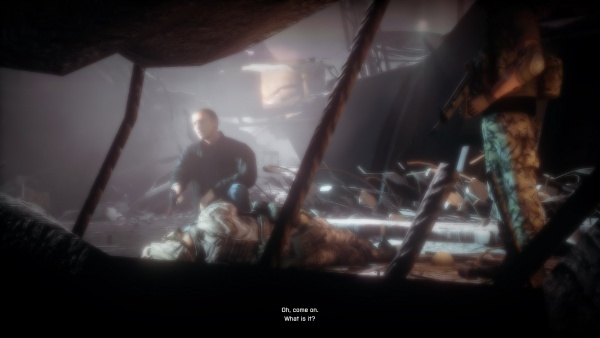 It only appears in the singleplayer level "Kaffarov", where player character Dmitri Mayakovsky acquires it due to a somewhat bizarre series of events that don't seem to play out quite the way they were intended to. Here, it is equipped with a thermal scope. In the room before Dmitri Mayakovsky is actually supposed to get the M107, he acquires the M107 by approaching the door. 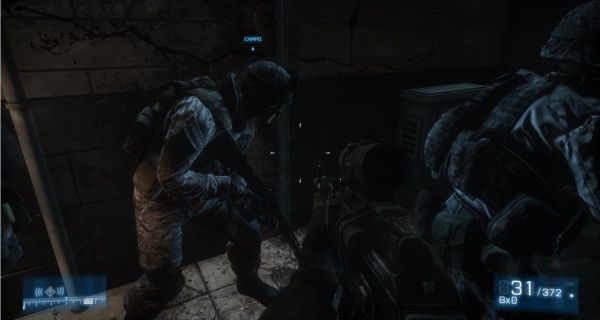 On opening the door he finds an enemy sniper kindly carrying the M107 he already has, with the barrel pretending to be a bipod and the magazine very badly wanting to be the pistol grip. "Thank you, I had no idea why I was carrying that." Dmitri Mayakovsky thanks the man by murdering him with his own SV-98 and proceeds onward, armed with the M107. ...then pulling on the charging handle. 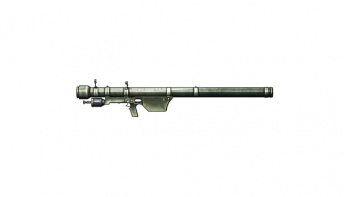 World model of the M107. 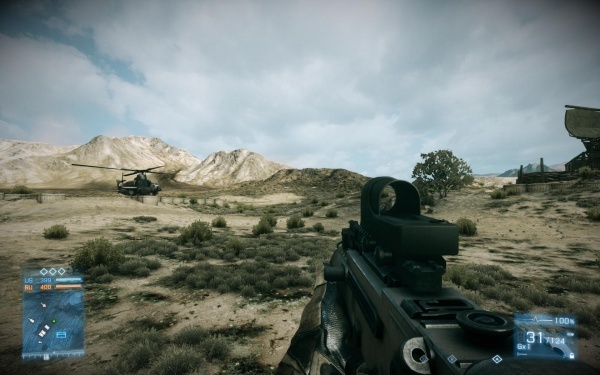 The Accuracy International AWM-F is included in the Back to Karkand expansion pack as the "L96" (the British designation of the Accuracy Internation Precision Marksman; the actual British designation of the AWM is L115A3), and can be used by the Recon kit. True to its reputation, the gun is extremely accurate at long ranges, with minimal bullet drop allowing for precise headshots. Its ballistics are modeled after the L96A1's 7.62 NATO chambering rather the the AW Magnum's .338 Lapua. AWM-F on the customise menu. 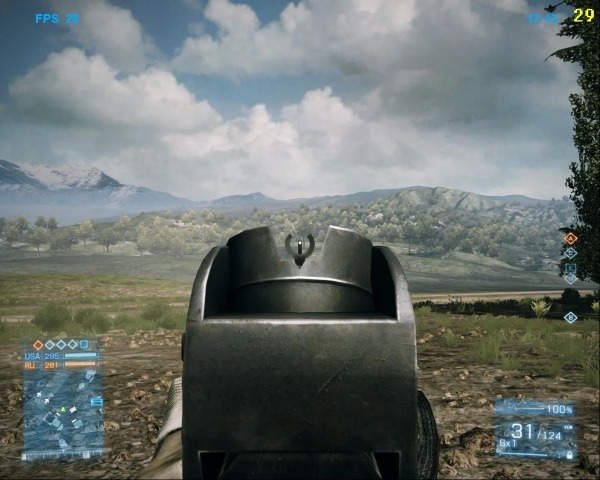 The "L96" idle with iron sights. Note the Airman camouflage. 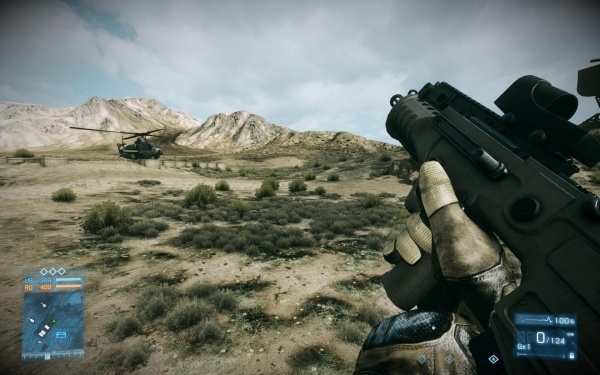 The MKEK JNG-90 was included for the Recon class in the Close Quarters expansion pack. 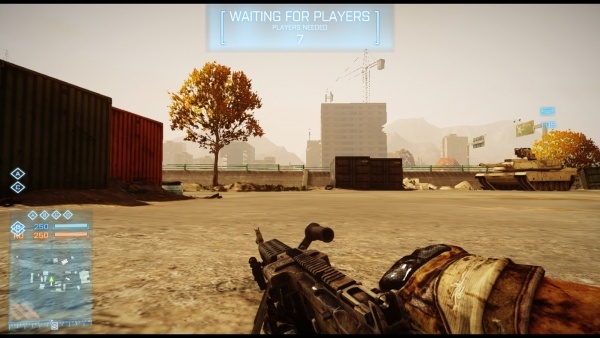 To acquire it, the player would have to complete an assignment. The MKEK JNG-90 fitted with a Russian PKS-07 scope. Pushing the bolt back into place. 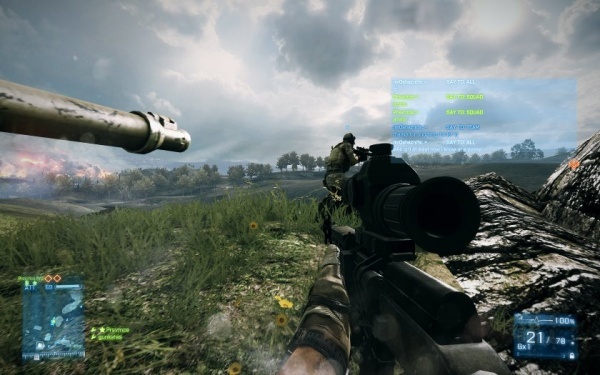 The JNG-90 seems to use the same reload animation as the L96. 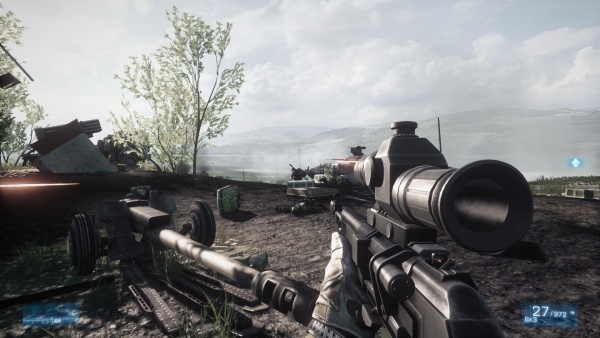 An M14 with a Sage stock appears as a sniper rifle in the "Recon" class, though it is incorrectly referred to as the M39 EMR. 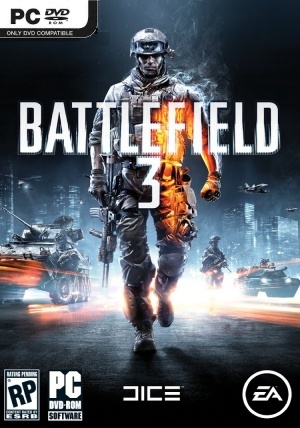 It is unlocked when the player receives 58,000 Co-Op Score. M39 Enhanced Marksman Rifle - 7.62x51mm NATO, for comparison. Note the longer gas cylinder below the barrel. Dmitri Mayakovsky holds an M14 rather curiously equipped with a Russian PK-AS optic as he looks around Kaffarov's villa. He might be a bad guy, but he sure knows how to keep the place neat. 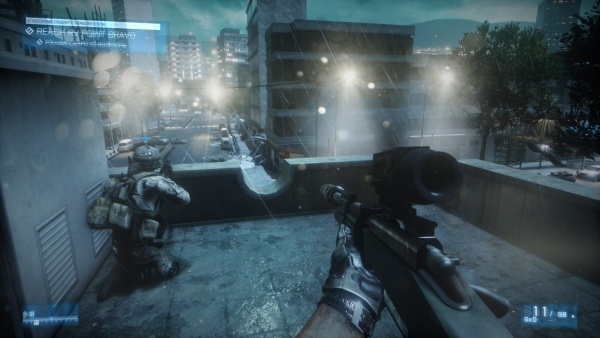 The player character in multiplayer simultaneously reloads the M14 and demonstrates that Battlefield 3 does not necessary require you to have a sniper scope on your sniper rifle. 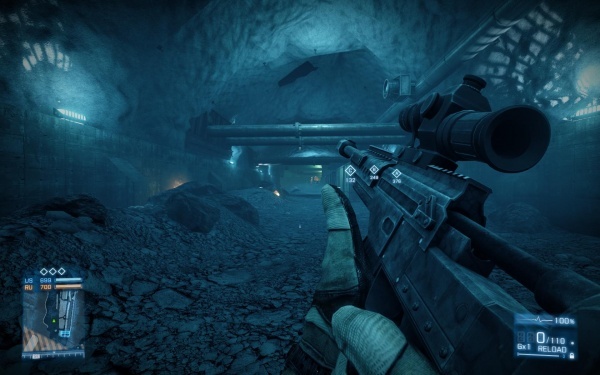 The M40A5 Sniper Rifle is the second bolt-action rifle unlocked for the Recon class. It has lower muzzle velocity than the other bolt-action rifles, but benefits from the fastest cycle time between shots and moderately low sway. 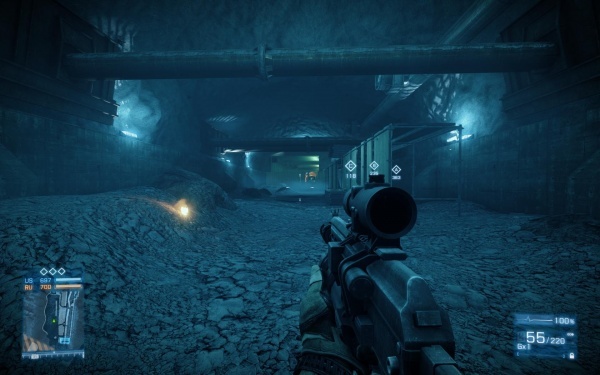 Blackburn holds a suppressed M40A5 fitted with an IR scope during the mission "Night Shift." 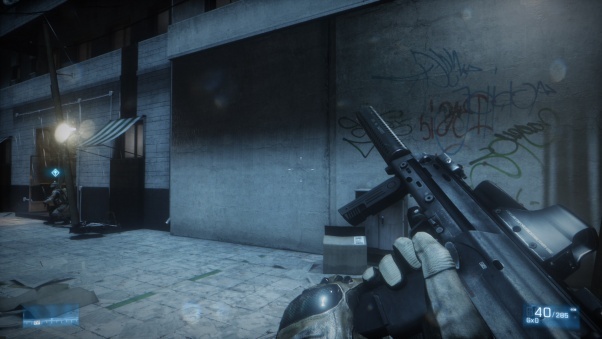 The Heckler and Koch HK417 is added in the Close Quarters expansion pack. Much like the HK53 and the HK416, it lacks the 'HK' prefix and is instead called the M417 in game. 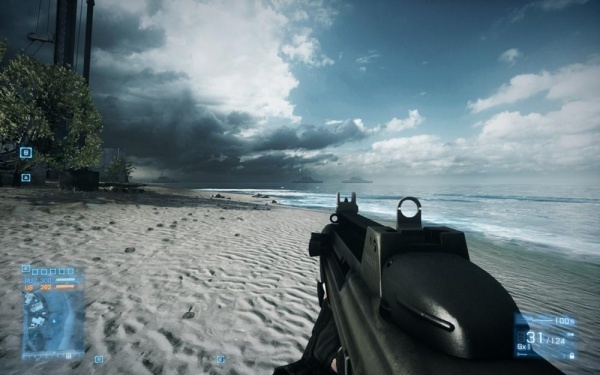 It's limited to semi-automatic fire in game and features a 20 round magazine. 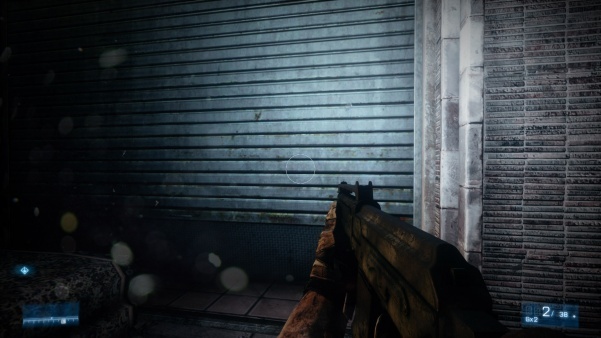 In game it performs as a hybrid of the Mk11/M39/SVD and the SKS. 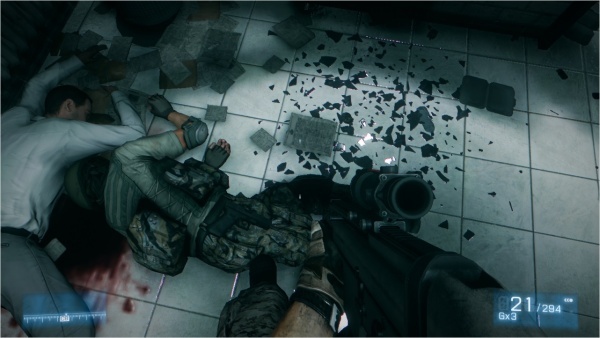 It has the damage of the MK11/M39/SVD with the capacity of the SKS and a rate of fire that's inbetween the two. 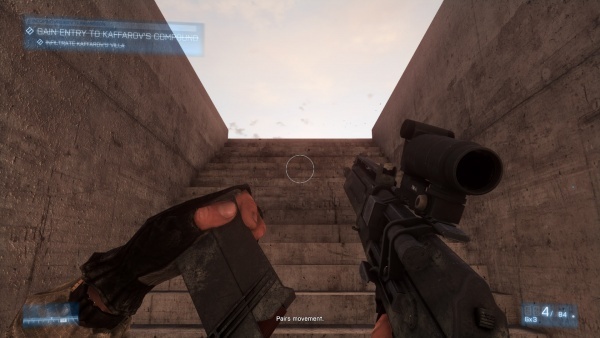 It has manageable recoil, and comes with a 8x scope by default. It comes correctly equipped with early-production 20-round HK417 magazines, but are colored grayish instead of transparent. 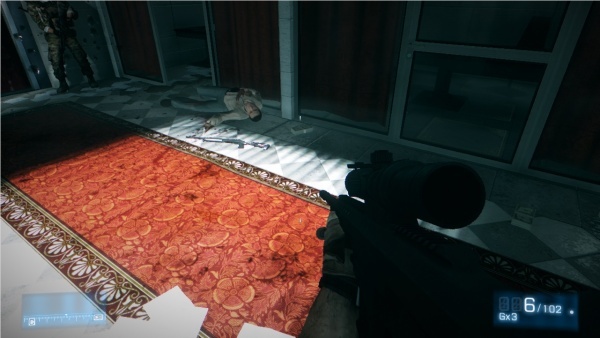 This can be easily seen by looking at the magazine while crawling. 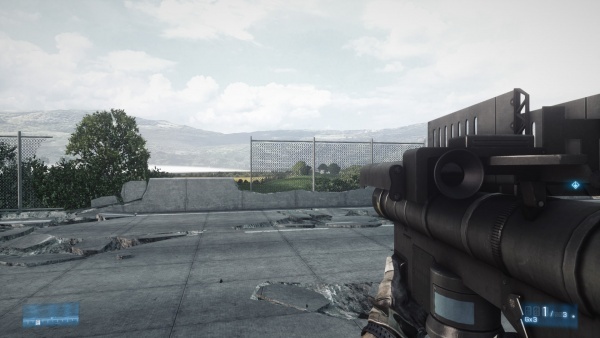 The "M417" idle, equipped with an 8x scope. Like M27 and HK416, the backside of the charging handle is modeled completely solid. 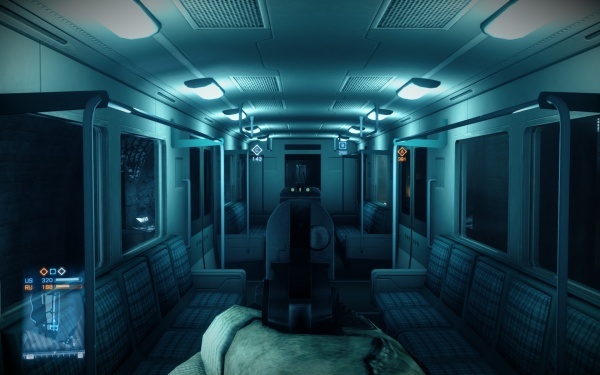 The Mk 11 Mod 0 can be found occasionally in the single-player campaign. 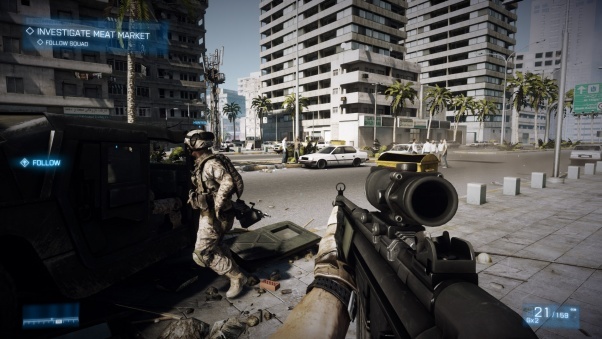 It is the default rifle for the US Recon kit in multiplayer, outfitted by standard with a 8x rifle scope. 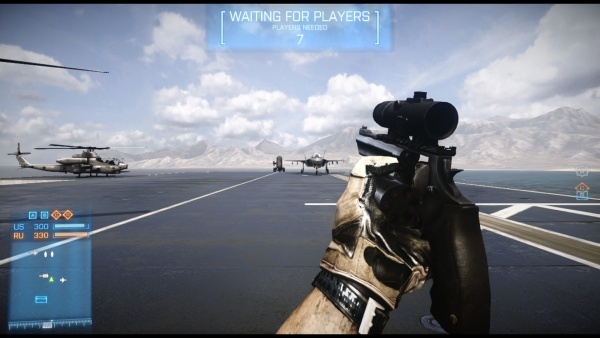 Blackburn holds a scoped Mk 11 Mod 0 during the mission "Operation Swordbreaker". 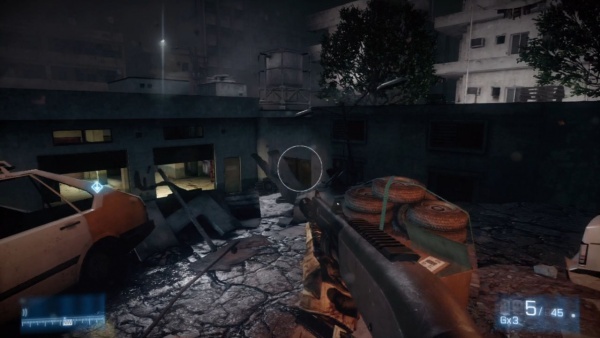 Campo holds Mk 11 Mod 0 with a silencer and red-dot sight in the mission "Night Shift". 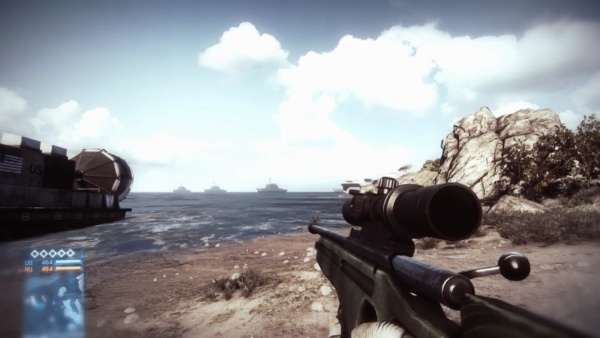 A Marine sniper in multiplayer provides some overwatch with his scoped Mk 11 Mod 0. ...and hits the bolt-release. 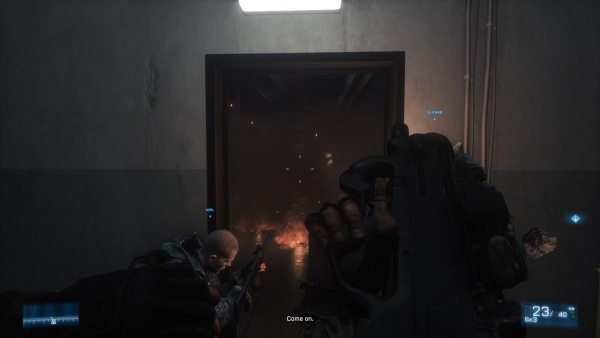 Note that the fire-selector is set to safe. Icon and world model for the Mk 11 Mod 0. 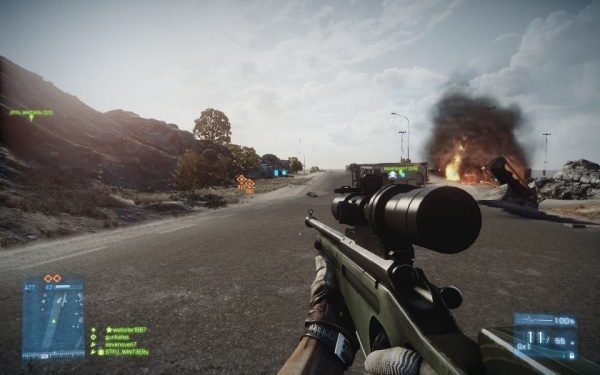 The .308 variant of the Norinco NDM-86 returns from Battlefield Play4Free, once again appearing as the SVD It is default for the Russian Recon Kit sporting a PKS-07 7x Scope by default, though the correct PSO-1 4x scope is the first attachment unlocked at only 10 kills. 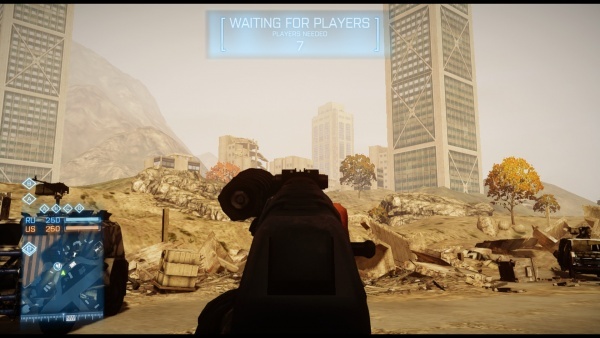 The player character in multiplayer holds an NDM-86 fitted with a PKS-07 scope. 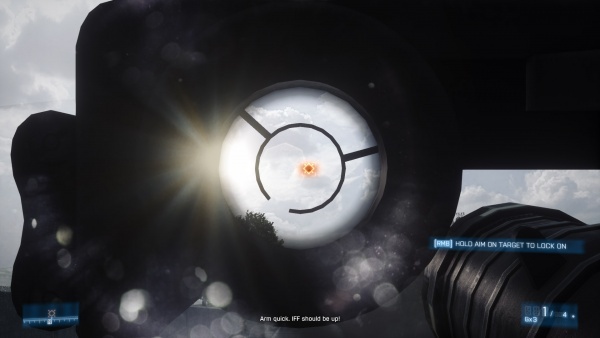 Aiming through a PSO-1 scope mounted on a NDM-86. Releasing the bolt (it properly locks back upon empty). 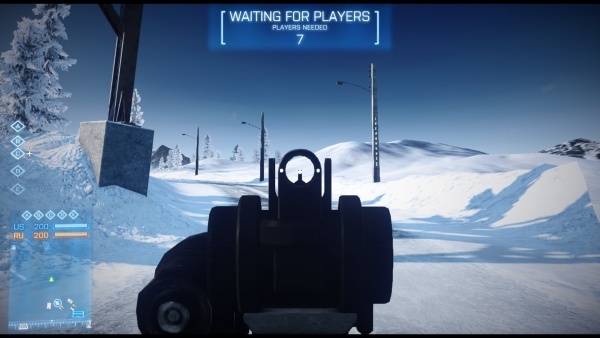 Iron sights of the NDM-86, looking into a surreal artifact of the Xbox 360 version running on the Xbox One emulator. 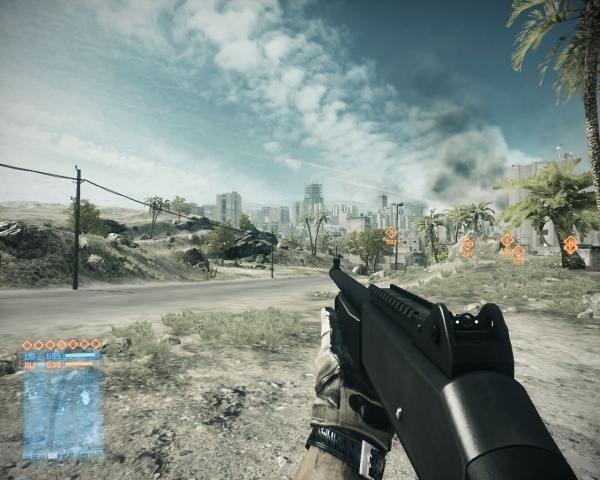 The QBU-88 is included in the Back to Karkand expansion pack, and can be used by the Recon kit. 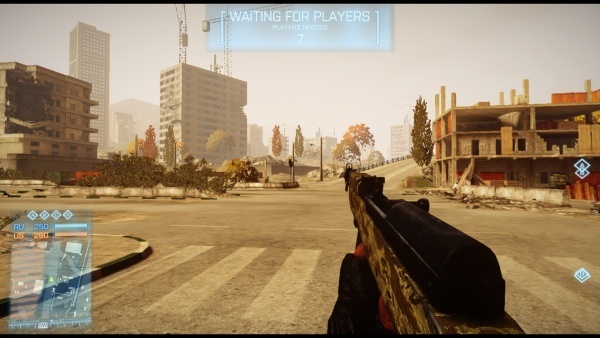 The QBU-88 on the customiztion screen, note the game claims to it being chambered in 7.62x54R which has since been patched to show the correct 5.8x42mm ammuntion. 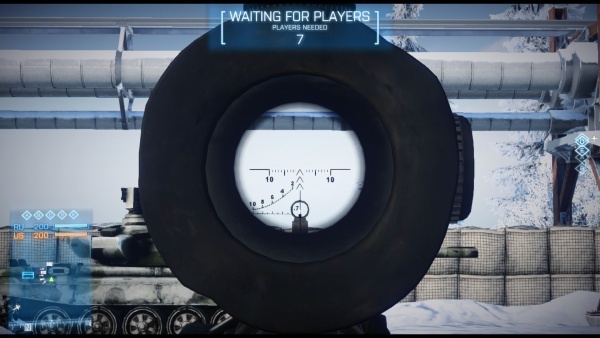 The QBU-88 Idle, fitted with a PKS-07 7x scope. Reloading. 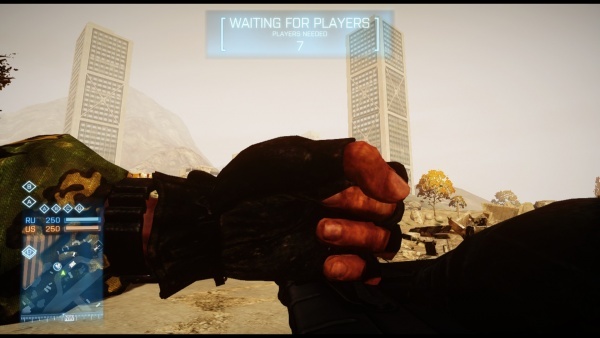 The character will first grab a new magazine, then pull out the dry one with the fresh one still in hand, then proceed to insert it, as seen here. 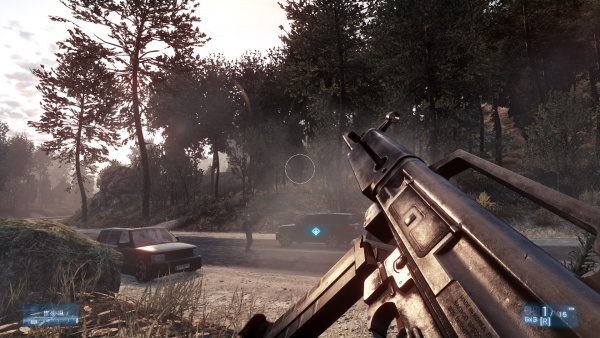 The Yugoslavian M59/66 variant of the SKS appears in-game, with synthetic Tapco furniture and uses 20 round magazines. It can be identified as the Yugoslavian variant by the design of the front sight with an integrated grenade sight, and by its muzzle device. 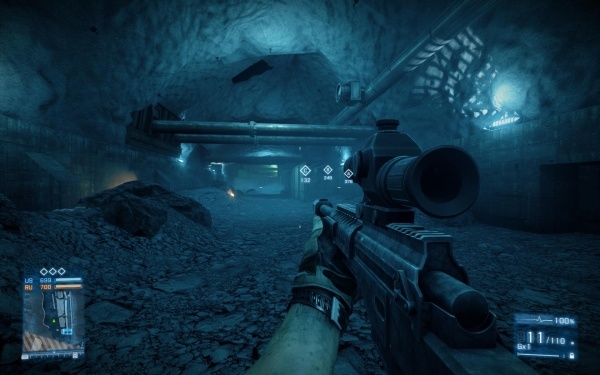 It is a good choice for close range compared to other Recon-class rifles due to its higher mobility/low weight, 20-round capacity and low recoil, at the cost of less hitting power and range. M59/66 SKS on the customise menu. 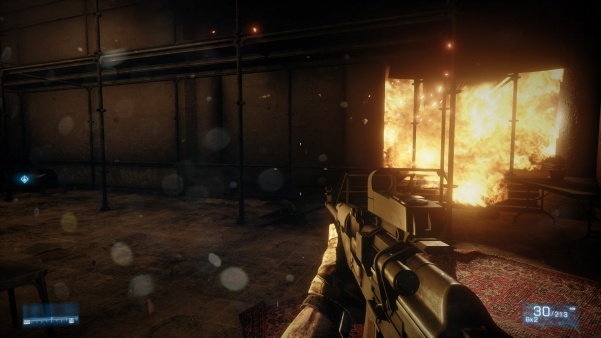 The player character in multiplayer holds an M59/66 SKS as he ponders if there might be a tank nearby. Iron sights of the SKS. 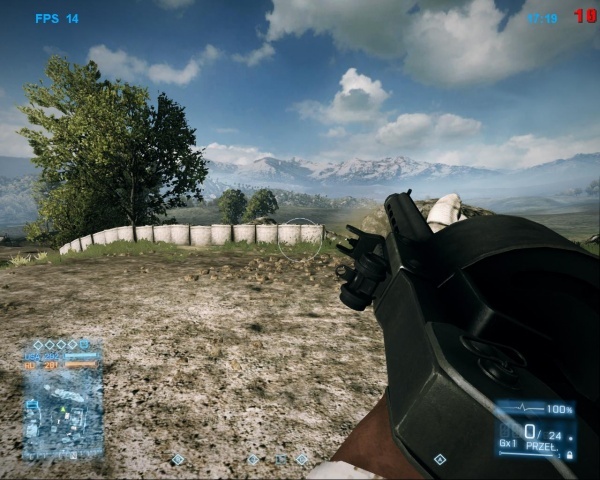 The SV-98 returns as the first unlockable bolt action rifle, with the best mobility and close-up performance among bolt-action rifles. 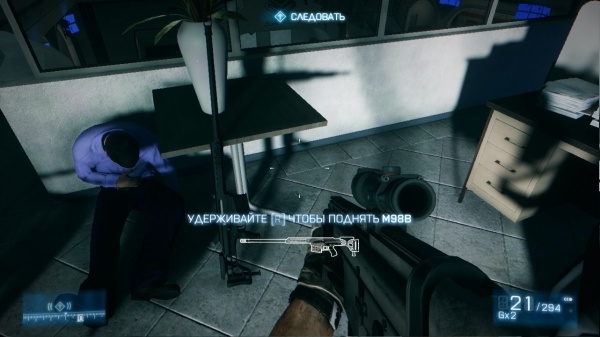 During an extremely confusing QTE, an enemy sniper holds an SV-98. 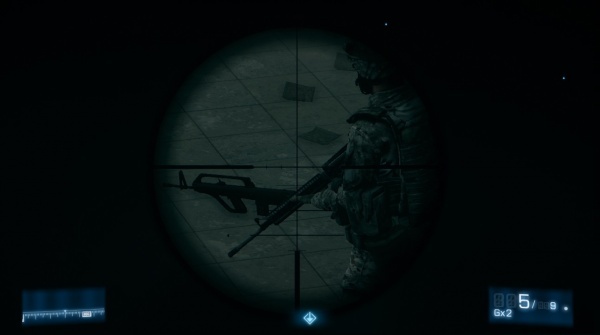 SV-98 fitted with the unnamed 12x scope, without a bipod. 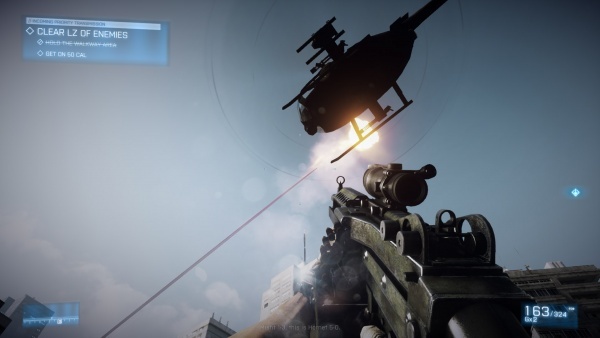 The Javelin appears and can be used in either top-down or direct-fire modes, and obviously needs a lock to fire. 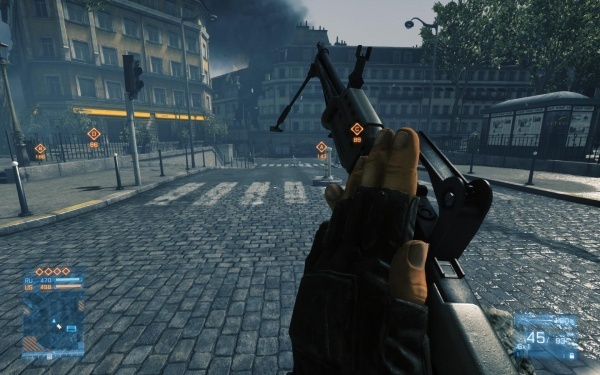 In the campaign, Blackburn uses one during "Operation Guillotine;" here it has infinite ammunition. During the latter sequence, the Javelin is shown firing at absurdly short range; in real life it has a minimum range of around 250 feet. Harassed by tanks during "Operation Guillotine," Blackburn comes across his salvation in the form of an FGM-148 Javelin launcher. Blackburn holds the Javelin. Note the help text misidentifies it as a SMAW. Interestingly, if the M320 is mounted to a Russian weapon, it instead becomes a GP-30. 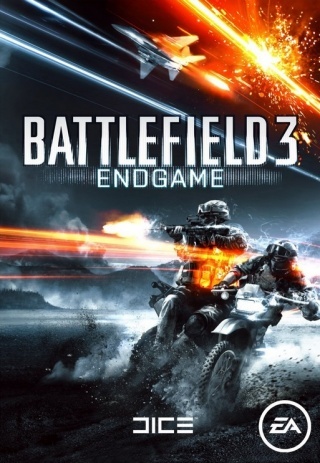 It is also correctly depicted firing VOG-25 caseless rounds, as the launcher is not flicked downwards to eject the spent casing as is common in first person shooters. 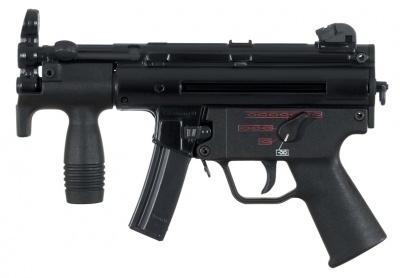 The Heckler & Koch M320 is the standard grenade launcher and can fire standard HE rounds, buckshot, or smoke rounds. 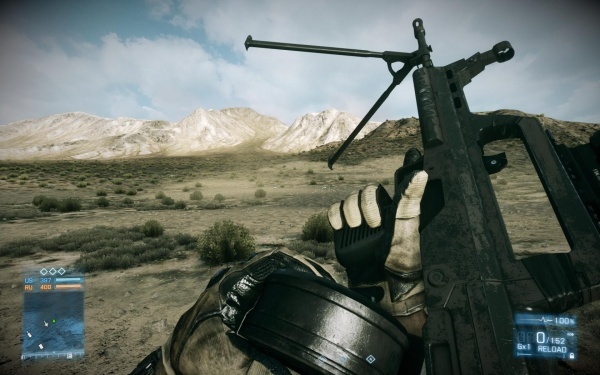 It can either be mounted on the rifle, or standalone. 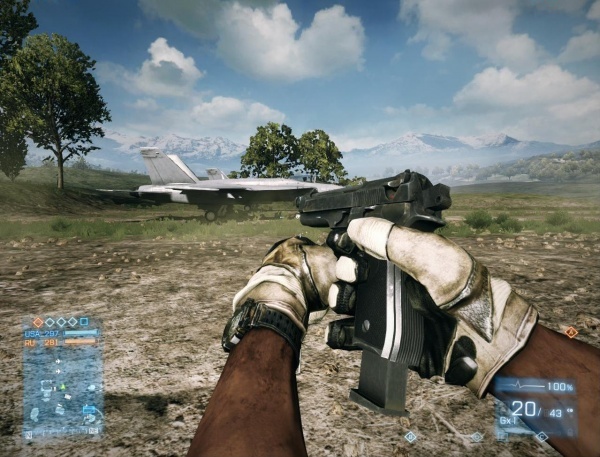 Blackburn holds a standalone M320 at the start of "Operation Guillotine." 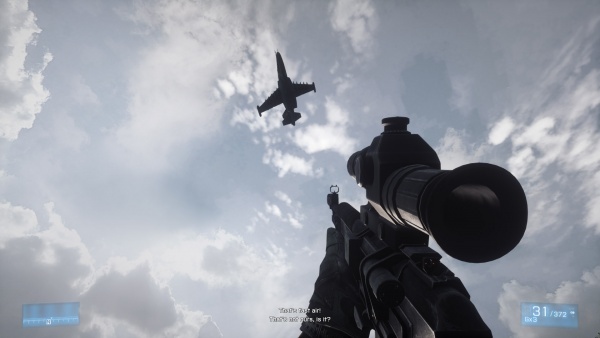 This appears to be randomly dropped by US infantry in this area. As usual for an FPS protagonist, Blackburn is of the "pick a random notch and use it like a regular iron sight" school of leaf sight use. Reloading the standalone M320; note the front grip visible and the fire selector always set to safe. Blackburn reloads the M320 mounted under his HK416. 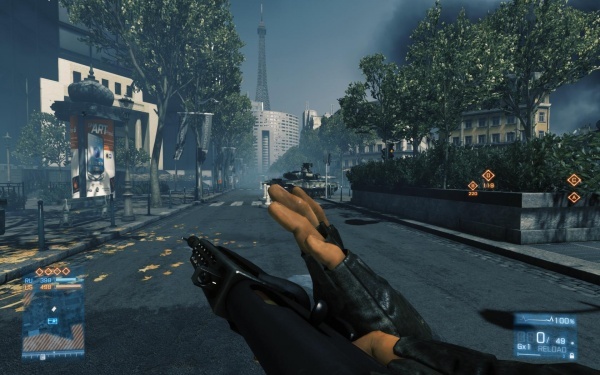 Note that here he is removing the "spent" round; there appears to only be one grenade round model, so the fired round is shown unfired. 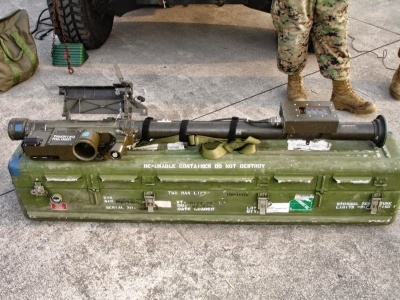 The Pansarskott m/86, a Swedish version of the M136 AT4 with a folding front grip, appears in the hands of US Marines. 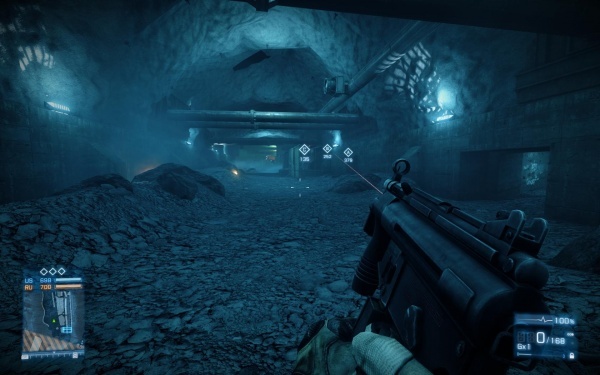 The m/86 only appears in the Singleplayer campaign. It is incorrectly referred to as an "RPG". 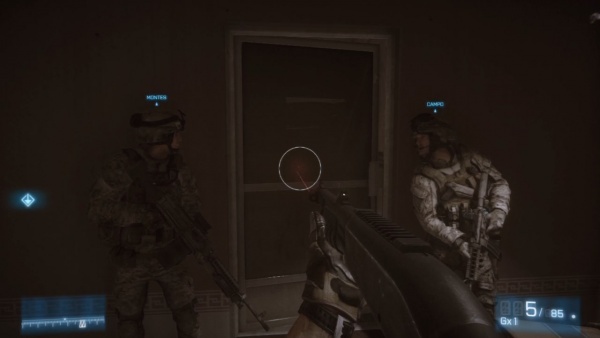 Blackburn readies a Pansarskott m/86 as the squad try to take out a sniper hidden in a hotel. The results are fairly predictable. "Good effect on target!" 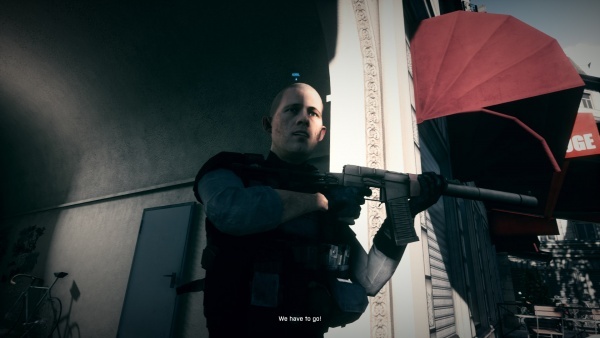 Throughout the campaign, Matkovic carries a Pansarskott m/86 on his back. 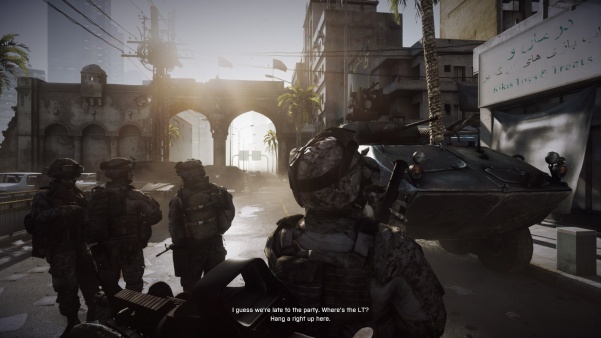 At the start of "Operation Guillotine," Blackburn is tasked with briefly carrying an M224 Mortar as he advances with his fellow Marines; here it cannot be used by the player, and is used by NPCs to fire illumination rounds during the night-time mission. 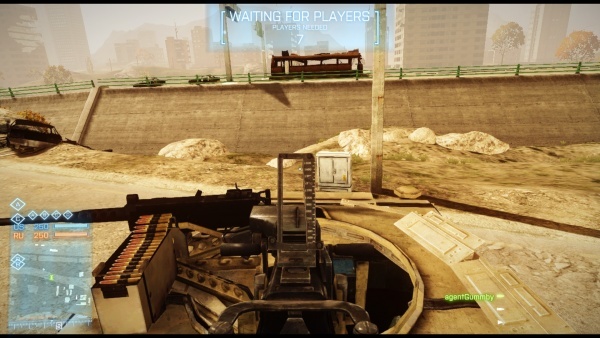 In multiplayer it can be used by the Support class; the M224 in multiplayer has infinite ammunition and can fire smoke or HE rounds. In singleplayer, it is shown with no baseplate fitted, which would make it practically impossible to actually use. 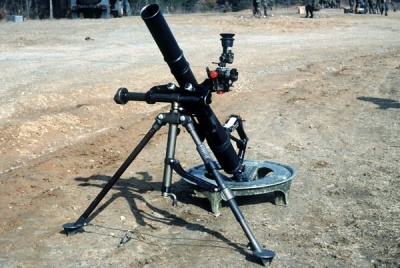 Blackburn looks at the set-up M224, wondering when he can have a go. 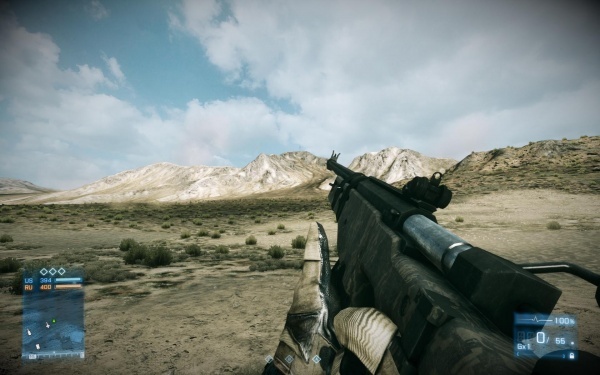 The Mk 153 Mod 0 SMAW appears as the American Engineer's unguided rocket launcher. 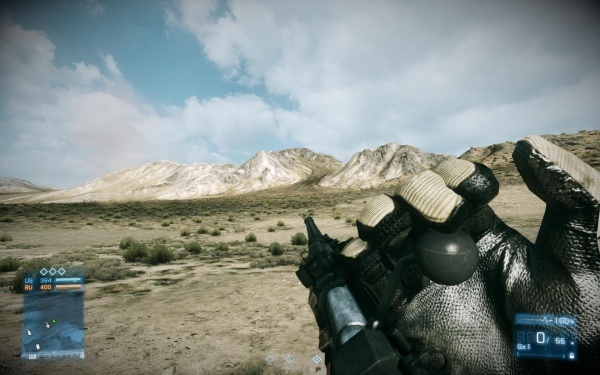 The player wields the MK 153 SMAW as he prepares to dish out some disproportionate retribution on some tumbleweeds for giving him allergies. 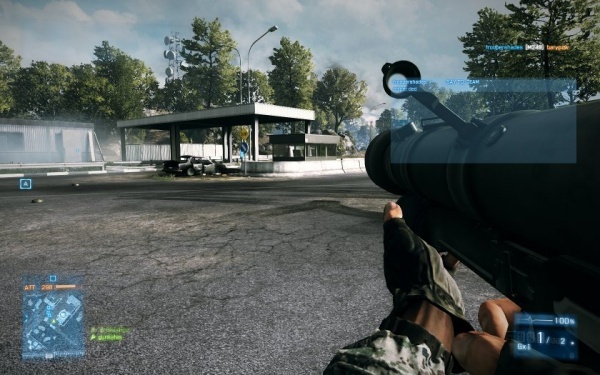 The RPG-7 is featured as the Russian Engineer's unguided rocket launcher. It incorrectly shows it as 83 mm, which a PG-VL HEAT is 93 mm. 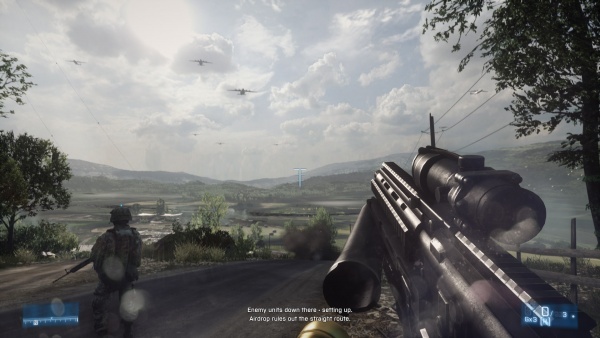 The weapon's Battlelog description states that it fires "GP-7VL" rocket propelled grenades, presumably a corruption or a typo of PG-7VL, even though the in-game weapon uses PG-7V grenades. Practically invisible in his well-planned cover position, an Iranian soldier with an RPG-7 plots his next move, apparently oblivious to the 70-ton American tank lurking close by. 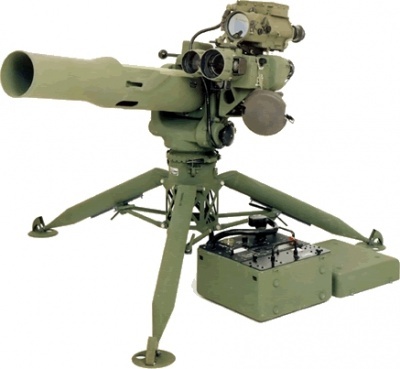 The SA-7 Grail appears as the Russian Engineer's anti-air launcher, misnamed as an SA-18 Grouse (Russian: 9K38 Igla). 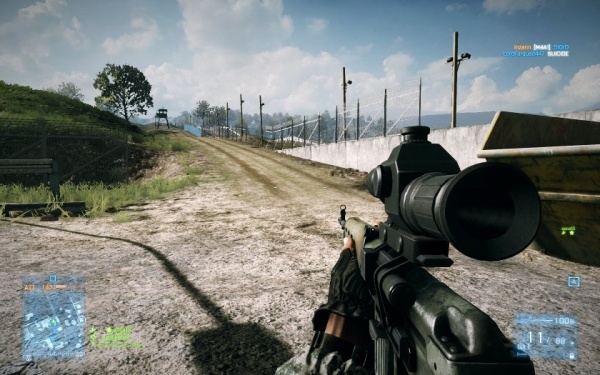 As in the previous Battlefield games the name is given as "SA-18 Igla", using the US designation, but the Russian nickname. 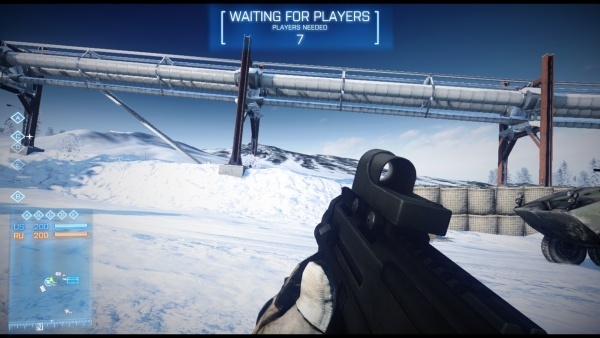 In-game render of the SA-7. 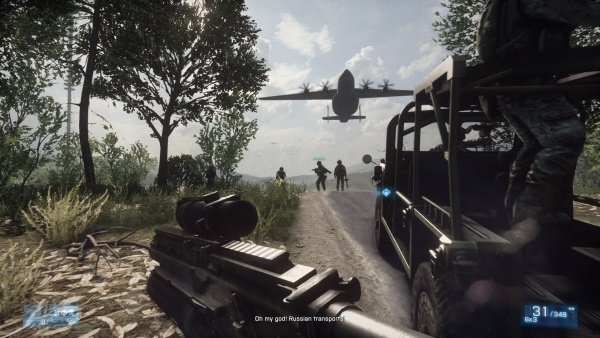 The player character holds an SA-7 in multiplayer as he wonders whether a checkpoint office counts as a vehicle. 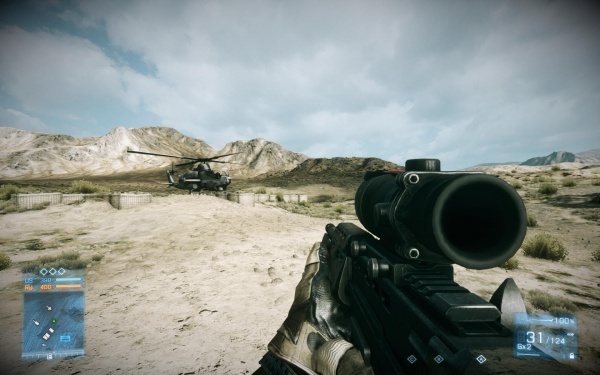 The "FIM-92 Stinger" in the game is actually an M134 training set with the rear-mounted performance indicator removed: it has "Tracking rainer" written on the gripstock unit (apparently referenced from a photograph where one T was not visible), a blue marking on the BCU well, and has a training battery that projects clear of the underside of the gripstock fitted instead of a normal BCU. 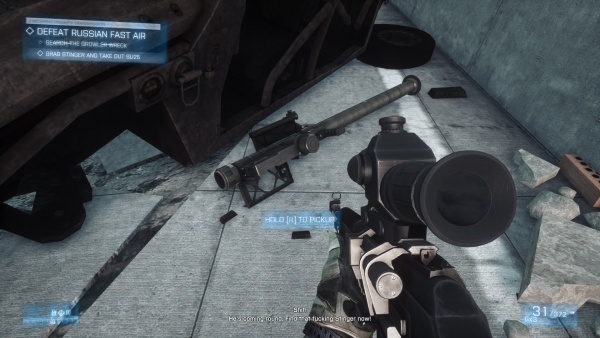 It appears as the American Engineer's anti-air launcher. 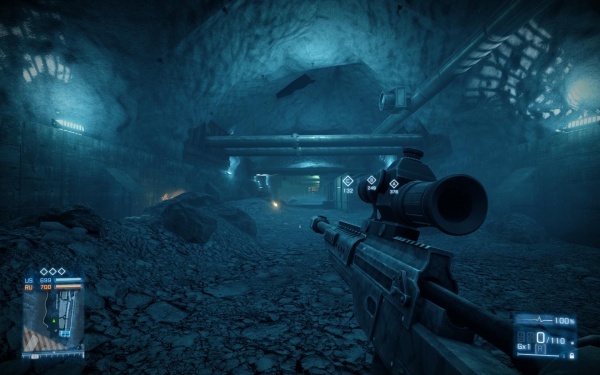 A Training Set with an infinite number of reloads is also found in the singleplayer mission "Rock and a Hard Place." 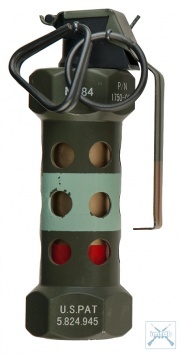 Amusingly, the "TRACKING RAINER" mark was later copied onto fake Stinger missiles fabricated by a group of Ukrainian separatist rebels, the Lugansk People's Republic, in 2015, who claimed these "weapons" were proof that the United States had been supplying military aid to the Ukrainian government. Finding himself under attack from an Su-25 "Frogfoot" ground-attack plane, Blackburn searches the wreckage of an M1161 "Growler" ITV. Thankfully, the Stinger stunt double is apparently made of stronger stuff than the light vehicle which exploded with it inside. 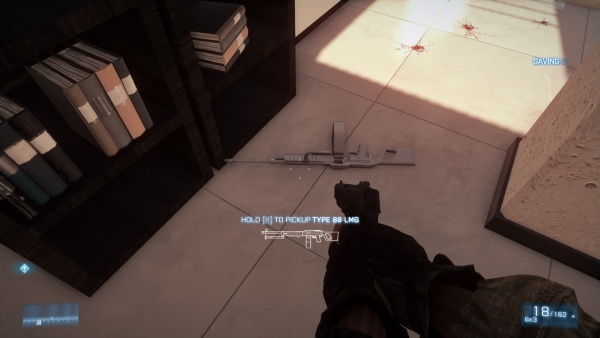 The weapon resting on its unfolded IFF antenna cannot be good for it. Note the training battery projecting from the bottom of the gripstock. 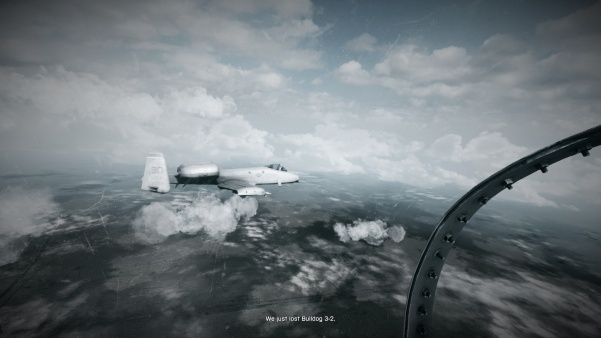 ...before sighting up the Su-25 and locking on, struggling not to go blind. 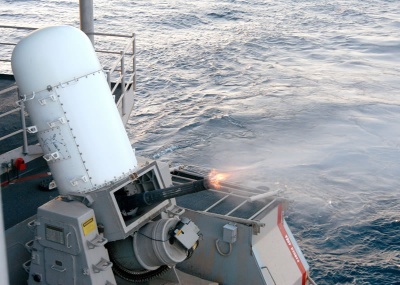 The Frogfoot, clearly taking the alleged Stinger extremely seriously, apparently decides to take its own life; while sometimes it will only start smoking after being hit, other times, as here, it will not even wait for the missile to hit it. Blackburn holds another "Stinger" as the Frogfoot manages one last dramatic flyby. "I regret nothing!" 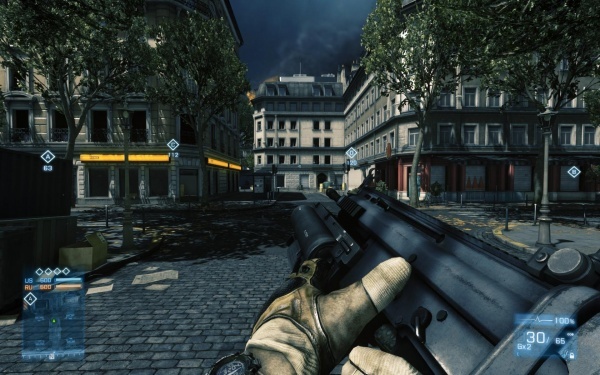 The F2000's GL1 appears on the Dog Tag awarded for 100 kills with the F2000, mounted to the rifle. 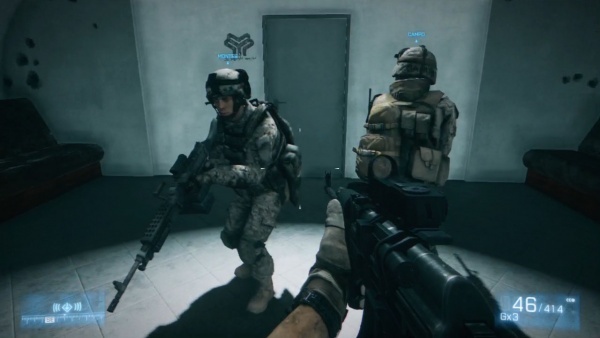 The M203 appears on three Dog Tags. The first is the Dog Tag awarded for 100 kills with the M320/GP-30 where it appears not mounted to anything, the second is the Dog Tag awarded for 500 kills with the M320/GP-30, where it appears mounted to an M16A1, and the third is the Dog Tag awarded for 100 kills with the HK416, mounted to the rifle, just like it was in the Bad Company series. 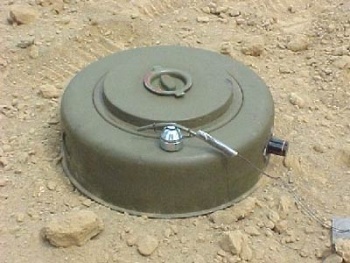 The M15 anti-tank mine can be used by the Engineer kit. 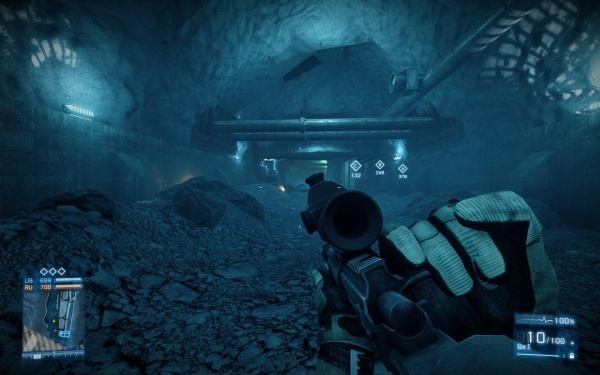 In Multiplayer mines that are placed can only be destroyed with explosives, shooting them has no effect, however Explosive FRAG rounds fired from shotguns will detonate the mine. The mine is pressure activated, meaning only something heavy like a vehicle will set it off, infantry running across will not detonate it. 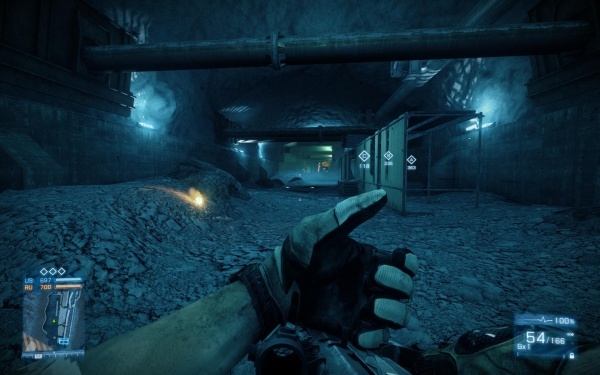 The player ponders the idea of putting AT mines inside a tire and rolling them toward a tank. 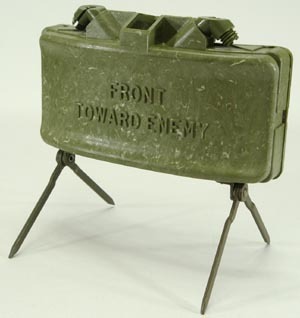 M18A1 Claymore anti-personnel mines can also be used by the Support kit. 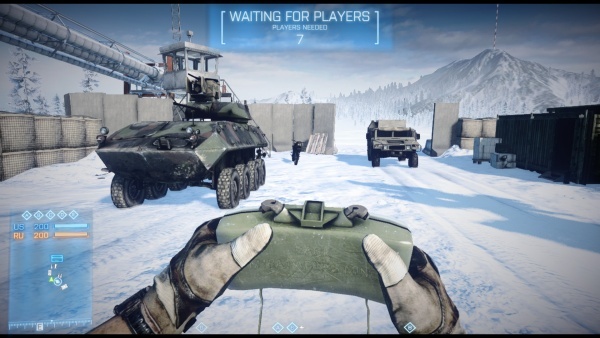 The M18A1 Claymore in the hands of a US support. 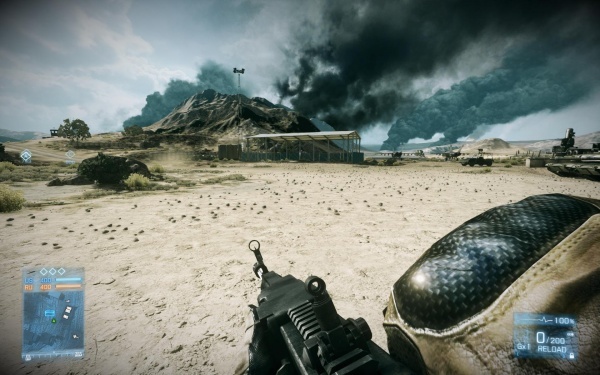 The M67 hand grenade is the primary grenade seen in Battlefield 3, used by all factions. 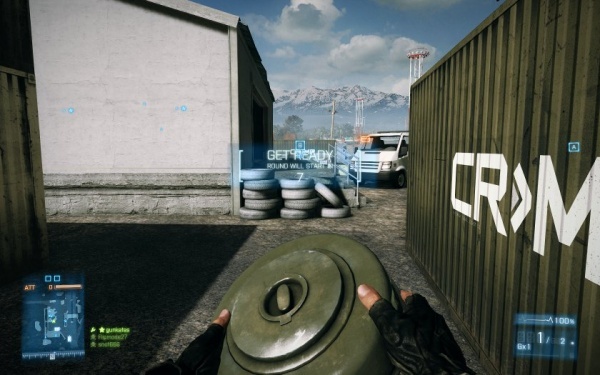 Instead of a grenade indicator, the body of the grenade flashes to make it more easily visible. 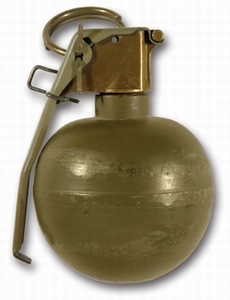 Three grenades are carried in singleplayer. In multiplayer, every kit gets one as standard, but can equip two by using the "FRAG" specialization. 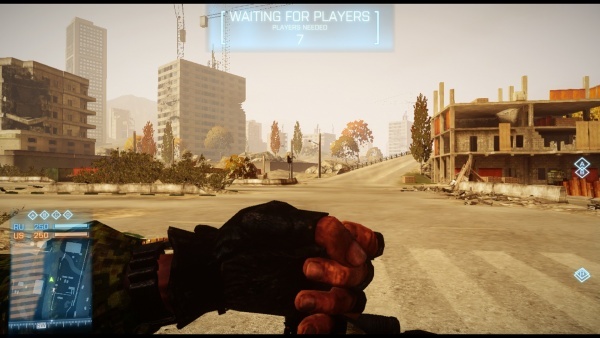 There are two ways to throw grenades; either using a hotkey or by selecting the grenade as a weapon. 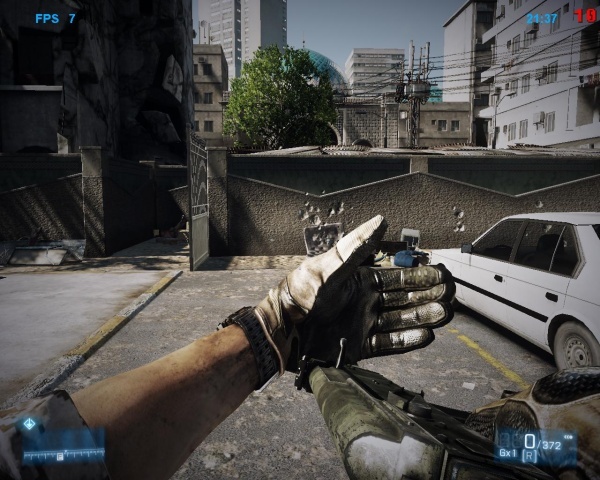 The hotkey tosses the grenade instantly then switches back to the previously equipped weapon. 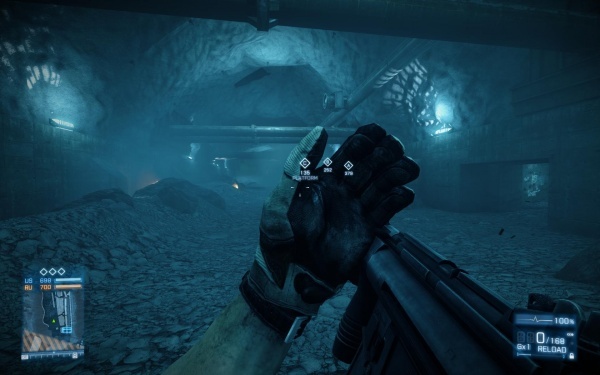 Selecting the grenade manually allows multiple grenades to be thrown one after the other, and also allows the pin to be pulled and the grenade prepared for tossing - though as the spoon is held down, this does not actually "cook" the grenade's fuse. Blackburn readies an M67 grenade. 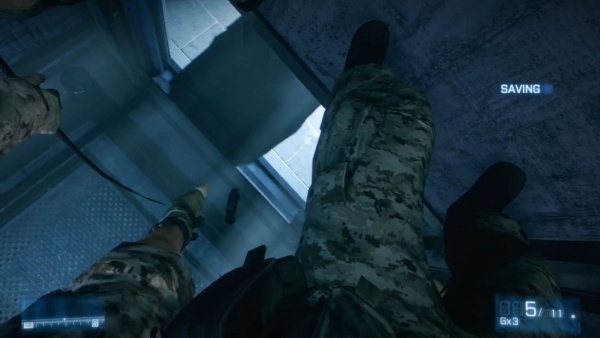 Blackburn uses an M84 stun grenade to disorient a group of PLR fighters at the bottom of an elevator shaft. 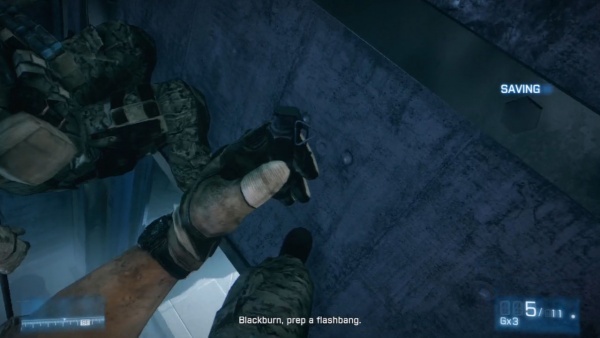 Blackburn, after managing not to fall to his death while rappelling down an elevator, readies an M84 "flashbang" grenade. Blackburn throws the grenade. 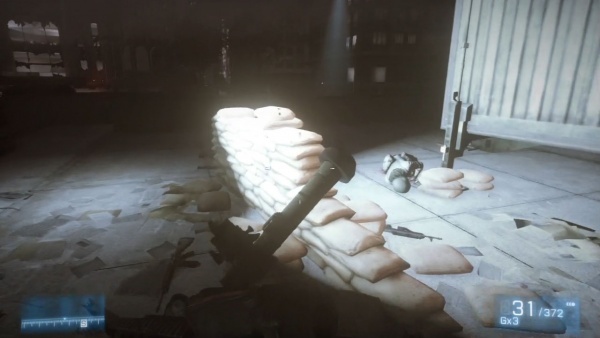 This frame and the next both show that, in common with many modern shooters, the thrown model is the same as the "in world" model for this grenade and so the safety lever is still attached. 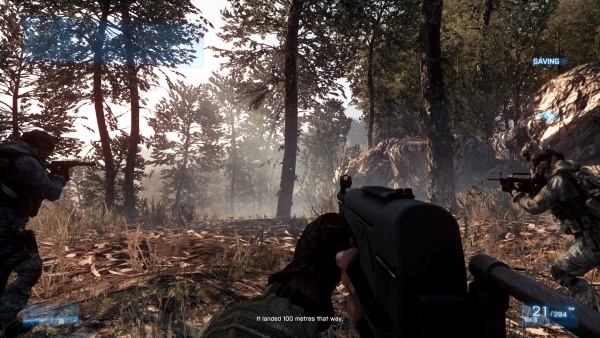 The AT-14 Spriggan appears in the game as the Russian counter to the American BGM-71 TOW mentioned below, and is also a secondary weapon on the BMP-2M APC. The AT-14 at an intersection on Caspian Border. 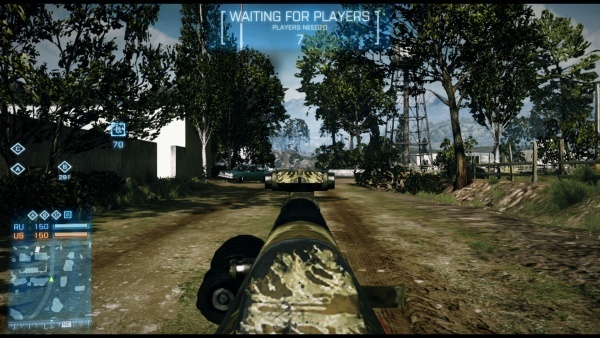 The BGM-71 TOW appears in the game as an emplaced anti-tank missile launcher for the US faction. 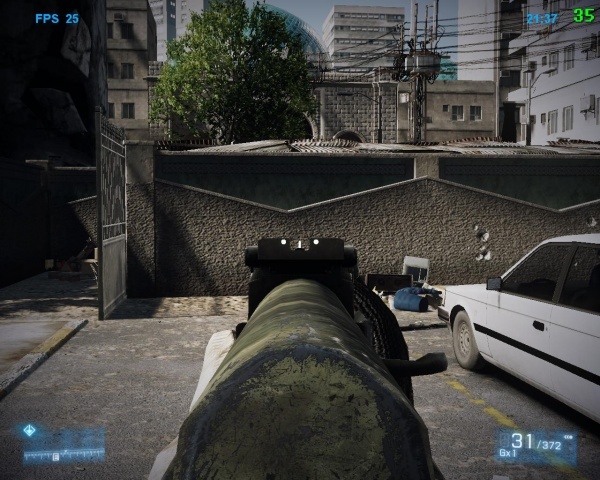 The player character in multiplayer tracks down a TOW launcher. Another view of the same launcher. 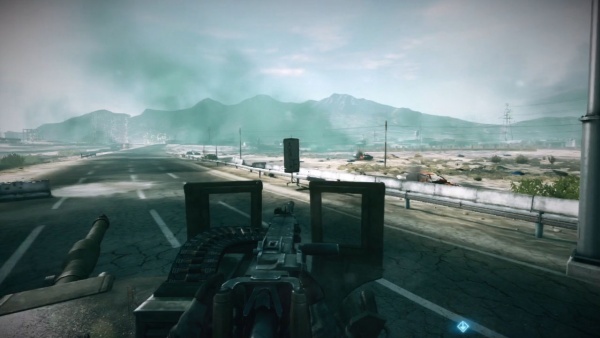 The Browning M2HB heavy machine gun appears in the game mounted on vehicles, including M1A2 Abrams tanks. 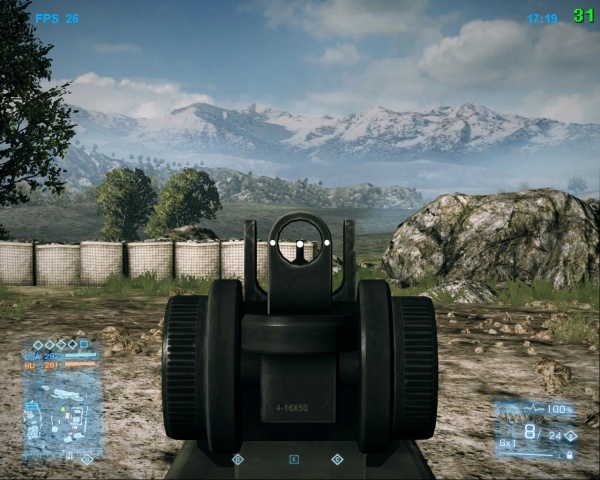 In terms of gameplay, the M2HB behaves more like a medium machine gun, requiring three or four shots to kill infantry, and dozens to disable a vehicle. 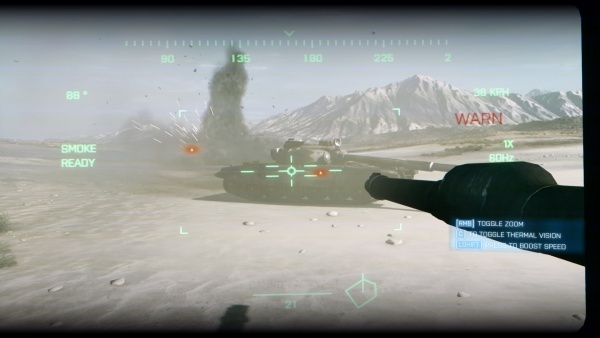 In multiplayer, M1 tanks can be fitted with an M2HB mounted above the main cannon. 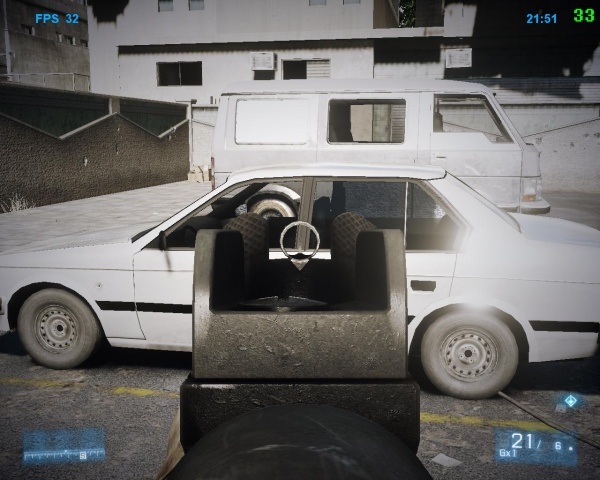 When mounted like this, the M2's rate of fire slows to about 400rpm but gains a damage bonus that puts its power more in line with its real life counterpart. 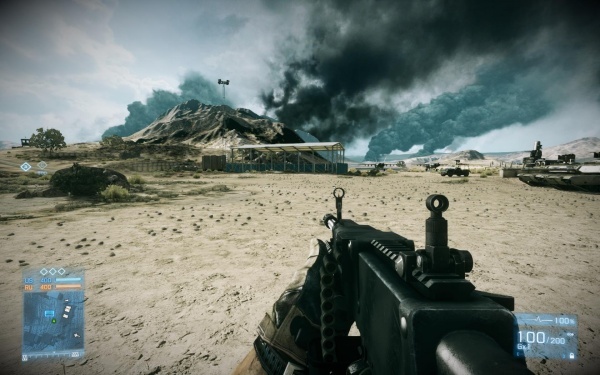 These changes were likely made to keep heavy machine guns from being overly powerful compared to other weapons. At the end of "Uprising," Blackburn takes control of an M2HB mounted on a Humvee as he defends a landing zone until a V-22 Osprey can extract the scattered Marines. Near the end of "Thunder Run," Sergeant Jonathan Miller mans his tank's .50 cal. 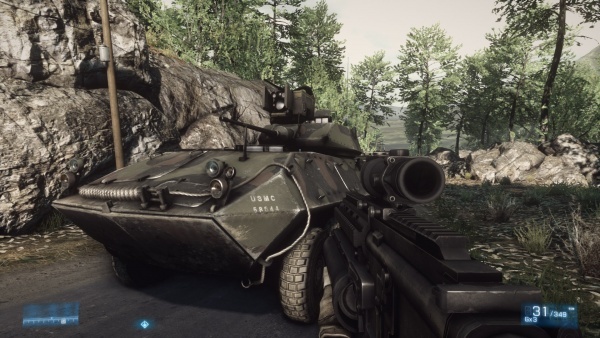 It seems in the game's fiction the US Marine Corps has upgraded their Abrams tanks, since Anvil 3 is an M1A2, currently used only by the US Army. 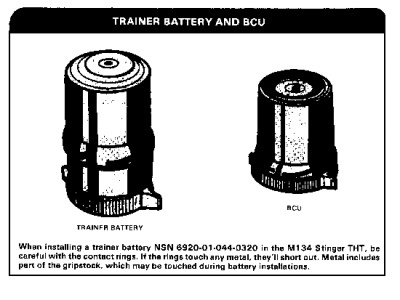 Note the TUSK gunshields for the missing loader's M240 are instead fitted to the M2. A M2HB mounted on M1161 "Growler" ITV. Mountings for the DShK heavy machine gun can be seen on Iranian Type-72Z main battle tanks, modernised versions of the Russian T-55. These tanks seem to have been modelled from museum display vehicles, since the gun itself is missing from the mounting. An Iranian Type-72Z shows off the DShK it conspicuously does not have. 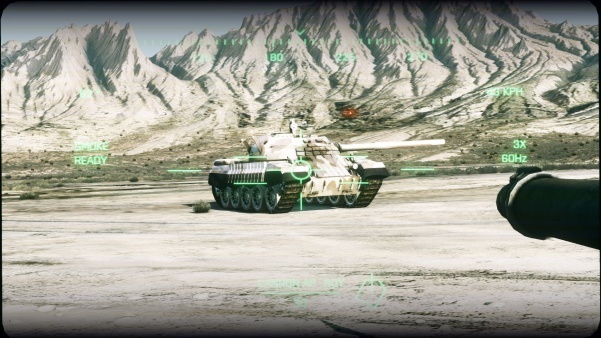 Note the border at the edge of the screenshot is authentic, intended to display the edge of the Abrams' display screen as the vehicle moves around. 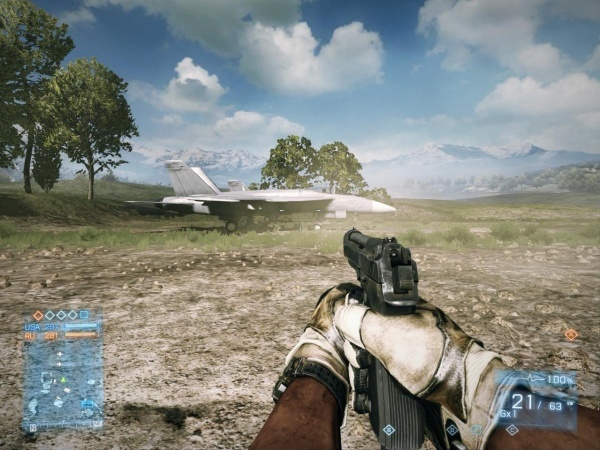 The General Electric GAU-8/A Avenger appears in the game as the secondary armament of the A-10 Thunderbolt II ground attack jet. 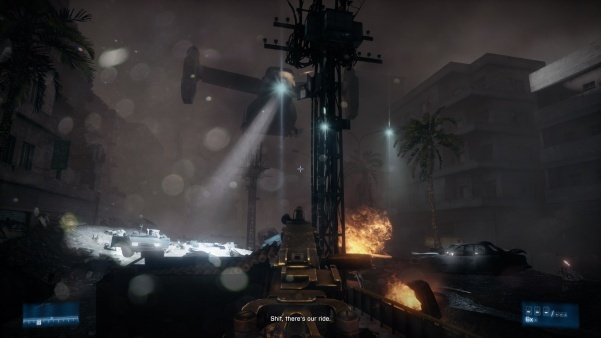 The A-10 is not playable during campaign mode, but can be piloted in certain multiplayer maps, wherein the A-10's GAU-8/A is devastating against soft targets caught in the open. Jennifer Hawkins looks out at an A-10 Thunderbolt II armed with a GAU-8/A during the mission "Going Hunting." 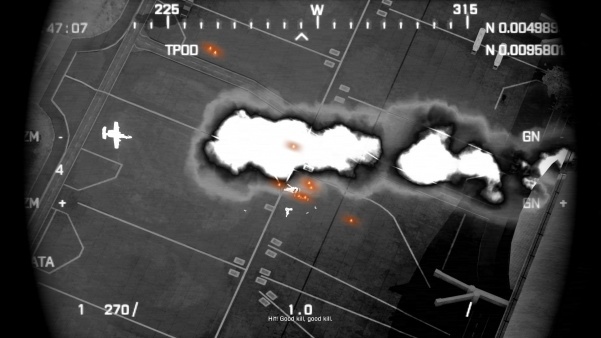 Later in the mission Hawkins gets to call in gun runs from the A-10, here shown on thermal imaging. 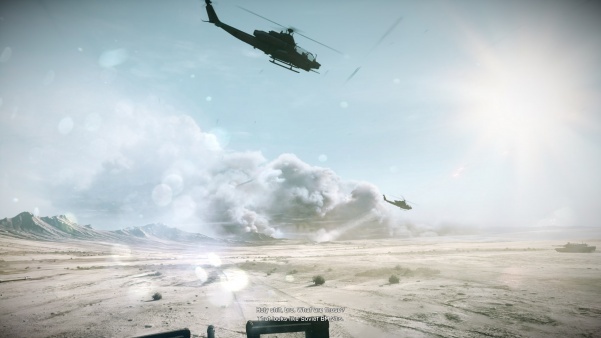 The GE M134 Minigun is seen mounted on AH-6 Little Birds in both single and multiplayer. 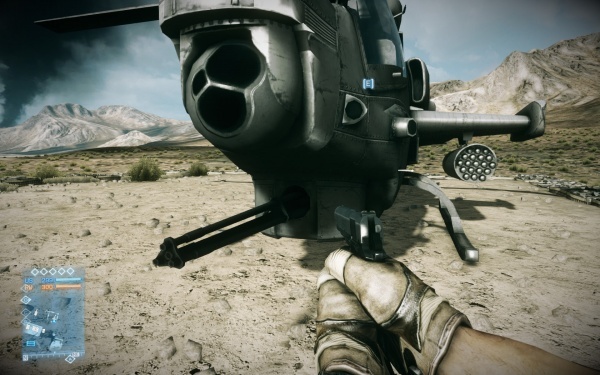 An AH-6 "Little Bird" opens fire with its M134 minigun. 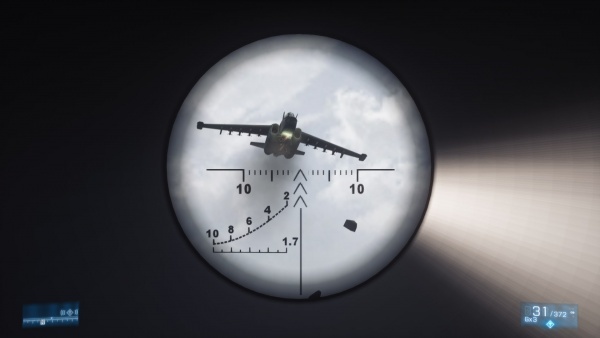 Note that tracers are treated as solid by the engine, meaning the underside of what should be a bright light source is shown in shadow here. This is only really visible in stills. 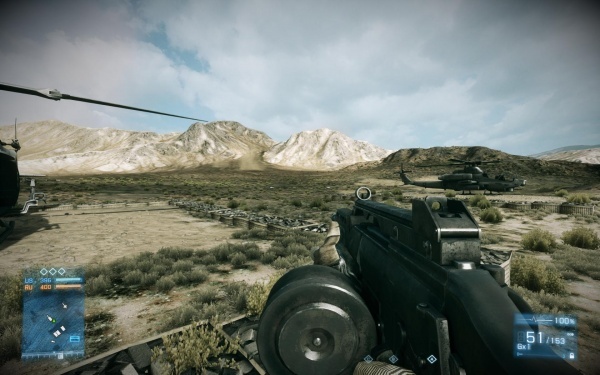 Two GAU-17/A miniguns are mounted on the sides of UH-1Y helicopters and the Russian faction's Kamov Ka-60 helicopter. 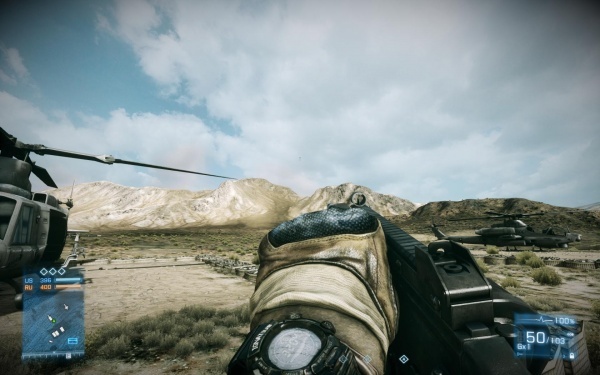 A GAU-17/A can be seen mounted on Kaffarov's private helicopter as Dmitri Mayakovsky dangles from it. 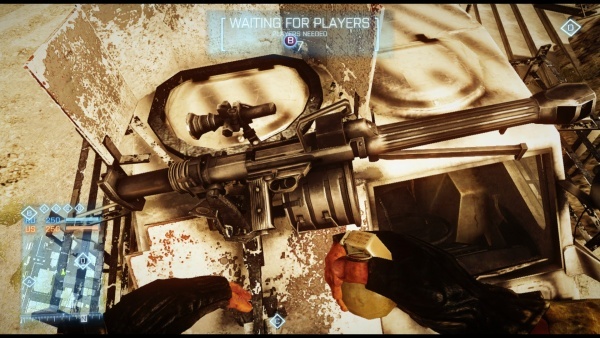 Note it has no ammo feed. 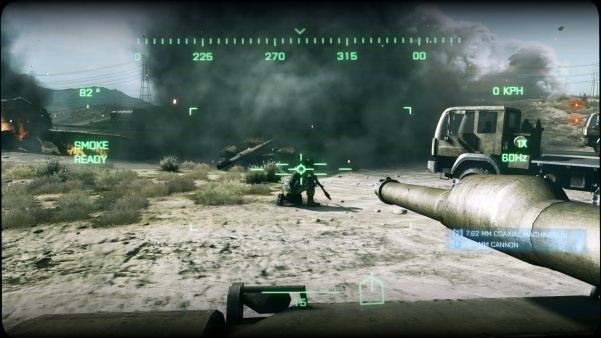 Operating the Venom-mounted GAU-17/A. Note the flight suit gloves. Looking at an idle Minigun. 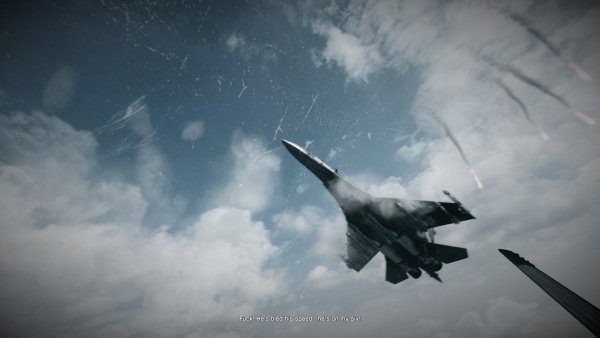 The Gryazev-Shipunov GSh-30-1 appears in the game as the secondary armament of the Su-35BM Flanker-E fighter jet. 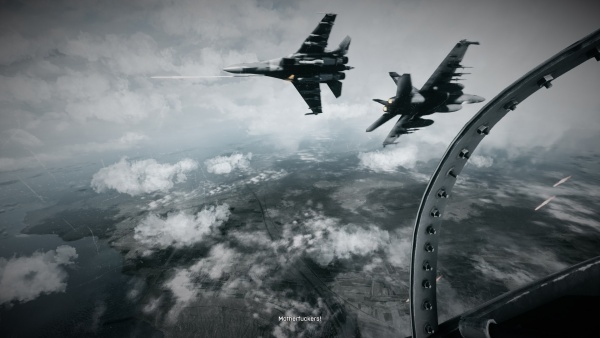 During the mission "Going Hunting," Hawkins faces several Su-35BM Flanker-E aircraft, incorrectly referred to throughout as "MiGs." This error is only present in the text in this mission; they are correctly named elsewhere in the game. ...giving Hawkins a nice look at its missile armament. 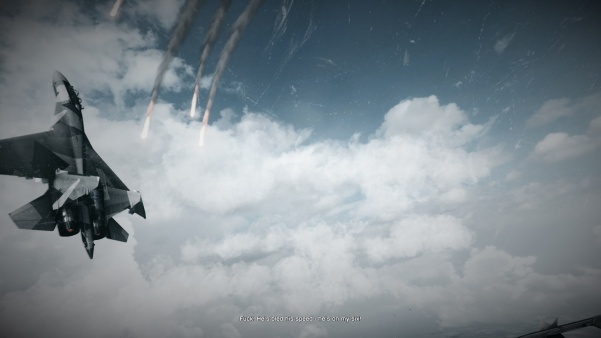 The Gryazev-Shipunov GSh-30-2 appears in the game as the secondary armament of the Su-25TM (Su-39) Frogfoot ground attack jet. A Su-39 Frogfoot ground attack aircraft flies over as Blackburn finds himself between Iraq and a hard place. It soon returns for a series of gun runs as Blackburn has to move from cover to cover to find a Stinger. The Frogfoot here is basically firing a death ray with a deadzone around pieces of cover; moving out of cover is instant death during the time that counts as its attack even if it has already flown overhead and stopped firing. The Kord heavy machine gun is mounted on the T-90A tank, Russian army buggies and Vodniks, and a number of technicals. 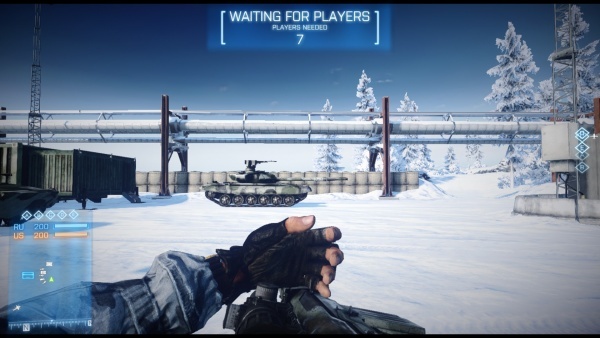 It behaves very similarly to the Browning M2HB heavy machine gun: more in line with a medium machine gun, and can be mounted on a T-90 with a lowered rate of fire but higher shot-for-shot damage. Blackburn looks over a Kord machine gun mounted on a technical. He soon discovers the hard way that manning a Kord during an earthquake is a bad idea. 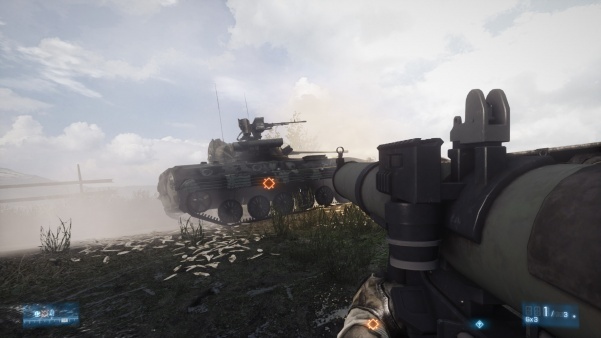 A T-90 MBT opens fire with its main gun, the massive muzzle flash illuminating the commander's Kord heavy machine gun. 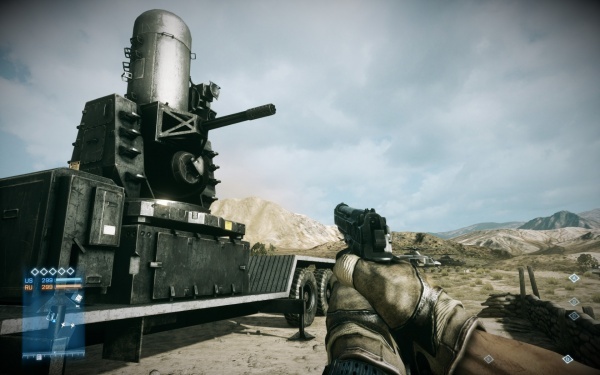 The tank is used by the Iranian Army, presumably supposed to have been purchased at some point between the game's release in 2011 and the distant future setting of 2014 when the storyline takes place. Real-life Iran apparently did not get the memo and still does not operate the T-90. 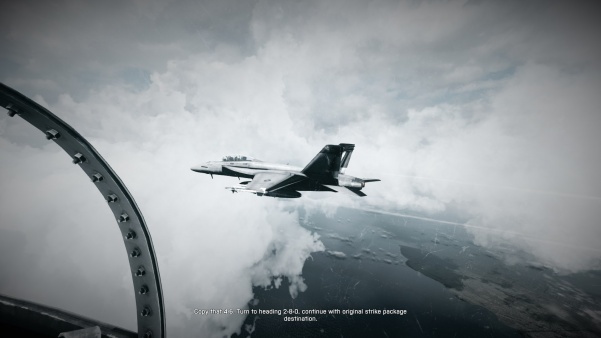 The M61 Vulcan appears in the game as the secondary armament of the F/A-18E and F/A-18F Super Hornet fighter jets. 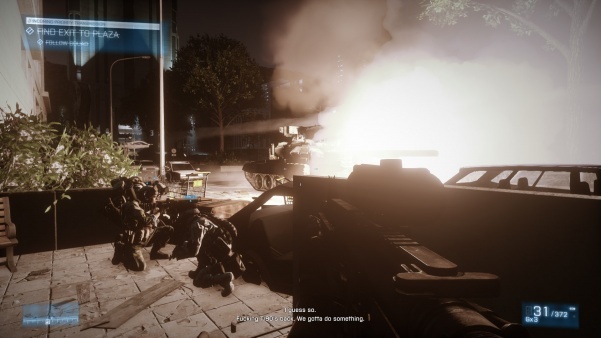 M61s are also seen in Phalanx installations on American warships, and in multiplayer the US base is protected by a land-based Phalanx C-RAM installation. 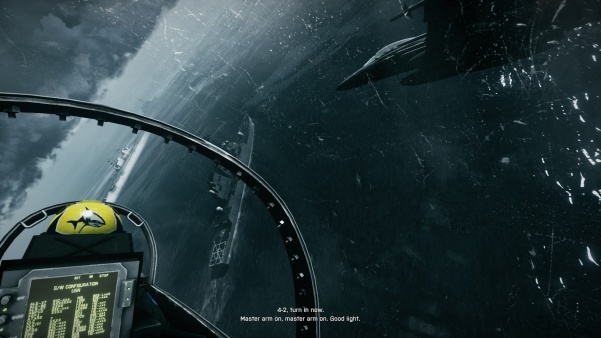 It should be noted that the game's campaign mode incorrectly shows the Hornet's M61A1 as being operated by the WSO, when in reality the gun is operated by the pilot. In the mission "Gone Hunting" the player character is Lieutenant Jennifer Hawkins, WSO of an F/A-18F "Super Hornet" callsign Shark 4-6 assigned to CVN-77 USS George H.W. Bush. Hawkins climbs up to the deck of the USS George H.W. 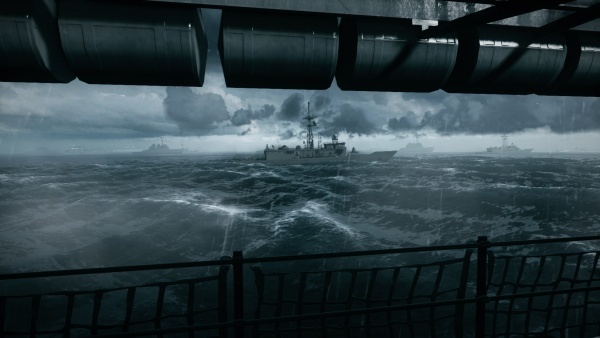 Bush, spotting the USS Ford (FFG-54), an Oliver Hazard Perry-class frigate in the distance. 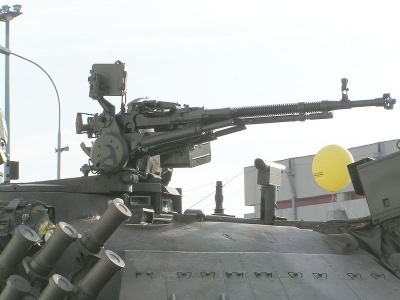 This incorrectly mounts bow and stern Phalanx installations; while a later block upgrade added a forward gun over the removed SM-1 missile launcher of nine of the Perry-class, this is a Mk 38 Mod 2 (a remote-controlled navalised M242 Bushmaster chaingun), not a second Phalanx. The two Hornets Shark 4-2 and Shark 4-6 overfly the US fleet, giving plenty of glimpses of Phalanx installations on the various ships. A close up look at a land-based Phalanx C-RAM in multiplayer. 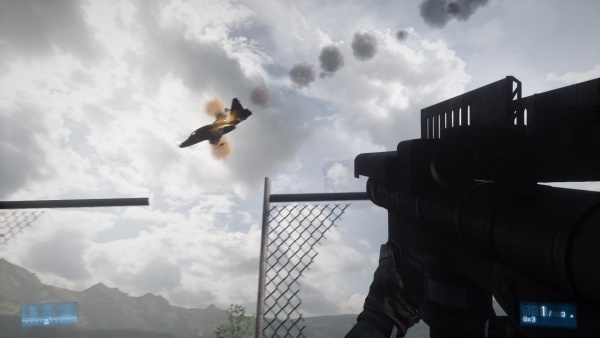 The M197 Vulcan appears in the game as the secondary armament of the AH-1Z Viper attack helicopter. Miller looks up at a pair of friendly AH-1Z Vipers during the mission "Thunder Run." 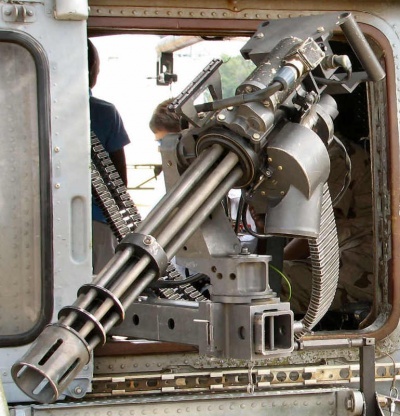 A closer look at an AH-1Z Viper's M197 Vulcan cannon. 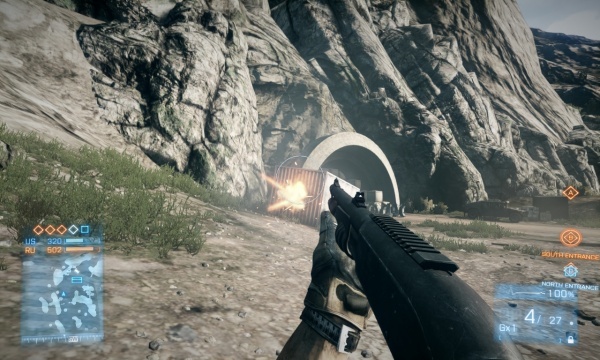 The GAU-12/U is the main gun on the LAV-AD in multiplayer. It should be noted that the LAV-AD itself is technically anachronistic as it has been removed from service. 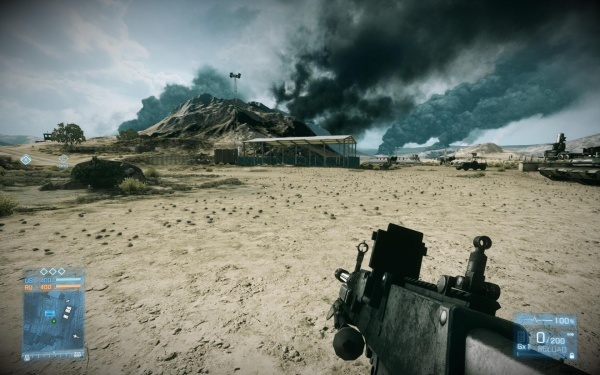 The GAU-22/A appears in the game as the secondary weapon of F-35B Lightning II aircraft on some multiplayer maps, such as the revamped version of Gulf of Oman. 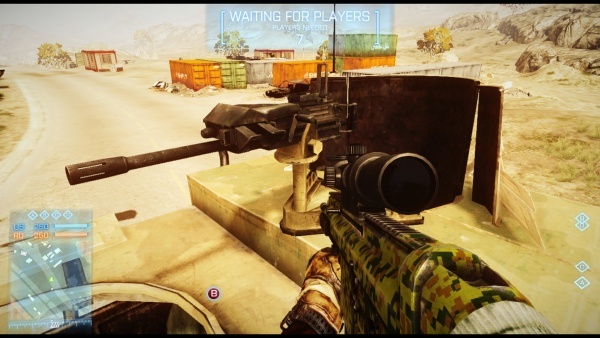 The M240C machine gun is coaxially mounted on the M1A2 Abrams MBT. Miller runs back towards the tank column after retrieving the "clicker" trigger for an M58 Mine Clearing Line Charge. 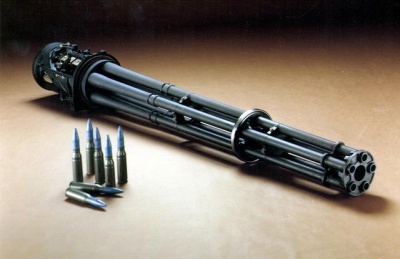 The M242 Bushmaster chaingun is the main gun of the LAV-25. Blackburn and his fellow Marines get out of their own LAV-25 and look over someone else's at the start of "Operation Swordbreaker." Blackburn looks over another LAV-25 during the mission "Rock and a Hard Place." The Mk 19 grenade launcher is seen mounted on M1114 Humvees and AAVP7A1 amphibious transports. Miller looks over an AAVP7A1, mounting an M2HB and a Mark 19 grenade launcher in the commander's mini-turret. 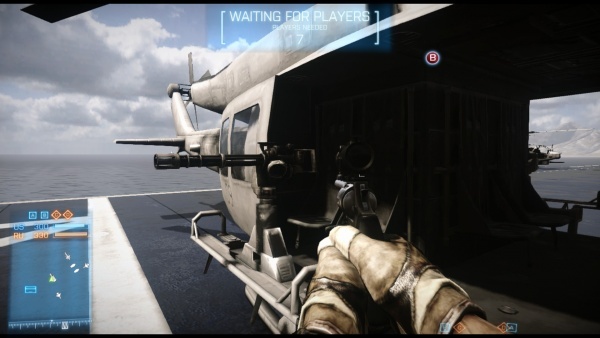 Manning the Mark 19 on the "Phoenix", a post-apocalyptic Humvee that is part of the Aftermath DLC. Note the lack of hands and any ammo. 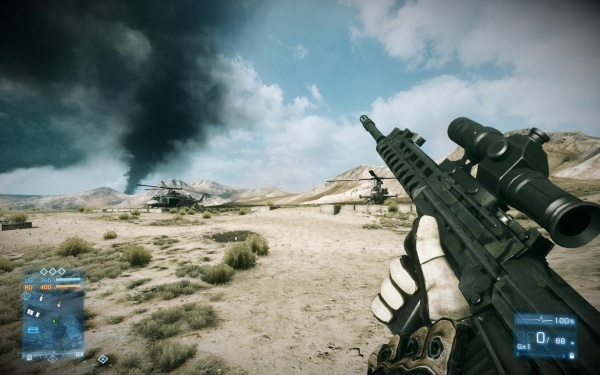 Looking at the Mk 19 with a SCAR-L rather ridiculously equipped with a 12x scope. 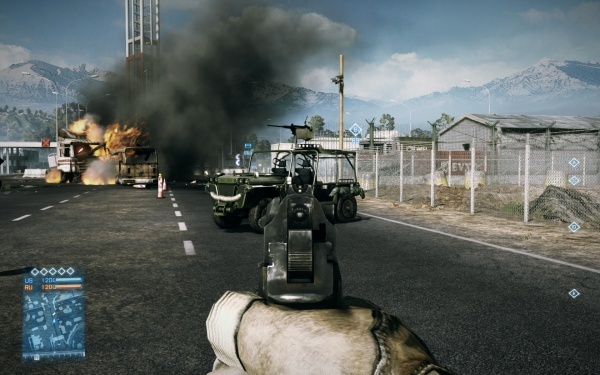 The Norinco QLZ-87 appears in the Aftermath DLC, mounted on the Russian "Barsuk" (Badger) modification of the GAZ 3937 Vodnik truck. 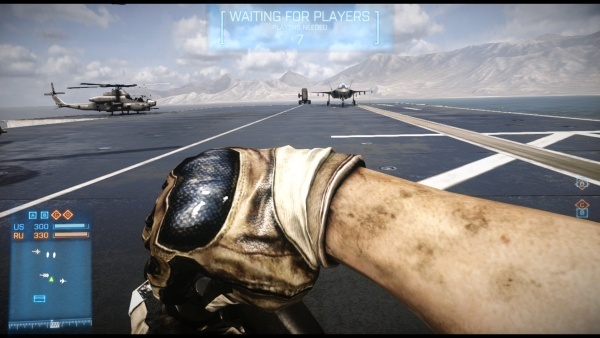 Operating the "gangsta style" pistol grip of the QLZ-87 on the ramshackle GAZ 3937. 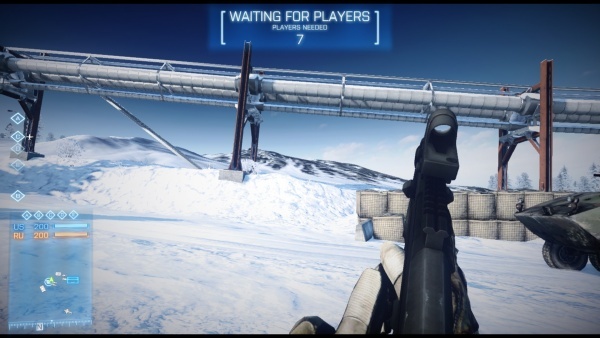 The scope is not usable. 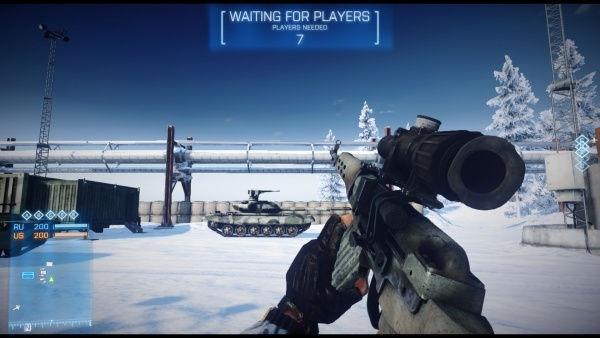 The PKT machine gun is coaxially mounted on the T-90A and T-72 MBTs. 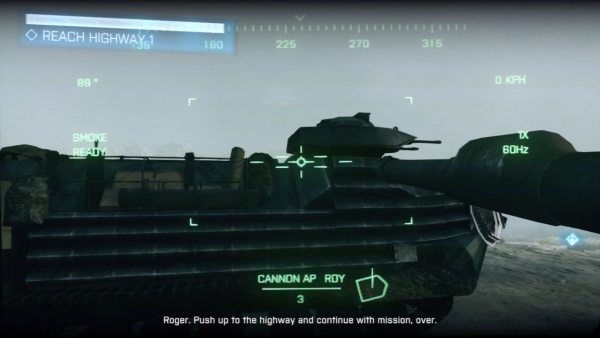 Miller gets a little too close to an Iranian T-72. The coaxial gun on the T-72 is mounted to the right of the main gun; the view is blocked from most angles (including this one) by the searchlight mounted next to it. The Shipunov 2A42 appears in the game as the main gun of the BMP-2M and BTR-90 APCs, and the secondary armament of the Mi-28 Havoc helicopter. Blackburn advances on a BMP-2M during "Rock and a Hard Place," the IFV seemingly oblivious to his dastardly rocket-launching ambitions.